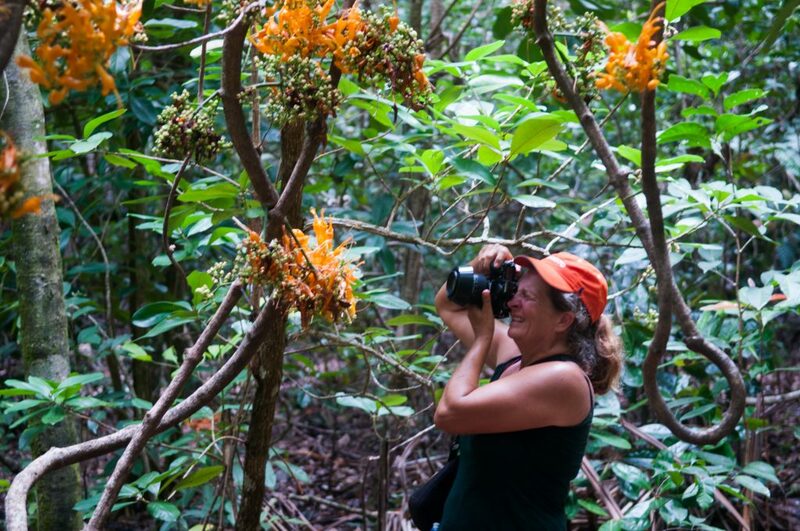 Before we post anything further we have to clarify that although I do most of the writing, Denny does all of the photo editing and we both are contributors to the pictures as we both love toting our Nikon cameras around. So the blogging work is shared. 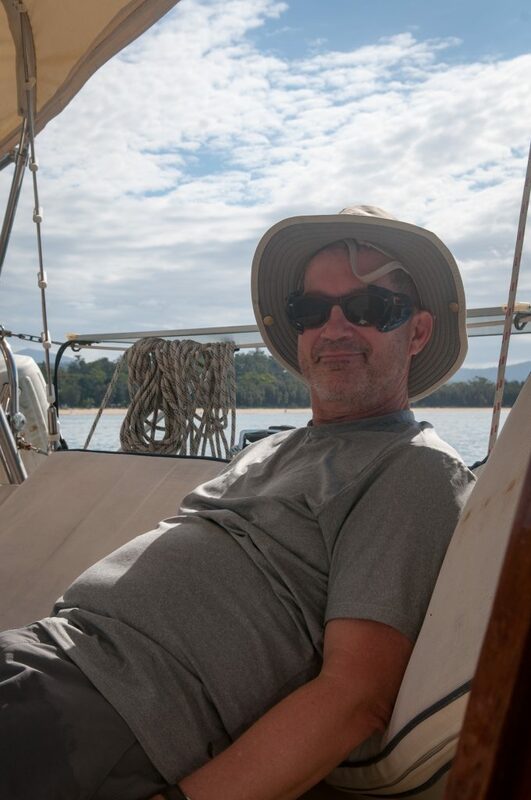 After arriving in Australia we left the boat on the hard at “The Boat Works” and flew to North America to be with family for the Christmas holidays. 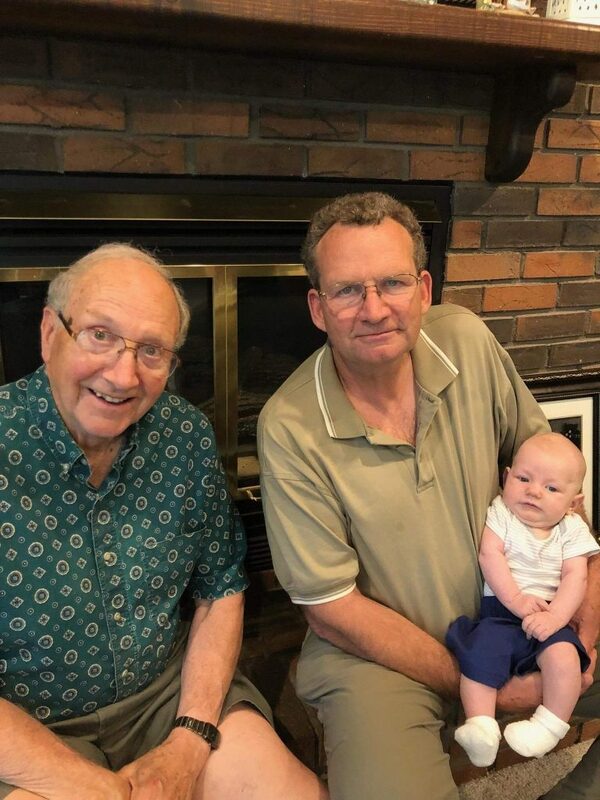 This means that I am in Ontario, Canada and Denny is somewhere between South Dakota and Minnesota USA, although I did make a detour stop in South Dakota to get a little quality time with our grandson, Rhett. 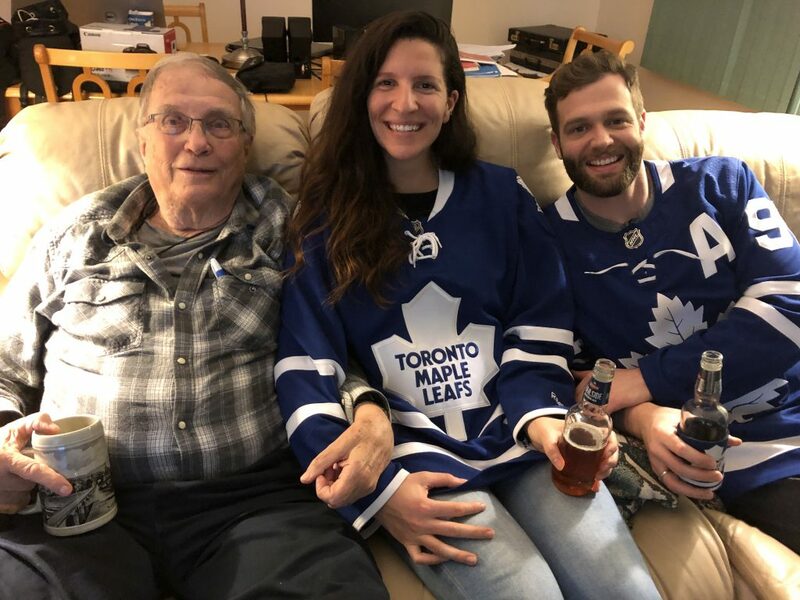 Besides the beautiful family time, which we can’t get enough of after being half a world away, I was fortunate to be able to drive across Canada with my daughter Allison. 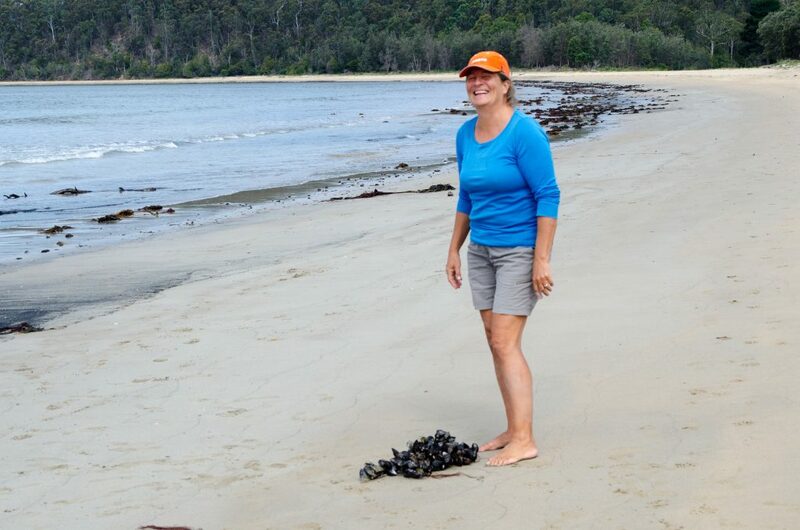 She was moving from Halifax, Nova Scotia to Port Hardy, Vancouver Island to start a new job. She needed help to move herself, her little car and her little bit of stuff to her new home base. It was quality time with my baby girl in a little car for roughly 3000 km or 1800 miles with stops along the way to reconnect with family and friends. Some of the mountain passes where a little icy and treacherous (Ally drove on those occasions) but otherwise it was pretty good driving conditions considering it was middle of the winter. Allison and I can now both say we have been in Canada from coast to coast. Denny arrived in Australia a few days before me. He left from Minneapolis and I left from Vancouver, British Columbia. 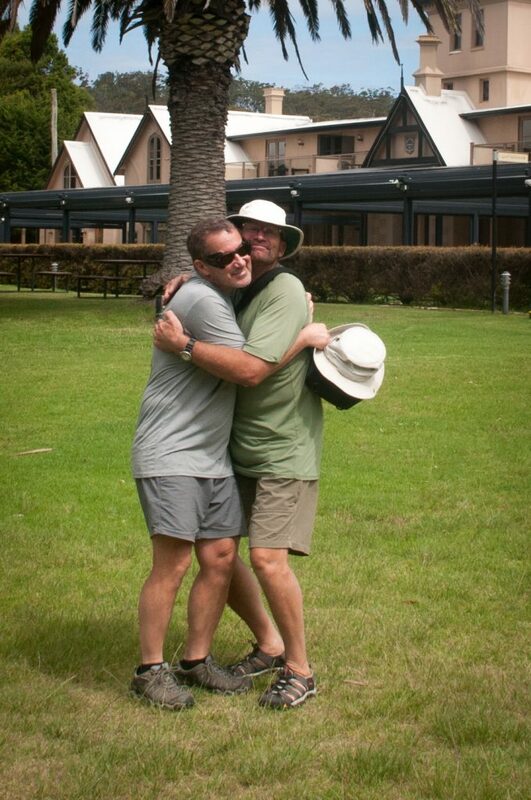 Once we were both back on the boat in Southport, Brisbane it was work, work, work. 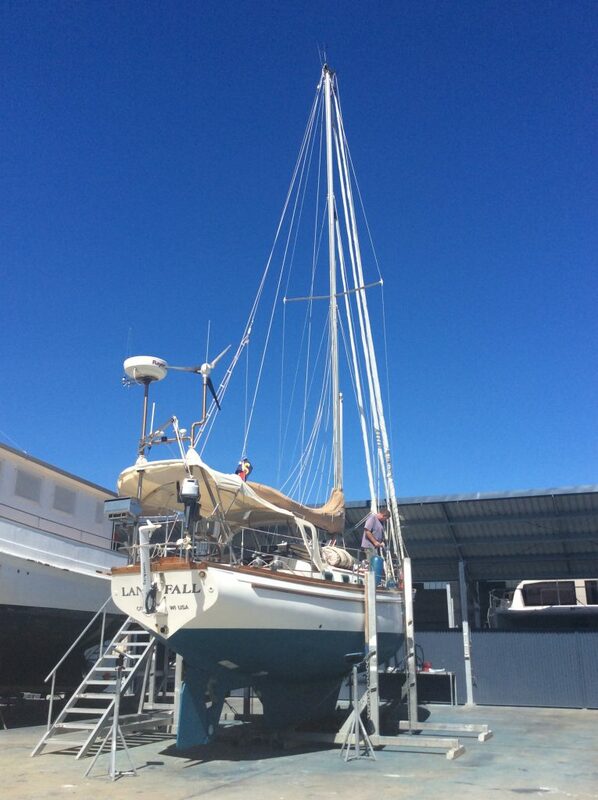 Five days of bottom painting, cleaning and getting Landfall back in the water ready for our friend Bill’s arrival. What were we thinking!! We should have postponed preparations until Bill was on board, at least for the sanding and bottom painting. We started provisioning the day Bill arrived so that he could have somewhat of a say on what we had in the pantry. 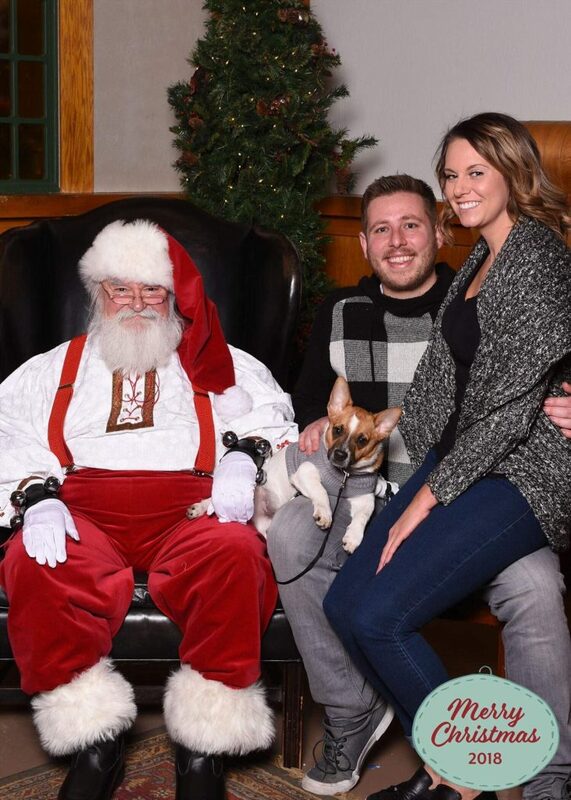 But the only thing he really asked for was hot dogs and coffee. We spent one calm day at the Muriel Henchman Park which is also where we spent our first anchorage in Australia with Bob. That was our starting point for our sail with our goal to get to Tasmania. Once we were safely berthed in the marina Denny realized that one of the cars on the sail track was broken. He managed to find a marine store and order the part with only 10 minutes left before closing. It was Friday afternoon and the part would be shipped the next day. We enjoyed the marina hot showers, had a little walk through town and found a quaint little Mexican restaurant where we had dinner. The next day Denny and Bill worked on replacing the sail track “car” and managed to fix that with some challenges. Before setting sail on our Southerly course, we grabbed a tasty burger and a fine pint of beer and we were off again. We had some strong northerly winds, found a current that helped us get to Pittwater before the prevailing southerlies hit us again. 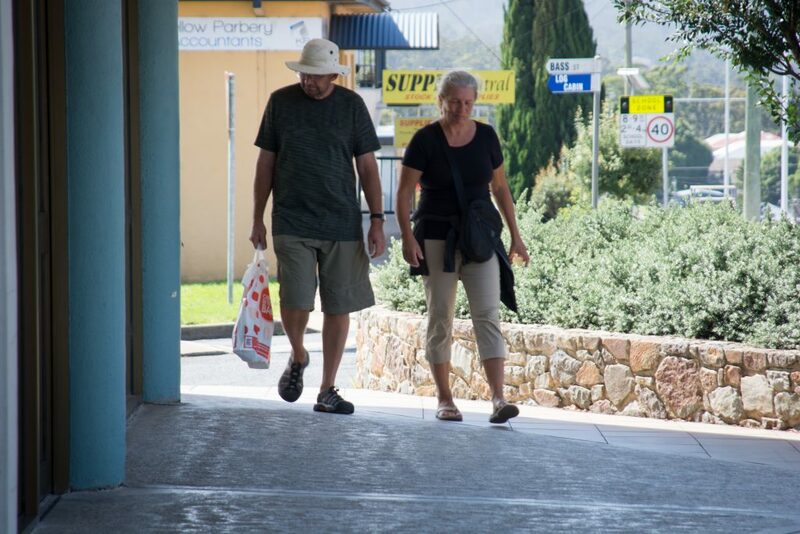 Pittwater was busy, hot and lots of activities as it was the Australia Day holiday. We spent a couple of days here, grilling hot dogs, relaxing and waiting for a weather window to keep heading South. 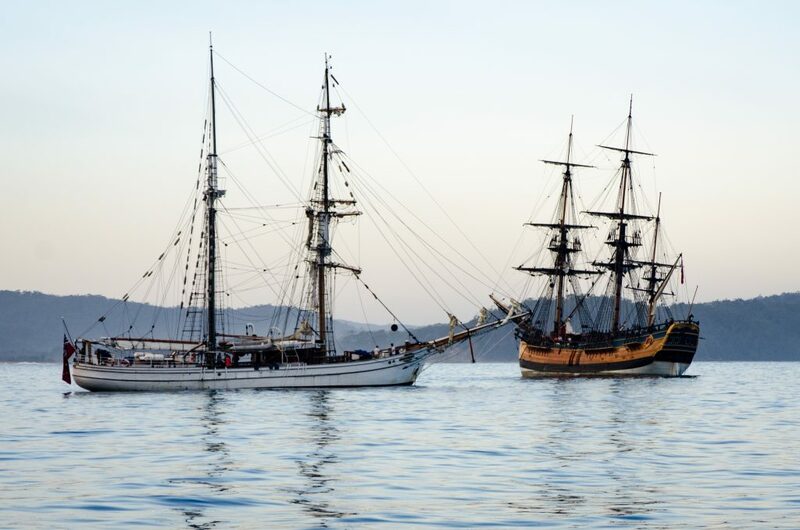 From Pittwater we sailed to Port Eden before the Southerlies made us take shelter again. This wasn’t an uneventful passage either. First we caught the monster fish!! Can’t say what it was as we never did see it but when it caught the lure on the first fishing rod it pulled on the line at great speed and I managed to clip off the top of my left hand pointer finger trying to slow or stop the drag. The HUGE tuna or marlin managed to break free but then snagged the lure on the second fishing rod and went straight down taking the lure and all the line with him. Not a fish we wanted on board anyway but it would have been nice to at least get a glimpse of the fish. We put a new lure on the remaining fishing line but forgot to tighten the drag so somewhere along the way we caught a fish that took our remaining line and lure without us even knowing about it. Before arriving in Port Eden we were hit by a thunder and lightening storm like we have never encountered before. Not the usual wind but a lightening show that lasted for hours. With each lightening bolt we were thankful that it didn’t strike the boat. And somewhere between the thundershowers we also had a squall that caught us unaware as we were sailing with the large 160 jib. We managed to sail through it but Denny had to go forward to untangle lines on the roller unit and going forward during a squall is never a good thing. 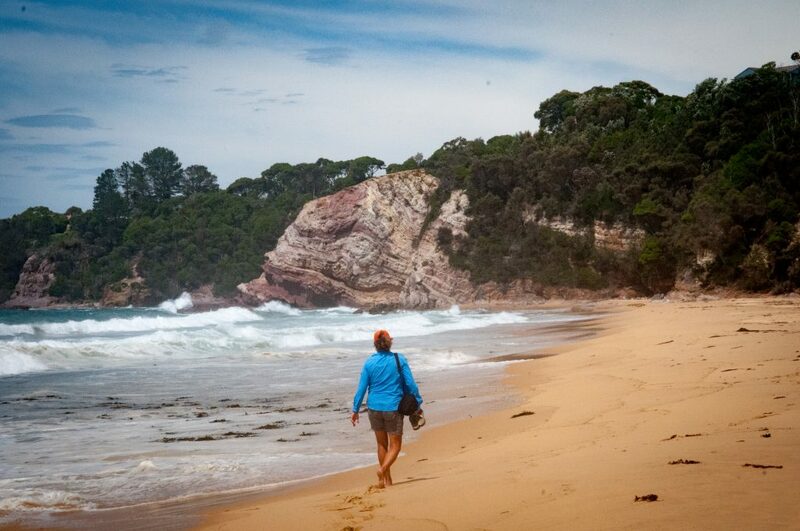 We waited in Port Eden for 10 days trying to get a weather window to cross the infamous Bass strait and finally get to Tasmania. But we didn’t just sit on the boat and do nothing. We went on daily walks, had beers at the local pubs, had some Australian pizza and socialized with some of the locals and other cruisers. We had a nice afternoon with a man who volunteered to take us into town to buy sparkplugs for our dinghy motor that was acting up. His dog, Cloe was a sheep herder but was deathly afraid of cows. We had ‘happies and appies’ with Mark and Sally on their beautiful Nordhaven 52ft power boat “Sally Forth”. They were also trying to go to Tasmania. 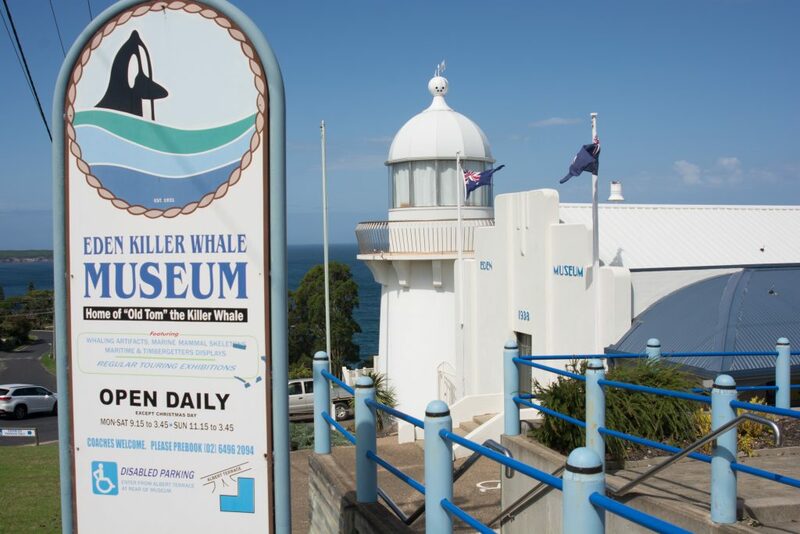 We visited the museum where we learned all about Old Tom, the killer whale. He was thought to be the leader of a pod which helped the whalers by herding the baleen whales into the bay. The killer whales were then rewarded with the tongue and lips as their share of the kill. 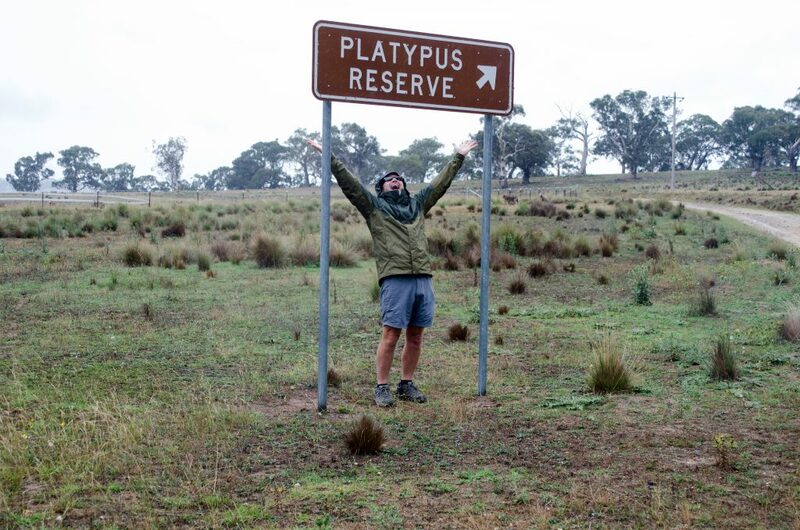 We rented a car and did some day trips in search of the elusive Platypus and Koala. Never did see either one but we did manage to come across a Wombat road kill and stopped to have a look as we were desperate to see some Aussie wildlife. In the end Bill had to get a flight to Tasmania as his time was running out and Ella (his wifey) was due to arrive soon. 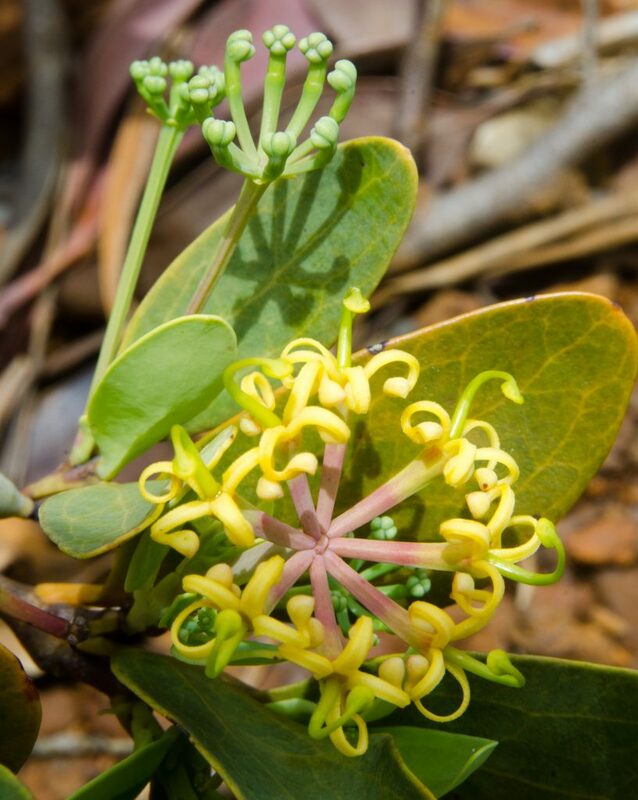 He booked flights from a nearby airport with a final destination to Burnie, Tasmania. On his last evening we had a couple of drinks on another cruising boat. It was priceless to see Bill’s face as the local sailor exclaimed he had never heard of an airport in Burnie and further more would never fly there. 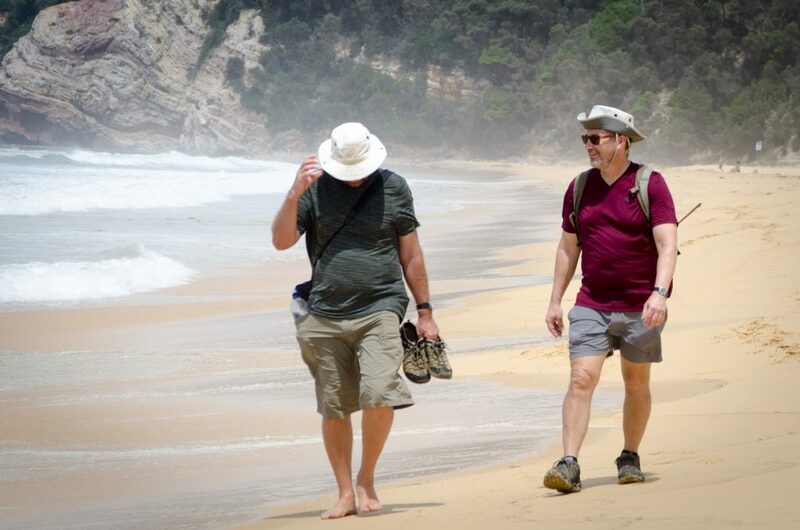 Bill grudgingly left the next day but we had agreed that if we ever got a weather window we would try and meet again in Tasmania. As it would have it, Bill inadvertently forgot his wallet on Landfall so a meeting up with them in Tassie was a definite. Goodbye Bill, see you in Tasmania!! 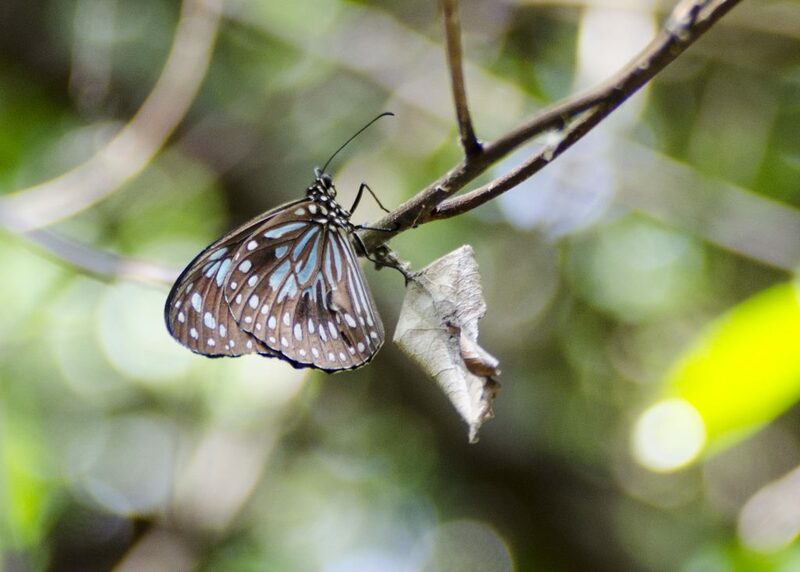 Bob arrived in Noumea after over two days of flights originally leaving from Minneapolis. He was sitting at the marina restaurant with his bags patiently waiting for us while we walked the waterfront looking for him. 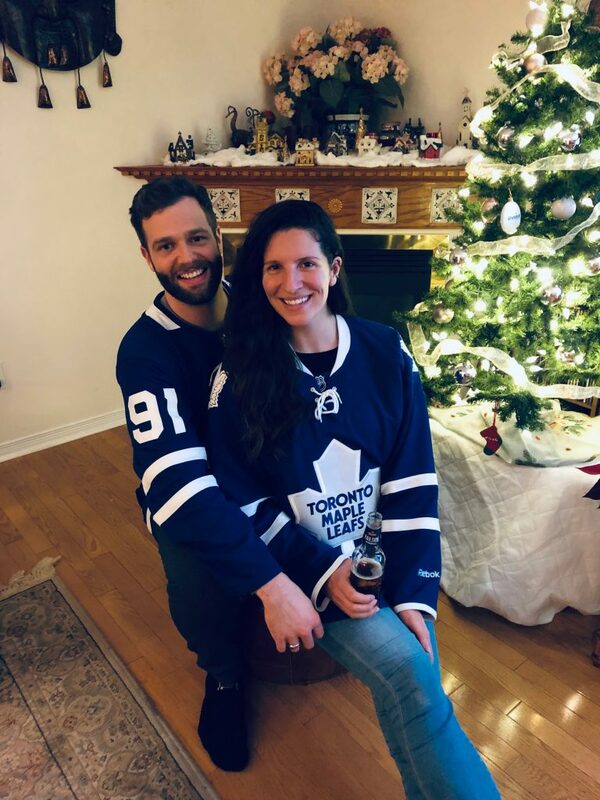 Not sure how long we kept missing each other but we finally made the connection. 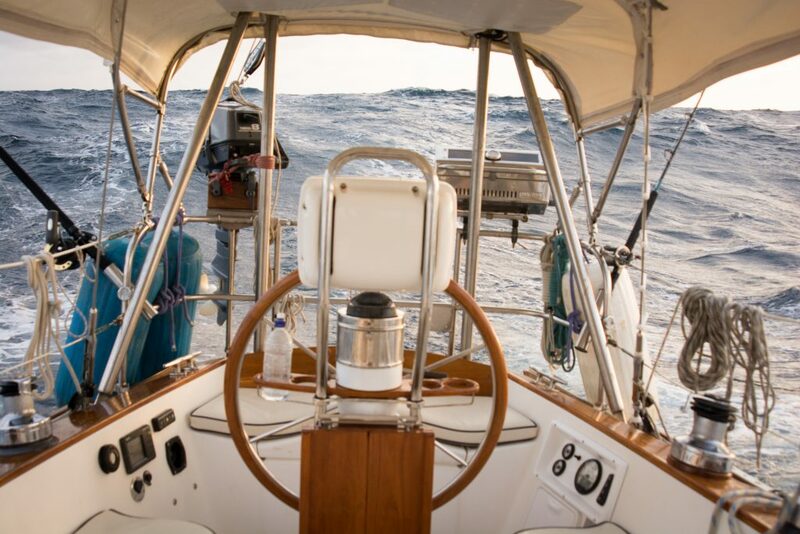 It took several trips with the dingy to fairy Bob and all his bags out to the boat, maneuvering through some choppy seas trying hard not to get Bob and all his debris wet. But that wasn’t to be and he got his first experience of wet salty clothes and life on Landfall. It was like Christmas onboard as we unpacked all the goodies Santa brought for us including peanuts, candies, salsa and lots of other treats. 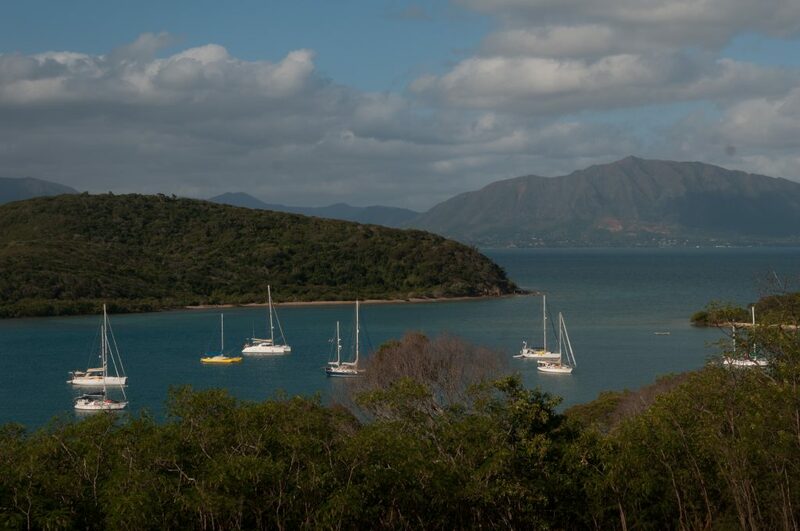 We spent that night in the rolly Noumea anchorage and then we sailed directly to the island of Mato. 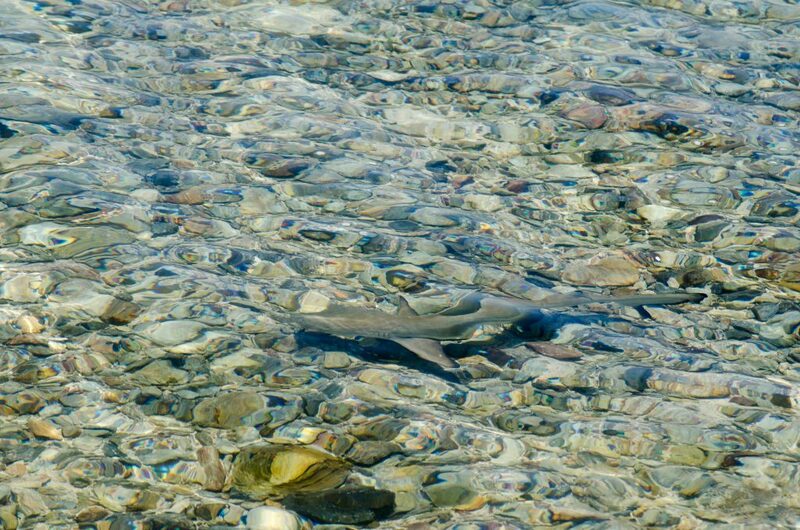 Can you spot the reef shark. We know Bob can! 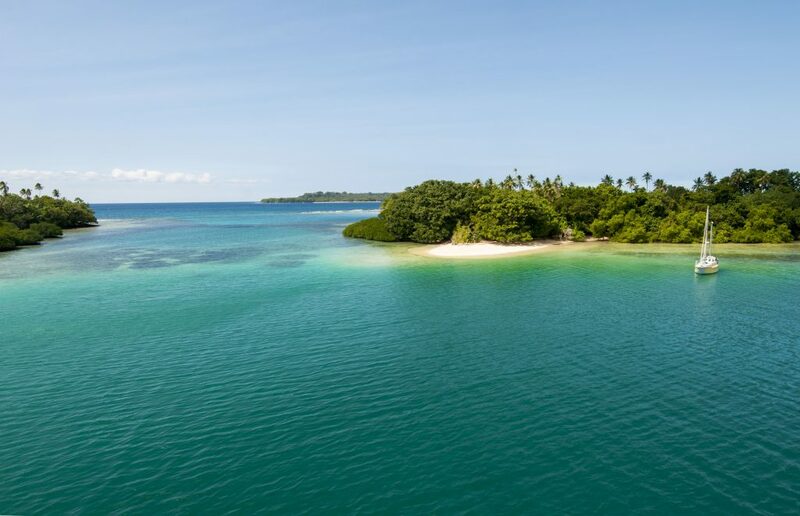 Mato is a beautiful anchorage among reefs, clear water and plenty of reef sharks. 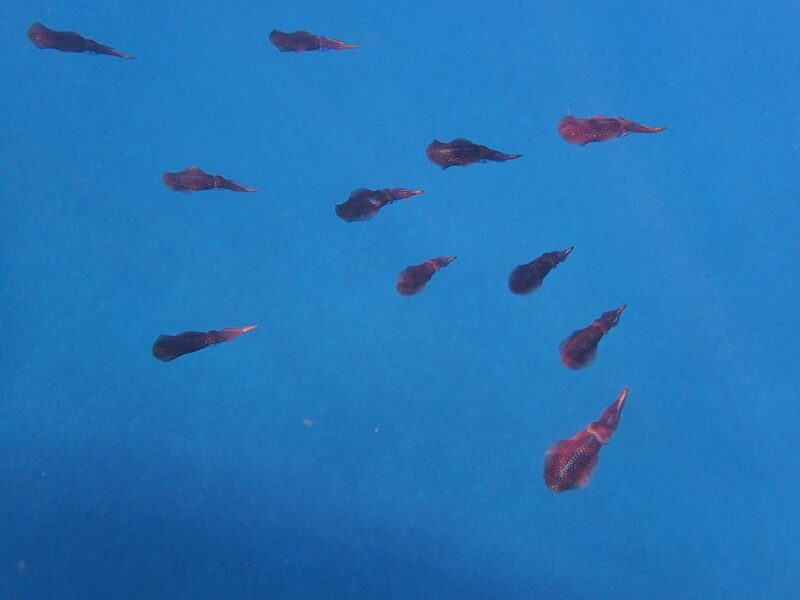 It was impossible to convince Bob to go snorkeling after the shark sighting even if it was only a little reef shark. 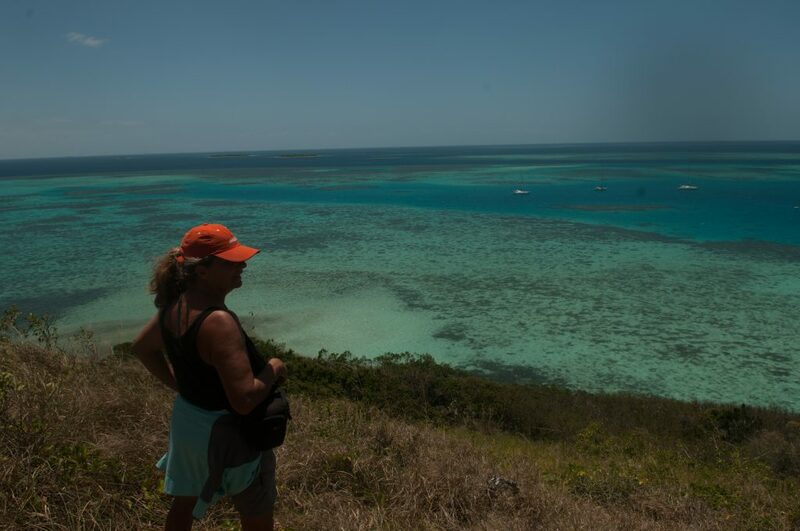 We did a quick hike to the top of Mato Island and enjoyed a beautiful view of our anchorage. 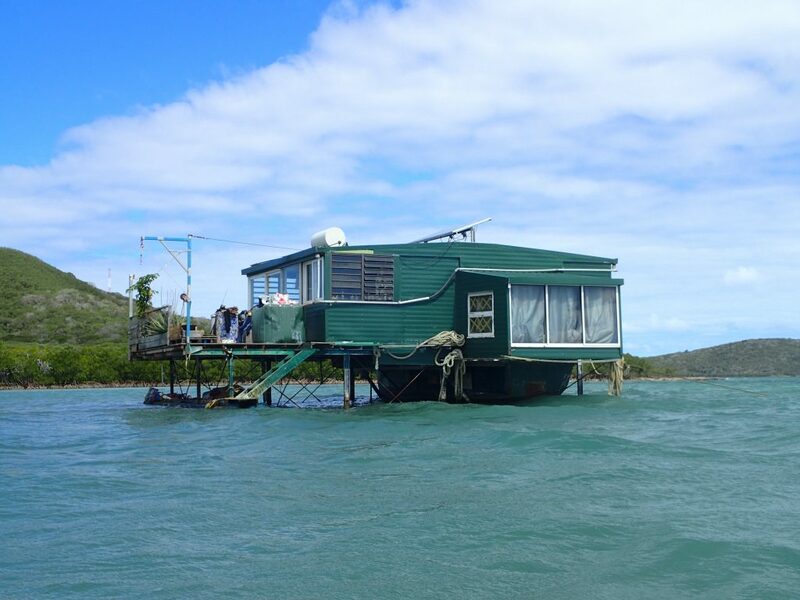 We spent the night at Mato but had to make a move as the wind was starting to get stronger and this anchorage was only protected by the barrier reef so we were getting the full force of the wind. Our next anchorage at Ile Ouen was totally different. The water was murky and we were surrounded by red, mountainous terrain. 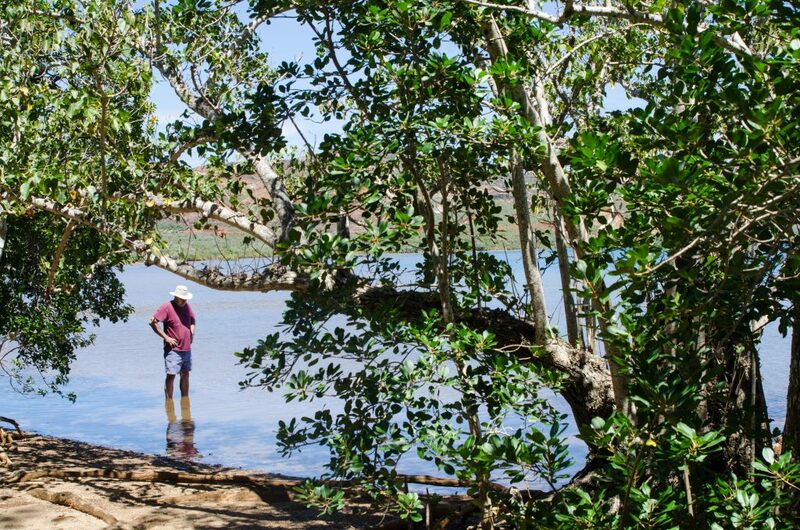 We explored the shores and after much coaxing managed to get Bob to go for a little snorkel. But it was quick and short. We all saw large grey shark and although they weren’t aggressively hunting they were lurking in close proximity. Denny’s birthday was a day away and we were planning to celebrate it with our friends on Atlantis who were waiting in Ile Casy. So we had a great sail and grabbed a mooring close to Atlantis. We had bought humungous steaks and our friends joined us on Landfall. We had such a good time partying and eating Bob’s perfectly barbequed steaks that we didn’t even think to capture the moment in pictures. We spent a day exploring the island. There were some great trails which took us all around the island to some nearby wilderness campsites, the ruins of the resort that used to be there, top of the island where we could see more of the Bay of Prony and found a plaque dedicated to Moose the dog that lived all alone on the Island. 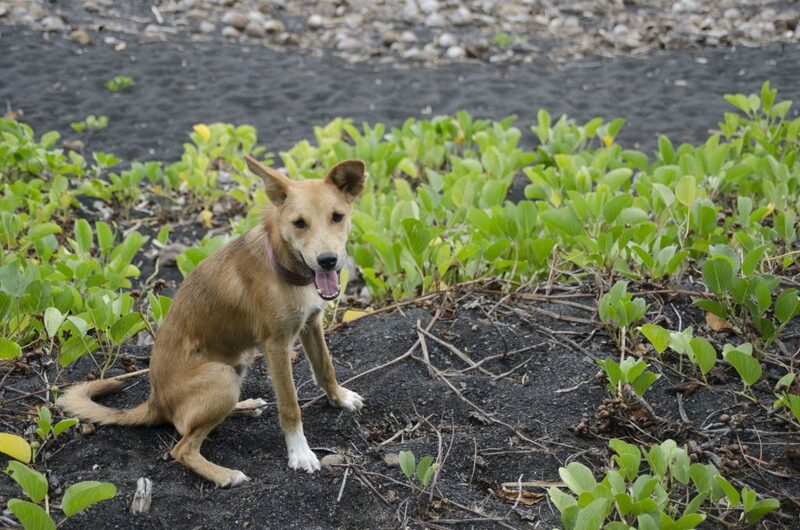 Story has it that the owners of the resort and the dog left the island but the dog not wanting to live anywhere else jumped off the boat and lived on the Island all by himself. He was fed and loved by all visiting cruisers. 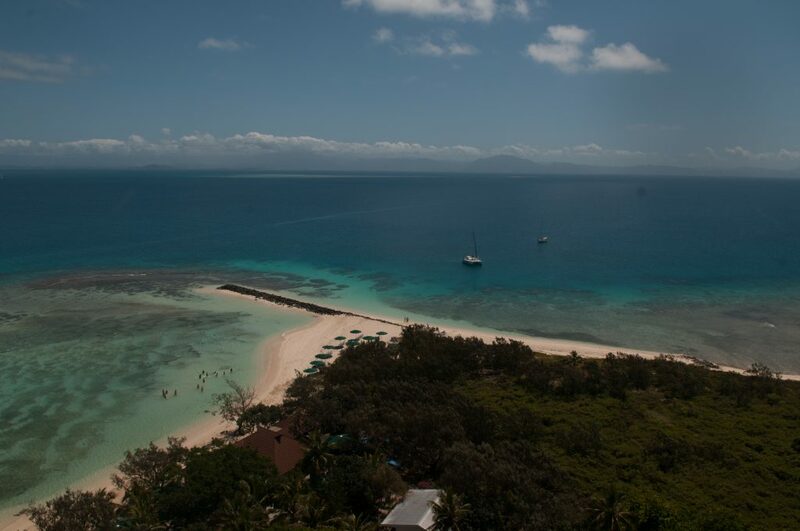 We wanted to give Bob a good tour of New Caledonia before making our way to Australia so we never stayed more than a couple of days at any anchorage. Next stop Bai Du Caranage for some water play at the cascades and hot pools. 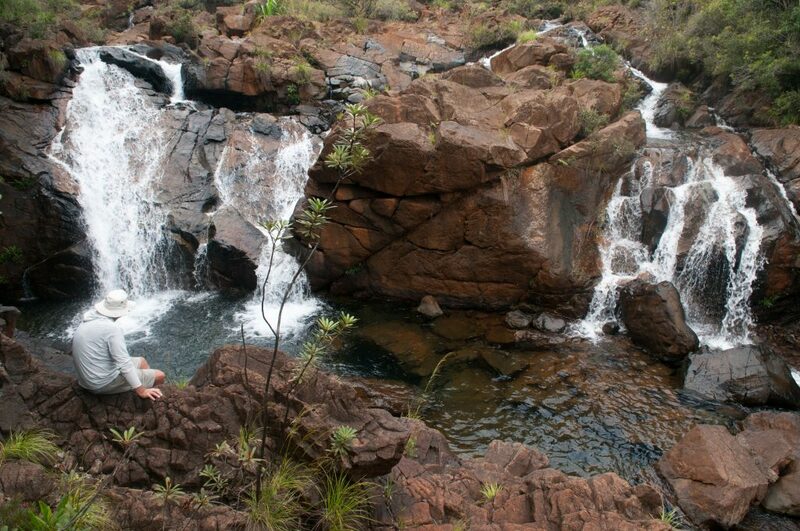 Surrounded by all the freshwater it was time for washing clothes and showers. We slowly made our way back to Noumea with a stop in Baie Ue. We were anxious to get ready for our passage to Australia but we decided to slow down our return until after the independence referendum as we weren’t sure if there would be some unrest and violence after the vote. As per Wikipedia “The Noumea accord signed in May 1998 set in motion a 20-year transition that transferred certain powers to local government and laid the groundwork for an independence referendum in 2018.” The result was 56.4% for maintaining the status quo. 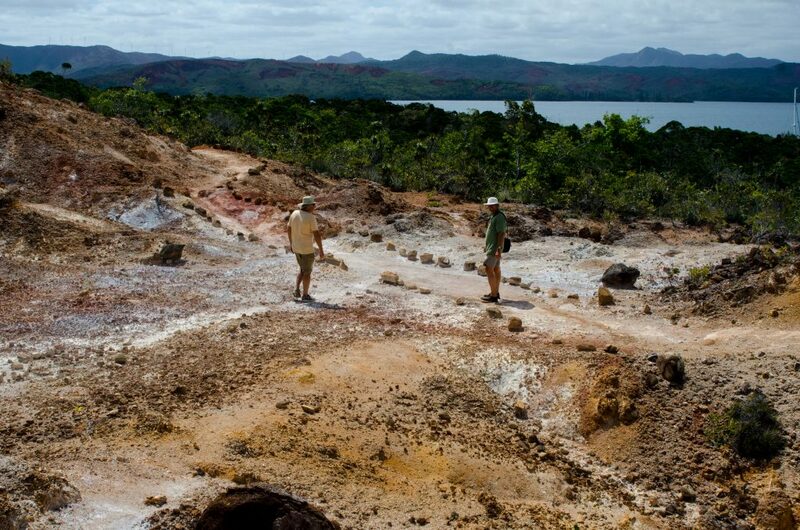 New Caledonians will have 2 more opportunities in 2020 and 2022 to vote for independence. Luckily there was little fallout from the resulting referendum and we could continue on to Noumea and prepare to do the immigration checkout. 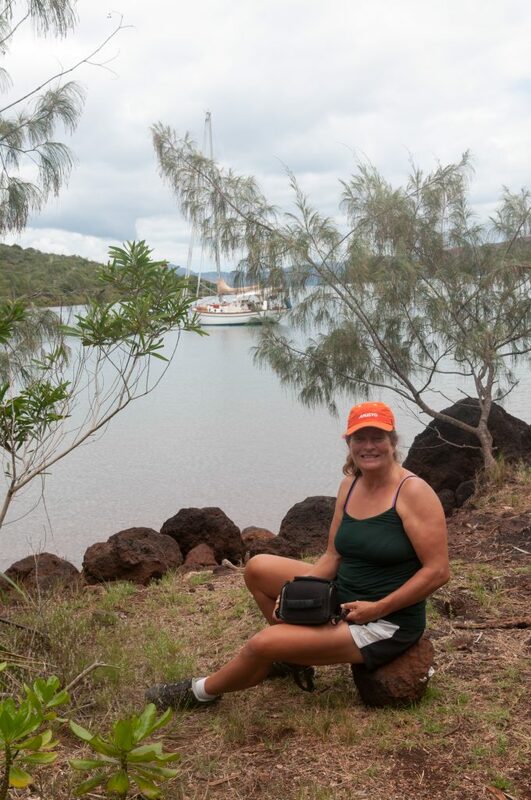 In Noumea we did the walkabout to customs, immigration and a final visit to Port Captain, last stop for coffee and chocolate croissants and then off to a mooring by Ile Maitre and wait for a weather window. It was a beautiful resort island and a great place to hang out. Denny and Bob jumped in and washed the bottom of the boat so we wouldn’t take any unwanted critters to the land of OZ. 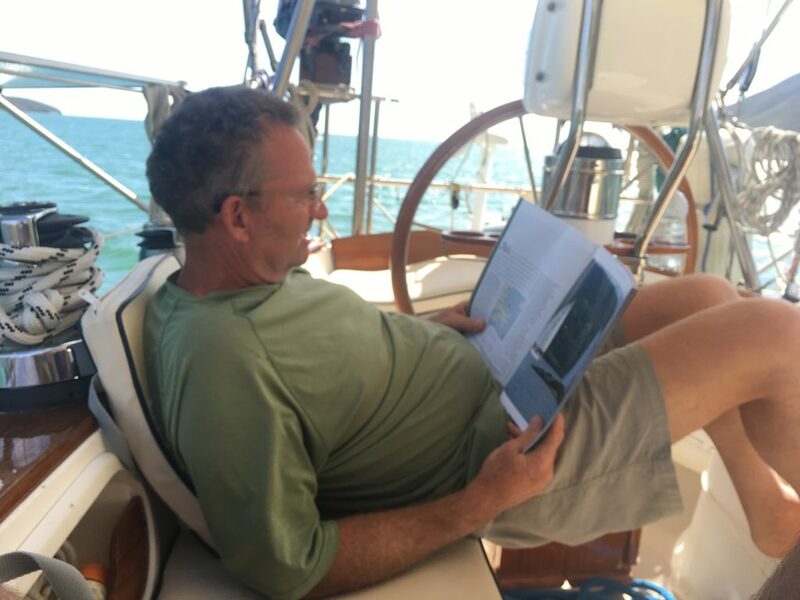 Bob was a little hesitant about being in the water but so long as he had Denny for company he seemed to be ok.
Our passage to Australia took about 6 days, 36 minutes and we sailed 782 miles. We had some swell and wind but also lots of calm motoring. We caught a Dorado on the way and Bob and Denny took turns for an hour reeling it in only to have to release when we noticed its mate swimming by its side. We just weren’t hungry enough for fish to break the pair as they do mate for life. 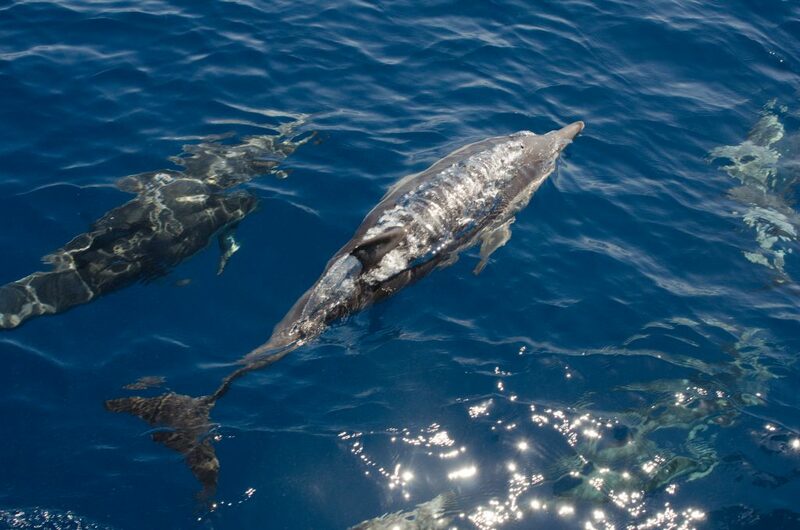 Once we were close to the Australian coast we were welcomed by a large pod of dolphins. We arrived in Southport, checked in the next day and then made our way to the Boat Works where we had planned to haul out the boat. The Boat Works is a great place to work and store the boat while we travelled to North America for the Christmas holidays. They offer free courtesy cars for use so long as you book them in advance. We took advantage of this and did a few road trips nearby to explore some of Australia before Bob’s return trip back to Minneapolis. 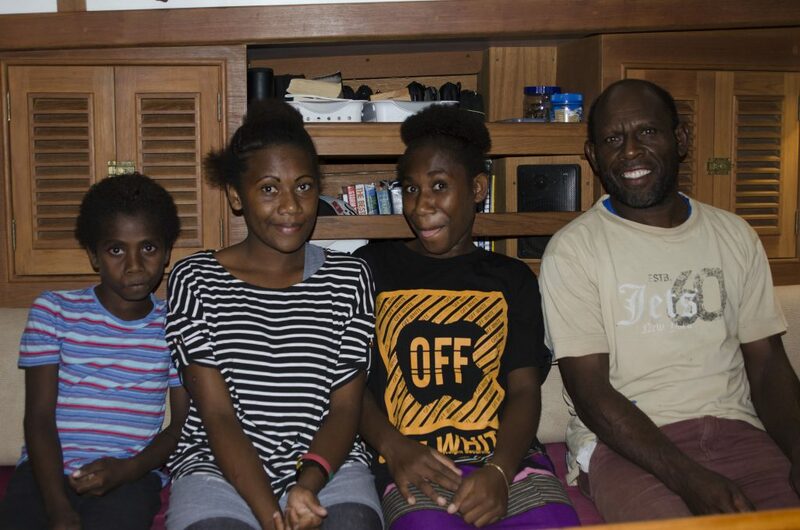 We enjoyed Bob’s company, had a lot of laughs, took advantage of his cooking skills and we were grateful for his help during the passage to Australia. Until next time…. 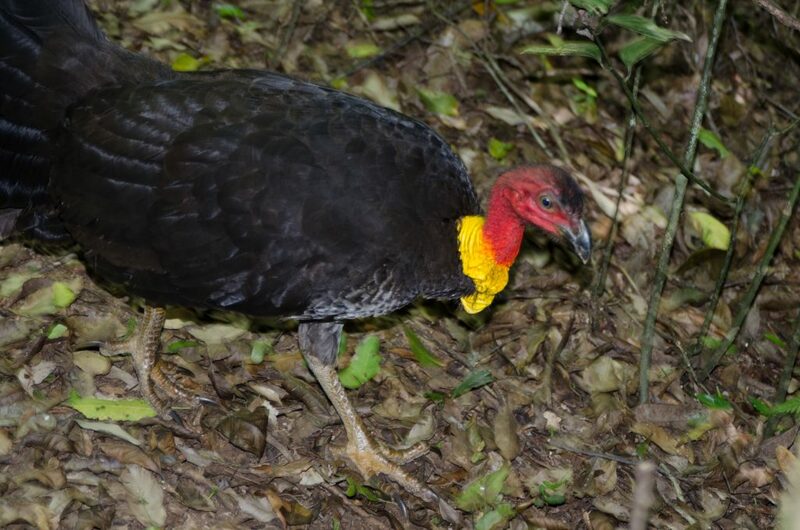 Australian turkey? Christmas around the corner!! 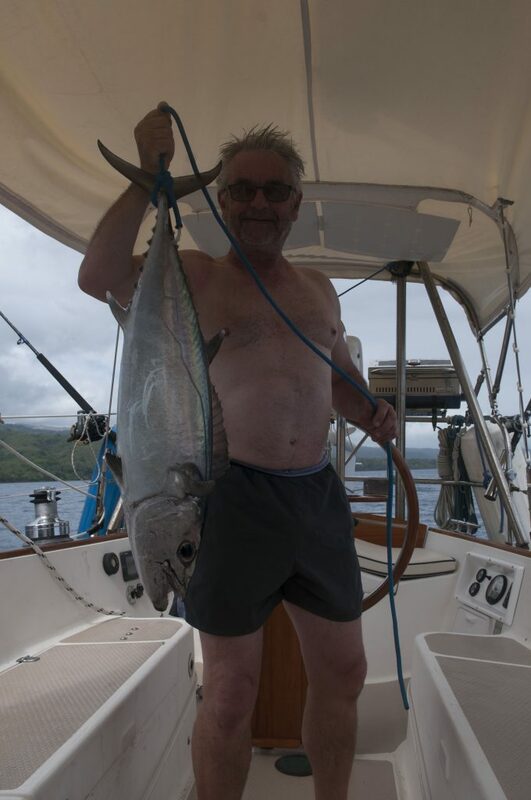 It was a beautiful 3-day sail from Vanuatu with wind on the beam at 15 to 20 knots. We managed to clean up a little and managed to get some sleep but we were still feeling the effects of our volcano experience so we needed a quick place to rest and recuperate in Bai Du Caranage. 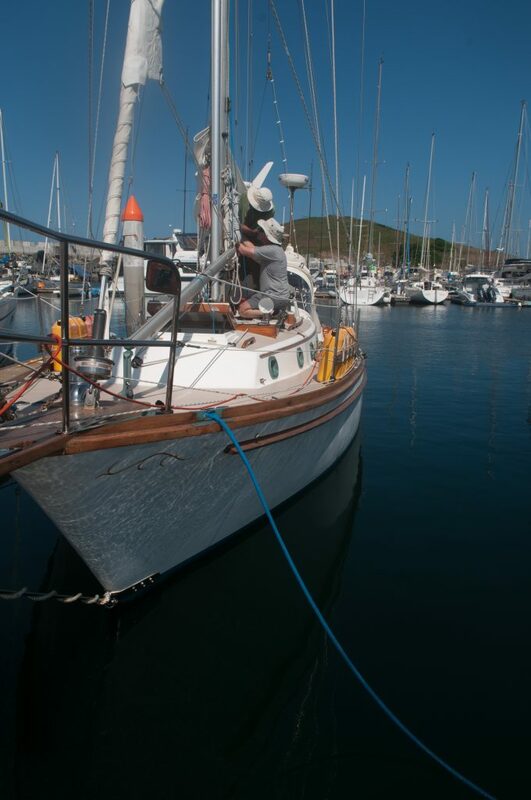 We tied the boat to a mooring and felt very comfortable in this well protected bay. We slept for 12 hours or more and loved the 24 hours of rain we got that washed all the ash, soot and salt off the decks. The boat seemed a little cleaner but the stainless had taken quite a beating from the acid from the volcano and would need some TLC with lots of muscle varnishing. After 2 days of recuperating we made our way up the long channel to Noumea, the only place to check into New Caladonia. We timed it so that we would arrive there Sunday evening and be ready to check in Monday morning. Immigration is only open 8:00 to 11:00 in the morning so we would have to get started early. The Bai De L’Orphelinat is full of moorings and we anchored in the outskirts were the charts tell you NOT to anchor but everybody seemed to be doing it. It is not a place one would like to anchor for long as it has a lot of swell and the big boats passing by. 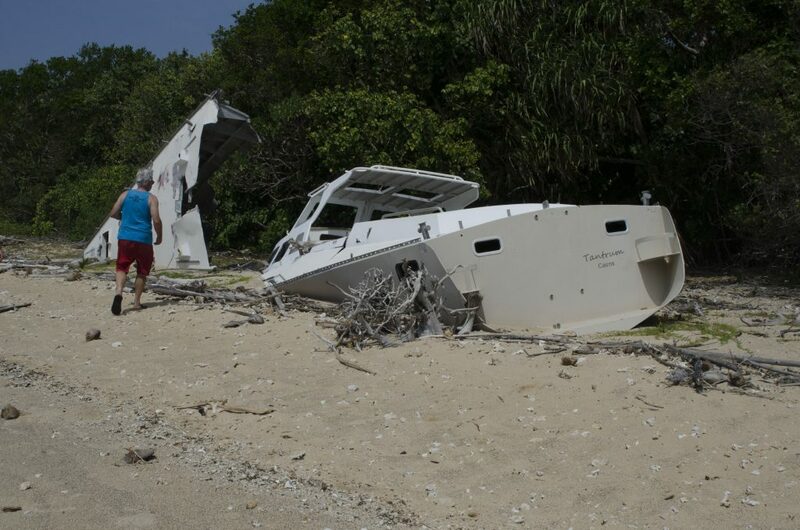 The local island ferries would send Landfall on a nasty roll and we had to scurry to hang on to anything that would go flying and cause damage to our teak or cause nasty spills, particularly Barbie’s red wine. 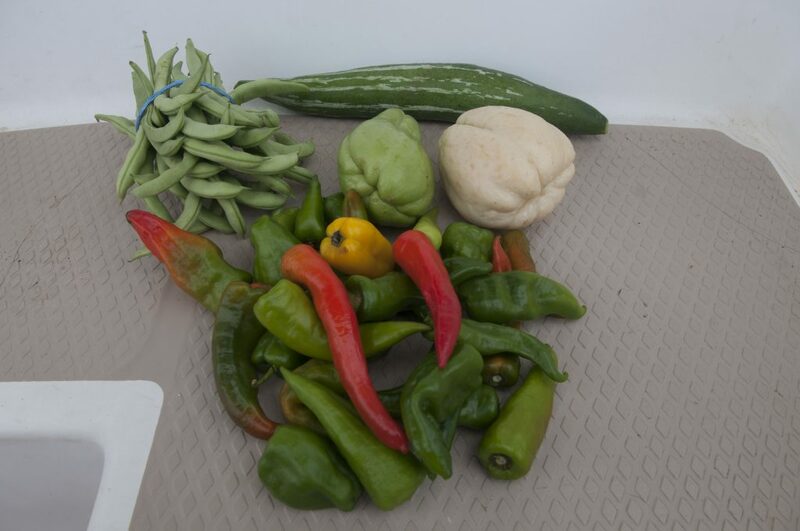 Early Monday morning we went to shore taking all our vegetables and with the help of marina staff found the location of immigration, customs and bio securities. Unlike other countries, in New Caledonia, the cruisers are required to go to the physical locations versus having officers come to your boat. Always a challenge to figure out the checking in process. Bio security still had to come to the boat and we managed to get a birth in the marina where we opted to stay for a couple of days to continue with the boat cleaning. Easy access to lots of fresh water, shore power, showers, grocery stores and a short walk to the laundromat. 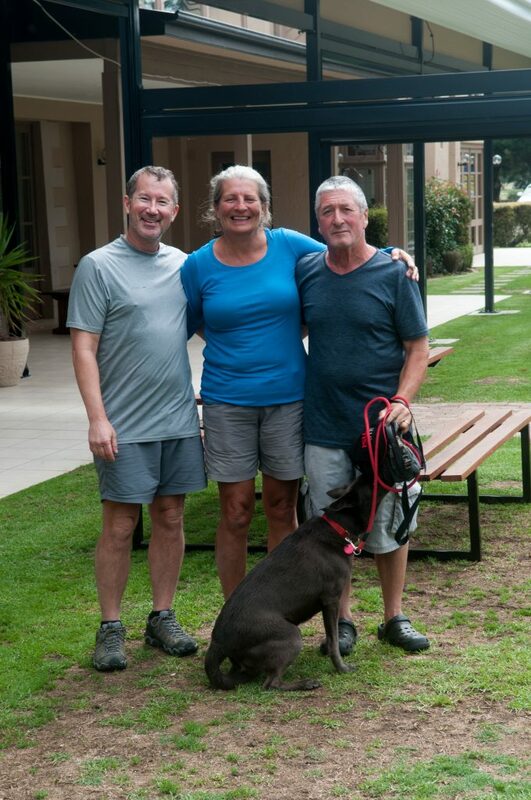 We were aware that many of the friends we made while in Dockland 5 were in New Caledonia as well so we were excited about a Dockland 5 reunion. And so it began. First a visit from our friends from Cava and Bravo and later Kindred Spirits. We spent a glorious afternoon recounting our experiences with the help of a bottle wine and a couple of beers. Fortunately, our berth neighbors were tolerant and didn’t mind the raucous talking and laughter. 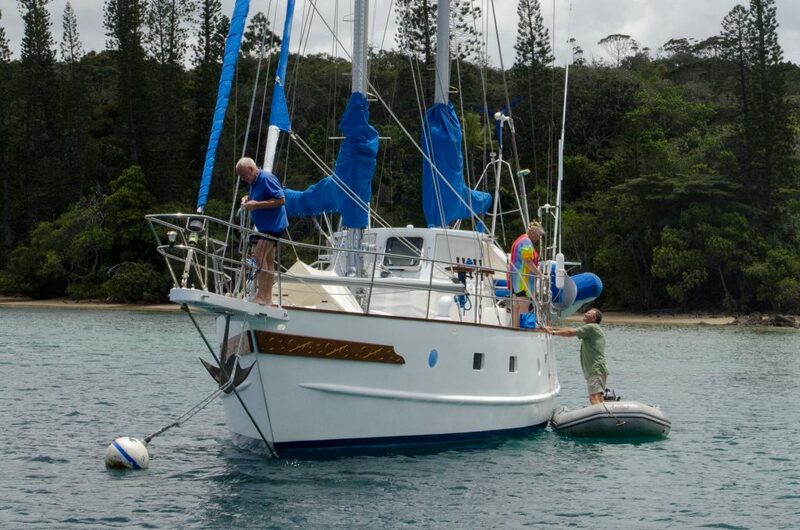 Once we had re-provisioned we headed to an all weather anchorage and do some ‘buddy’ boating with our good friends.We soon learned that the wind can blow in New Caledonia. For the most part evenings, nights and early mornings were quiet but then gust up to 20 knots during the day. So, this little anchorage offered little wind protection but great protection from the swell. In the evenings we had fun getting together for sundowners. 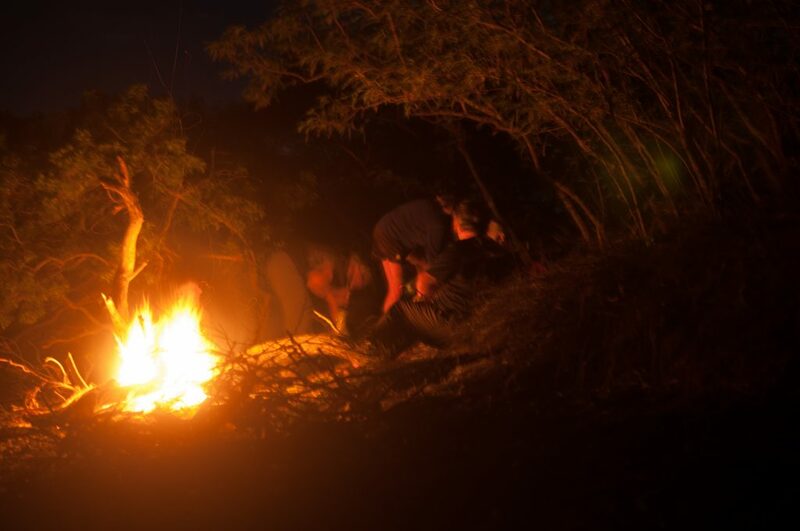 Denny and I spent one afternoon gathering firewood and then had a great evening beach fire with our friends sharing tasty baguettes, French cheese and pates. We explored the shores surrounding us and us ladies even did a kayak paddle across the bay where we bought some more baguettes. The paddle back was a little nerving as it was against a 25 knot wind but we made it safely with dry baguettes. After 10 days of together in Ile Uerie we headed back to Noumea to re-provision and get propane. Our first anchorage alone after saying goodbye to friends was to Ilot Amadee. 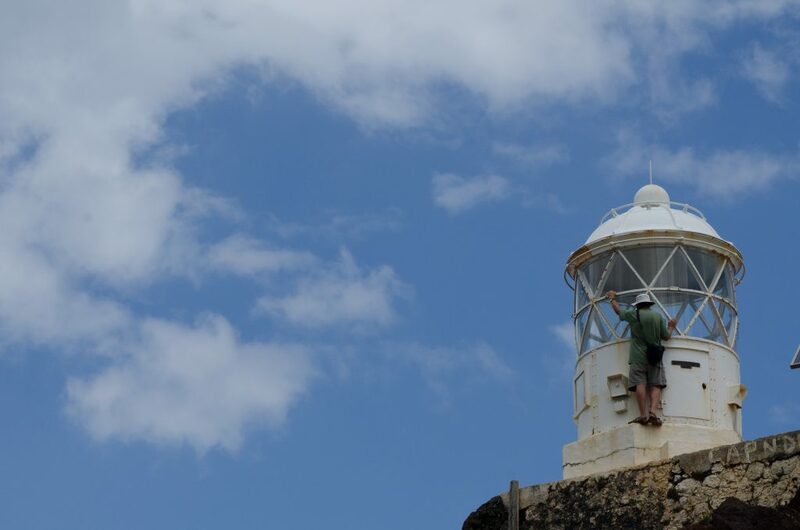 The island had the tallest lighthouse of New Caledonia and also promised to be a great place for turtles. We had a little problem rolling in our jib as we approached the Island and it was just something else for Denny to fix.. Luckily we managed to take it down without any incident. Amadee was a beautiful little island that catered to all the tourists arriving there with the tour boat. Two days of being part of the tourist circus was enough. Ilot Koure offered some beautiful pristine white beaches and great snorkeling. It was later that we learned there had been a fatal Bull shark attack but that had happened over 3 years ago. But considering that in the last 10 years there have been 10 shark attacks of which half were fatalities, the likelihood of coming face to face with the great beasts is unlikely. It’s still always a little unnerving for me getting in the water. Denny drove a piece of coral up into his heel while beaching the dinghy so what little snorkeling the weather permitted, I did alone. 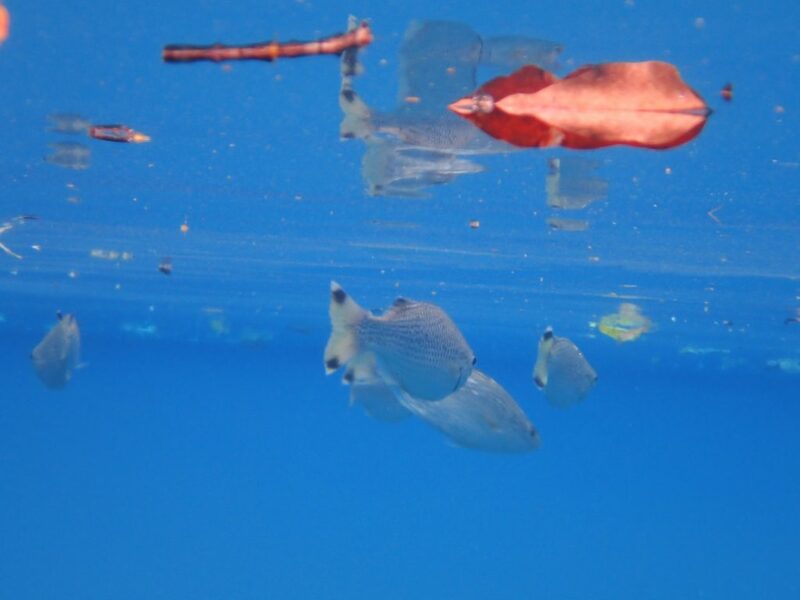 We did do a day anchor next to the Ouatio reef pass and the clarity of the water there was unbelievable. We could see the details of the sea bottom in 15 feet of water. I snorkeled around at Denny’s encouragement while he followed in the dinghy. Having him near made me feel a little safer and I spotted many colorful fish, turtles, Manta rays and a couple of small, lazy grey sharks. We decided that we should visit Ils De Pins with its teal blue waters and beautiful white beaches. It was just a day sail and the winds were promising not to be too strong even if it was on the nose. We made one stop Ilot Ua and we were here with three other boats so there must have been promoted as a good place to go but mainly for the snorkeling. We just made it a one-night stop and it positioned us well for the day sail to Ils De Pins. It was a tack, tack, tack sail to Kudo and we made it shortly before nightfall. There were about 20 boats here and it was a well-protected bay with little or no swell which was comfortable after the last few anchorages. We spent 5 days here and did a few hikes and kayak paddles. Denny did one death march with me to a nearby town that boasted a cute restaurant but it was closed by the time we arrived. We were not looking forward to the return hike in the sweltering heat and we were lucky to get picked up by a couple of local women and a baby driving a well-used little pickup. Conversation was difficult as they spoke little English and I spoke minimum French. During our hike back, Denny had found a channel lock pliers on the side of the road and he offered this tool to the ladies as a thank you. The look on their face was hilarious but they accepted the gift, which, according to Denny was a useful gift!! 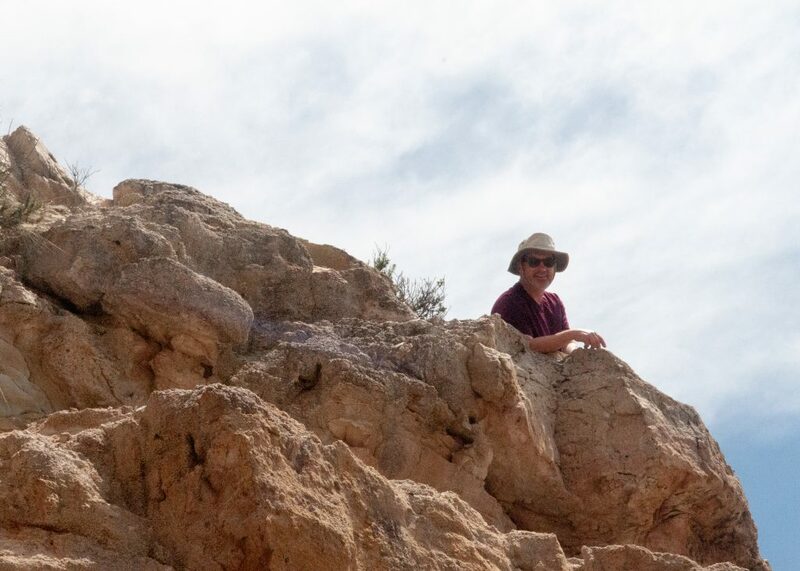 I did a hike to the highest peak in Ils De Pins called the PicN’Ga. Denny was still feeling the pain from the coral cut on his heel especially since the previous day hike. The view was astounding and worth the grueling up hill hike. Five days here was enough and we were looking forward to a couple more days with our friends in Cava, especially since they were looking for a weather window back to NZ. 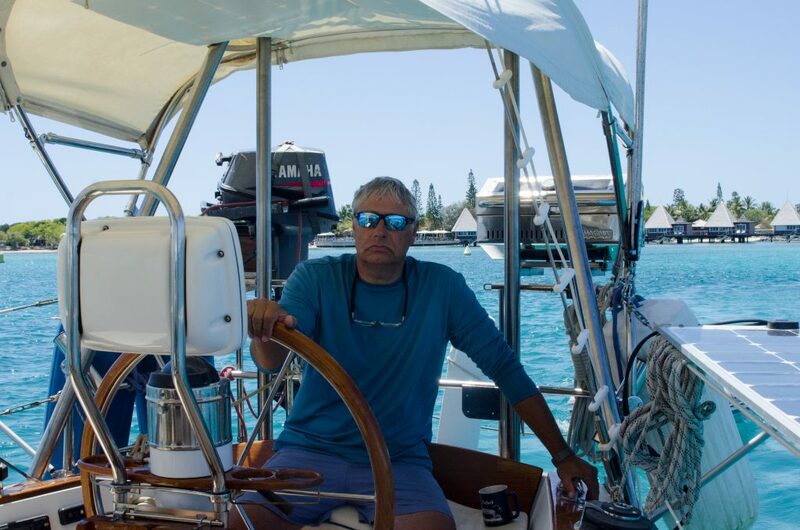 We made it back to Anse Majic and grabbed a mooring and spent a day with Cava. Shortly after our arrival they found a great weather window for NZ so, sadly, we parted ways. Kindred Spirit had already left for Australia and Bravo would follow suit shortly. And that’s cruising life, meeting amazing people but always saying hello – goodbye. 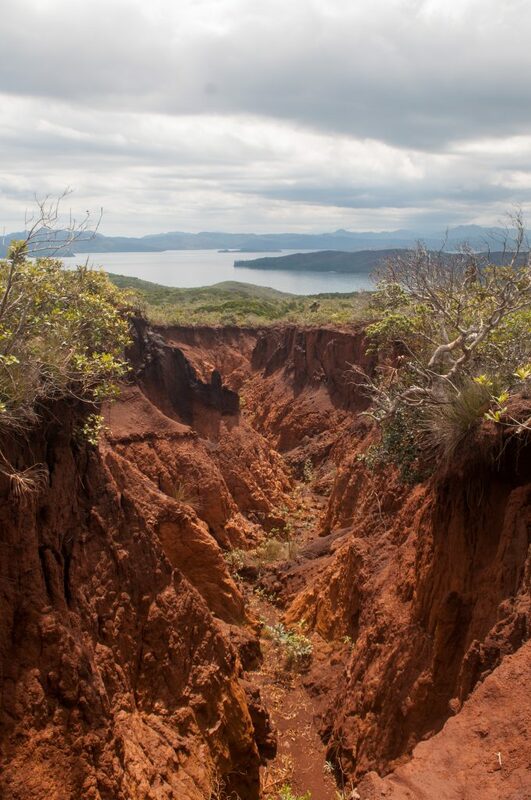 We did another great uphill hike and were amazed at the diverse colors and terrain from the rest of the anchorages in New Caledonia, mainly the red clay deposits due to the extensive mining in the area. 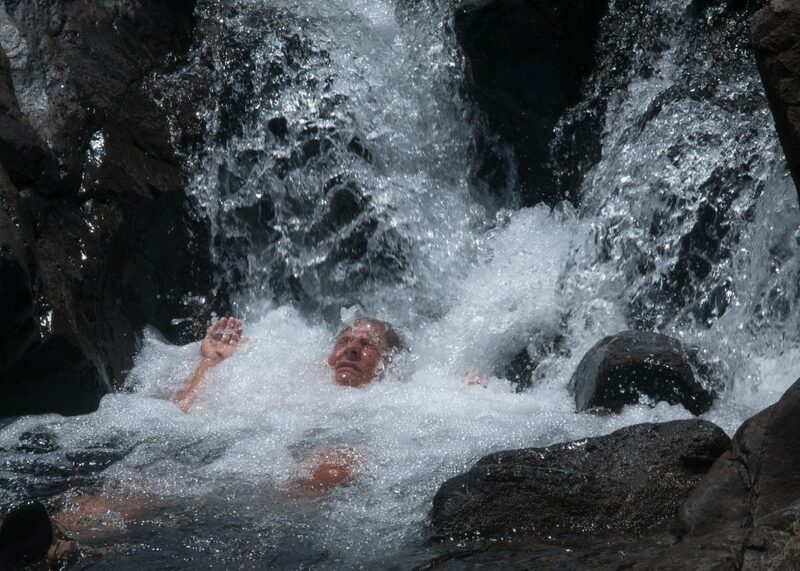 We also found a really neat, hidden little paradise that offered a fresh water shower, although it was a cold one. It was also a great place to do hand laundry. Yes it is living the dream hand washing clothes by hand and cold showers where and if you can get one! Always trying to figure out how things work! We continued our exploration of the Bay of Prony and anchored in the Baie De Carenage. 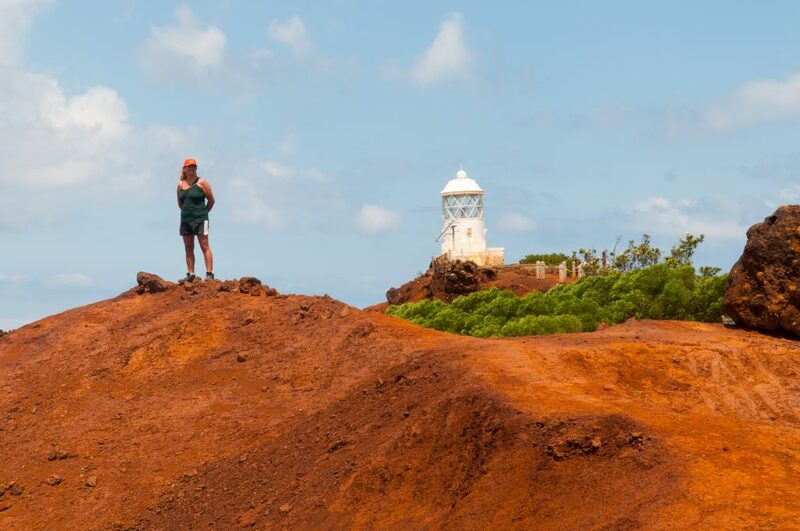 We found some new hikes here and taking advise from other cruisers, we took a bucket and small bristle brush to wash off the red clay mud and coloring that accumulated on our footwear. The hike brought us to some beautiful waterfalls and to a unique swimming hole with overhanging rocks and pristine clear water that just beckoned us to jump in. Denny took all his clothes off and went in first and was cheered on by a hiker that appeared out of nowhere. It took some convincing for me to follow him mainly because of the cold water but also some inhibition, of which Denny has none. 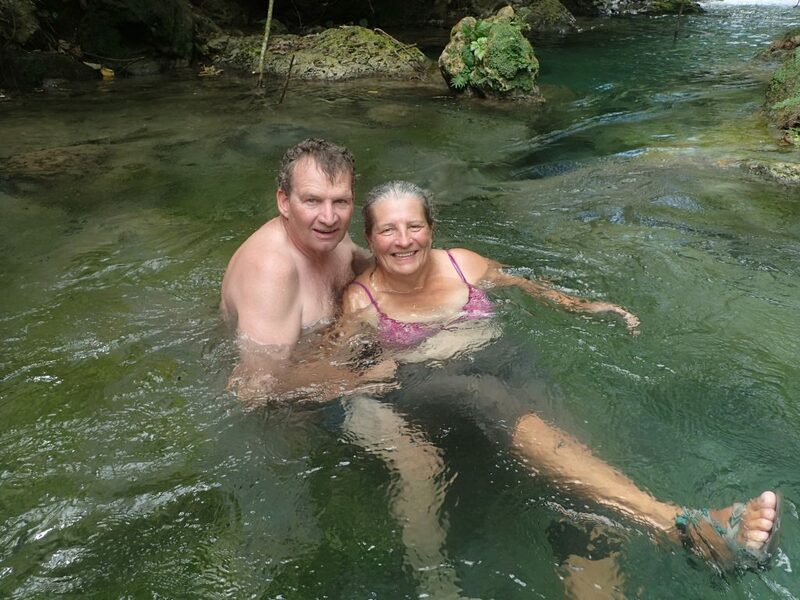 After all the cold water dips we were told of a nearby natural hot spring and it wasn’t hard to find. A gorgeous little man made concrete pool fed by fresh water and a hot spring. We had the warm pool all to ourselves! Finally a pool with hot water!! 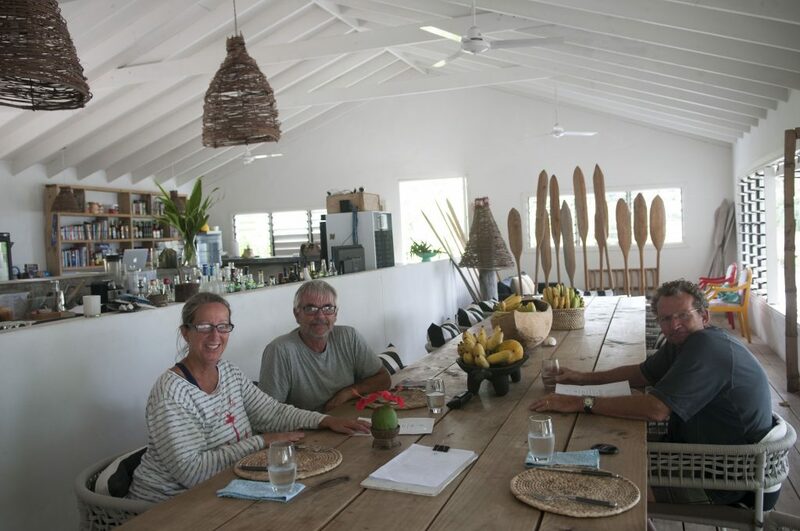 Our friend Bob was coming to visit us and then sail to Australia so we had head back to Noumea, as that was to be our meeting and starting point for our next adventure with Bob! 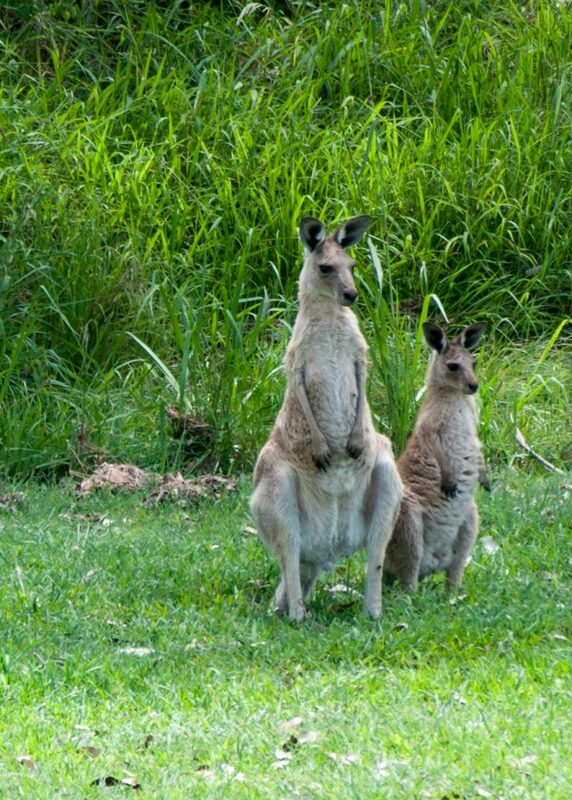 We are currently in Australia and hope to be here for some time. 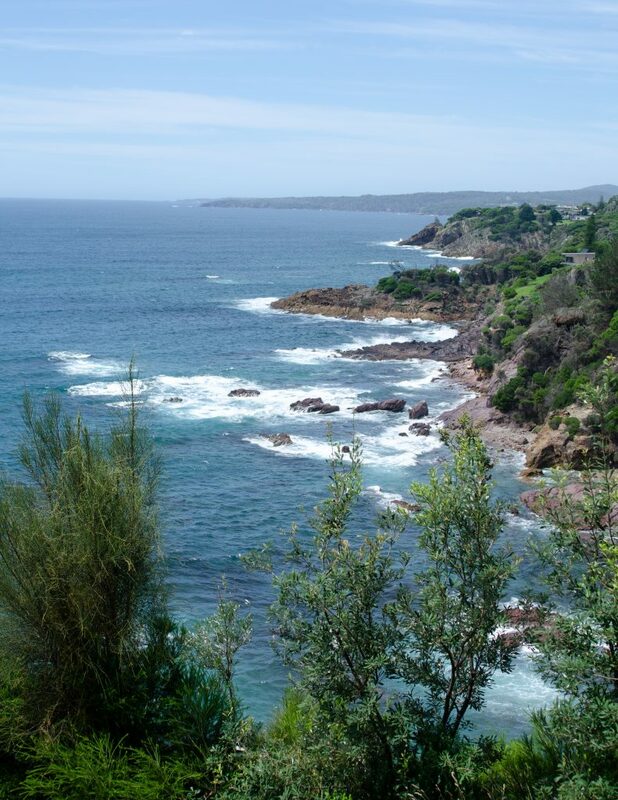 Our first planned destination is Tasmania and we are now in Port Eden waiting for a weather window before crossing the well-known ‘boisterous weather’ Bass Strait. 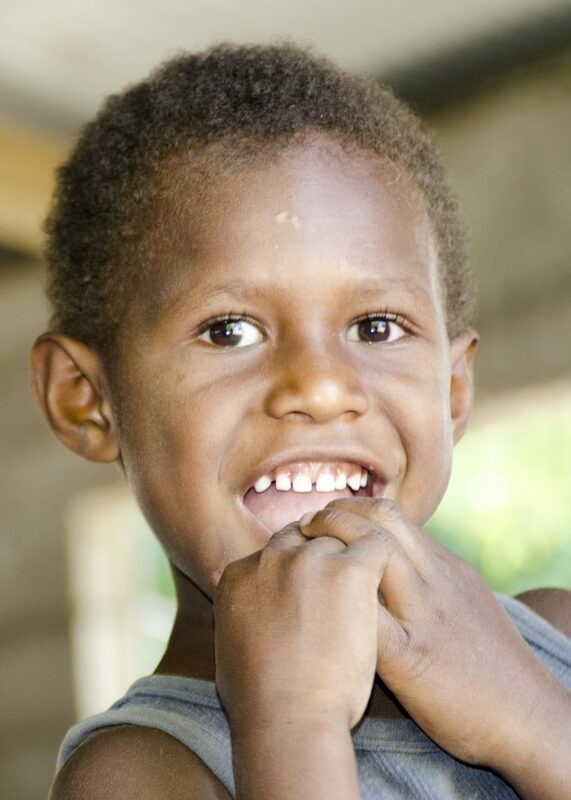 This gives us the opportunity to catch up on the blog updates from Vanuatu and New Caledonia. 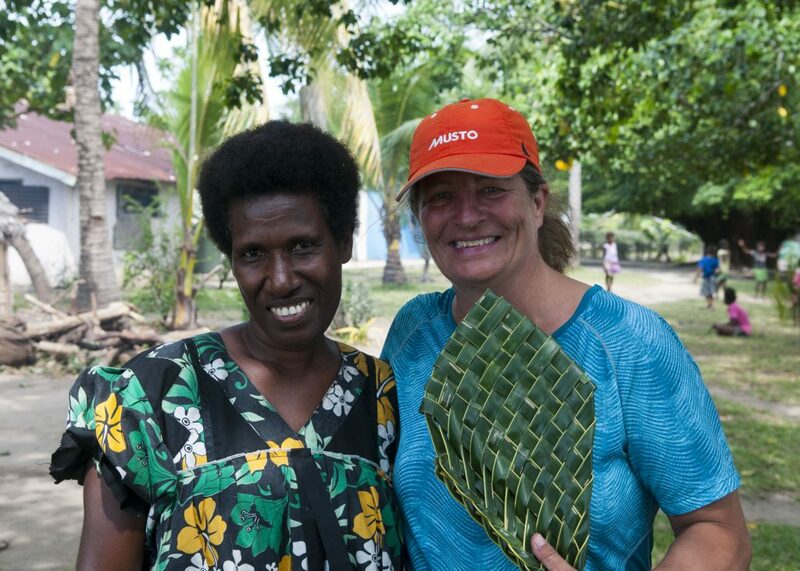 Our last stop in Vanuatu was Tanna. After a long hard day’s sail against prevailing winds we arrived in Point Resolution very early in the morning and set the anchor as the sun was rising. We were determined to finally get close to Mother Nature’s caldron after missing the opportunity to hike to the volcano in Ambrym. We had already checked out of the country and were just making a quick stop. 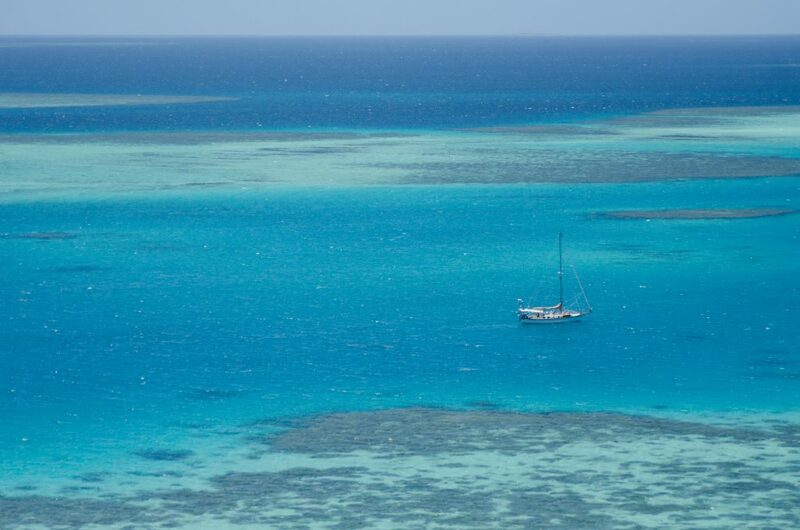 We were aware that we had a great weather window to sail to New Caledonia but only if we left within 24 hours. 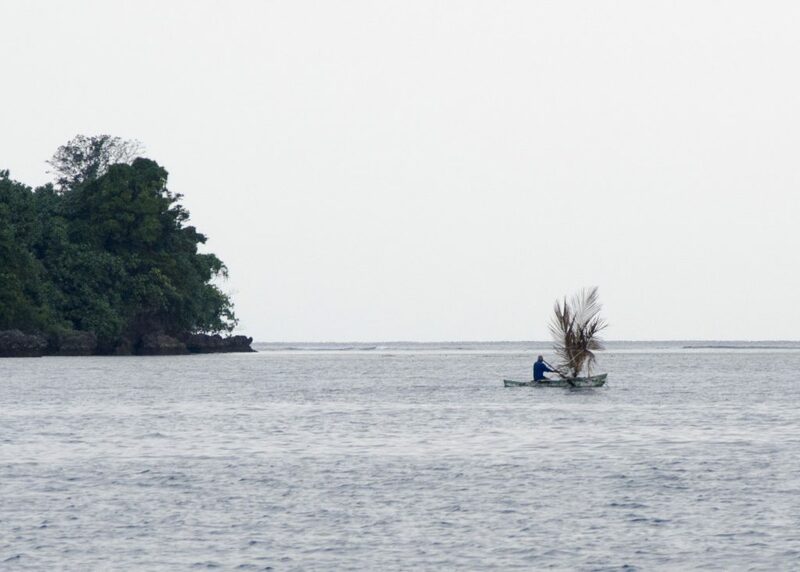 We quickly got the dinghy in the water and began searching for the Tanna Volcano tour guides. The town was pretty quiet that early in the morning. 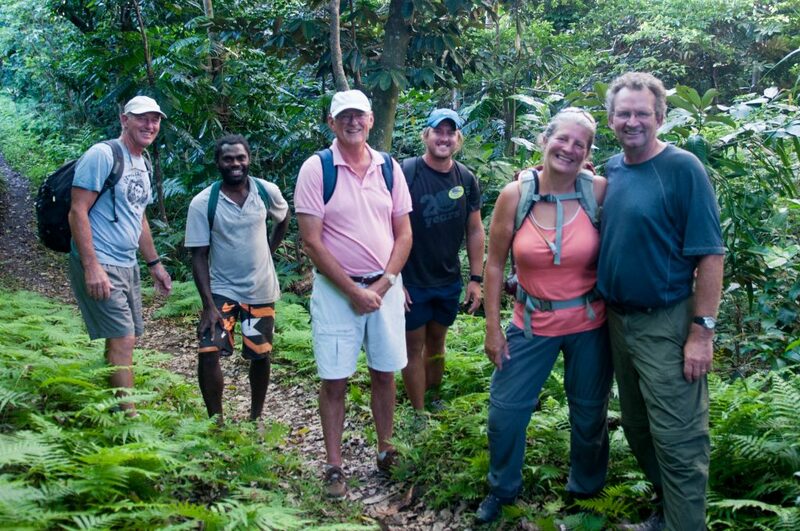 We met other cruisers who had already booked themselves a guide and were planning to head to Mount Yasur that afternoon and invited us to tag along. The only instructions we received were to bring a torch, good walking shoes, water and food and meet at a specific location on the beach at two in the afternoon. We arrived at our meeting point early to make sure the tour guide was ok with us joining the group. Signs of the active volcano were everywhere as we spotted kids enjoying warm water baths caused by hot water flowing into high tide pools. 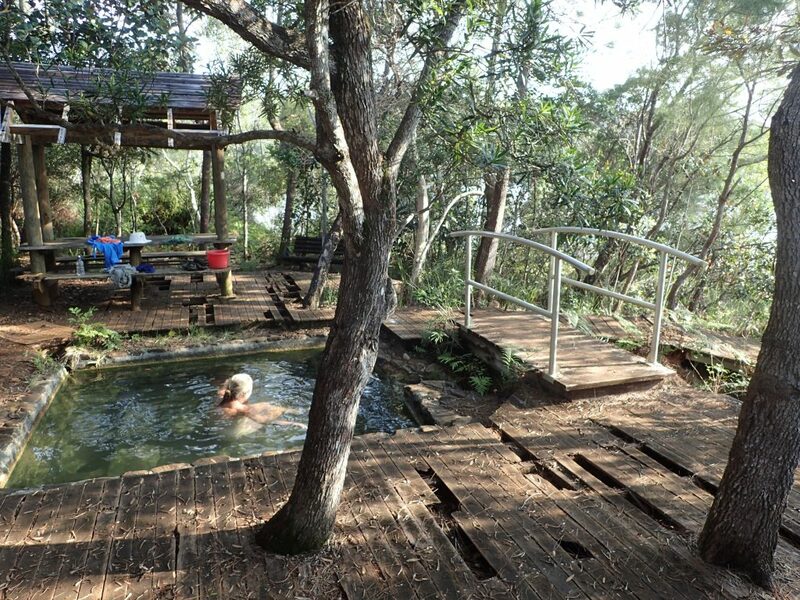 The hot springs nearby were used for bathing and cooking. The tour guide was a young man from a near by village and he explained that we would first do a three-hour jungle hike to the base of the volcano. 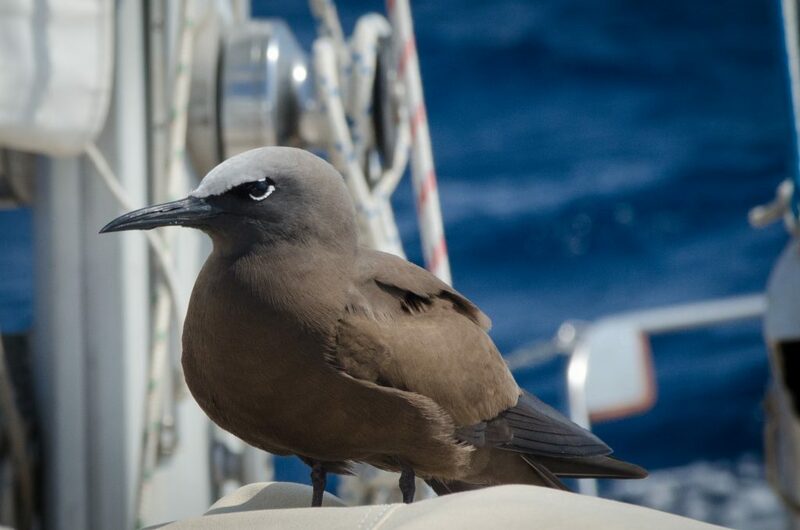 Although we had not gotten much sleep during our overnight sail passage, we were hyped to explore the flora and fauna and had lots of fun getting to know the people in our group. It was a steady uphill climb but we stopped often and our guide treated us to fresh coconut drinks, sugar cane nibbles and green onions to take back with us. 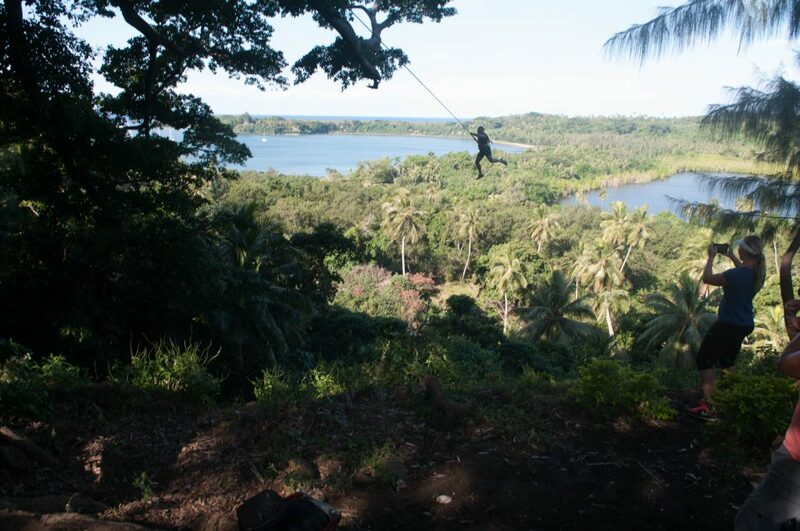 We were given the opportunity to swing from a rope and harness over a valley with heart stopping heights. Only one person volunteered and it wasn’t Denny or me (although Denny probably would have if I didn’t give him an “I’ll kill you myself if you do” look). We arrived at the base of the volcano just before sunset and we were told to sit back and have our picnic and stay well-hidden while we waited for the “licensed” Tanna tour to end. That was an “Oh Oh” moment for us. It was our first inkling that what we were doing was not on the up and up. 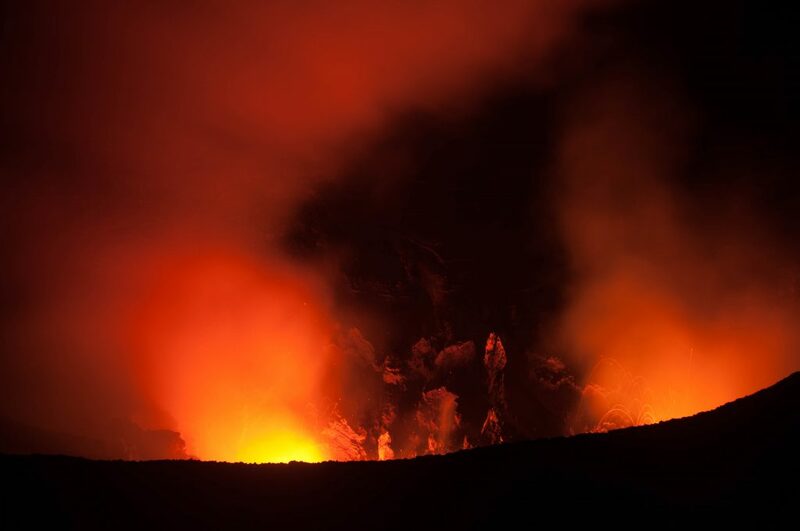 We were aware that the government had taken over the rights to take people for the volcano tours and that the whole expedition was very expensive with limited time to see the eruptions. But we had tagged along to an already scheduled tour and had been under the impression that it was an authorized one. 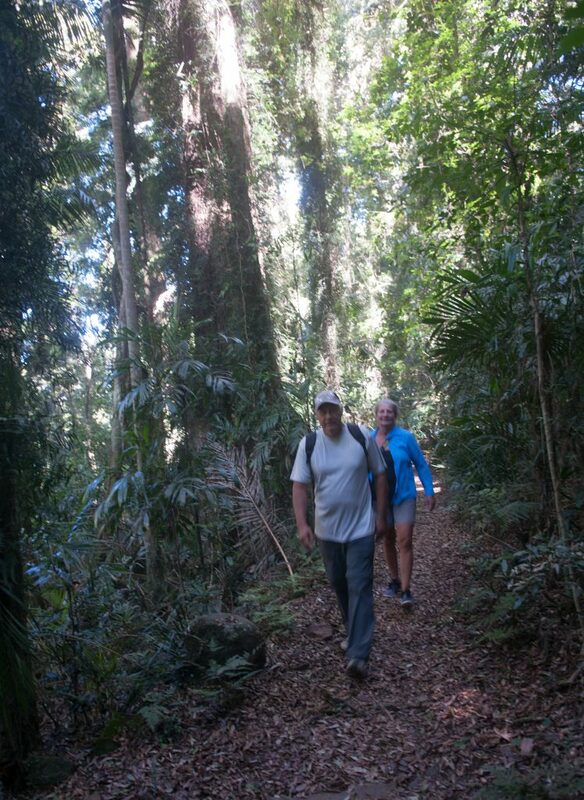 Denny and I had come too far to turn back and the young guide seemed very knowledgeable and experienced. 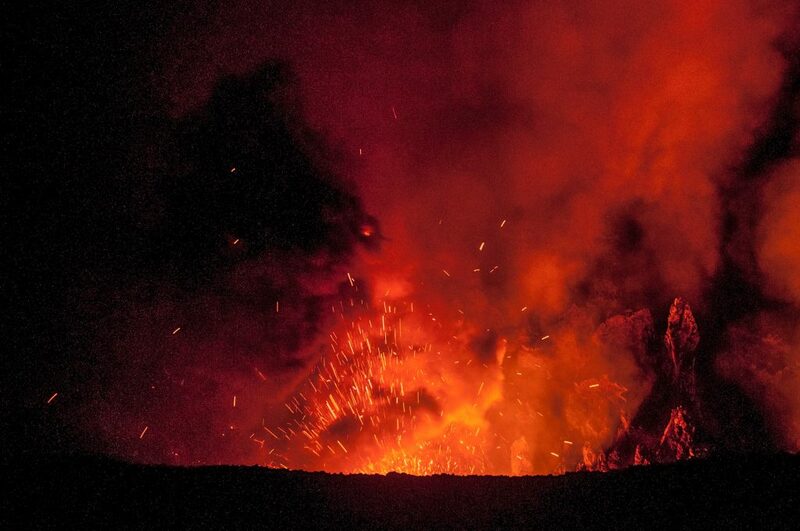 We waited patiently and could hear and see Yasur’s eruptions from where we were. The ground shook and the roaring sound of the explosions were incredible. Finally, we got the go ahead to continue up to the mouth of the volcano but not by way of the ‘tourist’ track as there we would be spotted by the posted security guards. We had to crawl and stumble on all fours up the rock face without the use of our flashlights and sometimes had to stop and look up when an eruption occurred to make sure we didn’t get showered with volcano debris. Relief was felt by all when we made it the top and could finally get front row seats to the majestic lava shower that seemed to occur every 10 minutes. The sight was breathtaking and exhilarating and it is impossible to describe the immensity of the thundering force of each eruption. Denny quickly setup the tripod and camera and proceeded to take pictures but then was told that pictures with flash and Iphones could not be used as the security guards had spotted us and were making their way up. We were taken to an outcropping of rocks and told to hide while the guide went down to possibly bribe the guards to let us wander around! The wait was excruciating and we all felt like we were taking part in a commando expedition. Finally the guide returned and advised us that security was staying at the base and we could explore some more but keep camera lights and flashes well hidden. We were given the option to hike to a lookout point which would allow us a better view of the smoldering lava. Only four of us which included Denny and me followed the guide to the higher vantage point. We crawled to the edge and could look down at the molten red lava but before we could get our cameras out Yasur erupted and the wind carried the smoke and dust towards us. We couldn’t breathe, we couldn’t see and had to make a quick exit out of there. I hung on to the guide and with eyes closed, stumbled back to the lower viewing point. Denny wasn’t as lucky and he had to make his own way down with tear filled eyes. We took some time to get our breath back and refocus our eyes before we were given the instruction that it was time to leave. One thing was for certain, we were not going to descend without the use of our torches. We were assured that the route we were taking down was on the opposite side of the security gate and torches could be used so long as we kept them pointing down directly in front of us. The way down was just a mountain of fine ash and sand and we slid, ran, stumbled down the volcano. We felt like we were downhill skiing with little control for what seemed like and endless amount of time but really only 10 minutes. When we spotted truck headlights we were told to turn off our torches until the guide confirmed that it was the vehicle that would take us home. We all felt relieved and elated that our great adventure had ended well. Little did we know that our drive back to the beach was going to take an hour and half over some very dubious washed out roads. There were times where the road was the width of the truck and an inch too far over either side could end badly for all of us. We were sitting in the box of the truck, hanging on to whatever we could and hoping the roll cage would offer some protection if necessary. But the driver was experienced and had taken this route many times. Somebody in our group asked our guide if he had conducted these tours very often and his reply was “No, never before!”. He looked at all our horrified faces and he quickly clarified “never with OLD people” as if that should make us all feel better!! We arrived back at the beach shortly after midnight and said our goodbyes, thankful to be on our way back to Landfall. Despite the questionable choice of tour guide all Denny and I could feel was awe, exhilaration and very fortunate to be able to get close to a force of nature so powerful, lethal, thunderous and beautiful. But we had no time to linger in the immensity of what we had just experienced. Our sailing weather window indicated that we had to make an immediate exit and steer a course to New Caledonia. As we had already checked out of the country, we didn’t have the option to wait for the next available window. 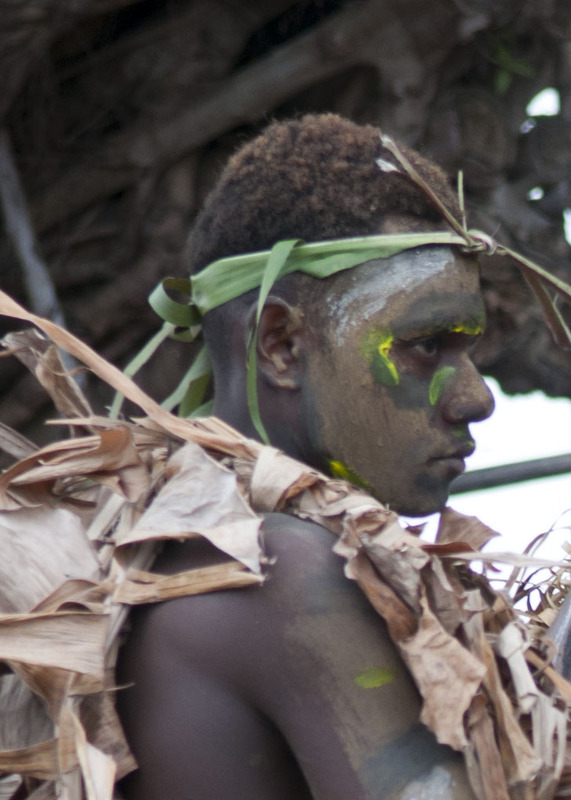 So although we were exhausted, full of ash and soot, we hoisted sail and left beautiful Vanuatu. Next stop New Caledonia! good thing we did because I wouldn’t believe we were at the airport. It was just a burned out building, open to the elements and no security or gates. There were a couple of people hanging out with their luggage and that was the only evidence that we were in the right place. We waited and waited and waited. Finally Denny found somebody that looked like he was an airline employee and asked about the flight schedule. He informed us that the flight had been cancelled due to thunder and lightening storm in Port Villa. So we headed back to the boat not knowing where Pete and Mel were. We finally got a text that explained they were delayed, and then one saying they were on the way. The wind had worsened so we arranged a water taxi for them as the dinghy ride would have been a wet one. With the wind howling there wasn’t much to do except take a little tour of the nearby village. We decided not to stay in Lakatoro any longer and sailed to the next anchorage that was a little more protected. Crab Bay was a little challenging to get into as there was coral everywhere. The little hole we anchored in wasn’t very large with minimal swing room, so we put out a second anchor to keep us from swinging. It was still very windy out but we were sheltered and felt no swell. There was a nearby nature reserve with a trail so we decided to do some exploring. We found another shipwreck on the beach which is always sad to see. We couldn’t find the story about this boat on the internet. 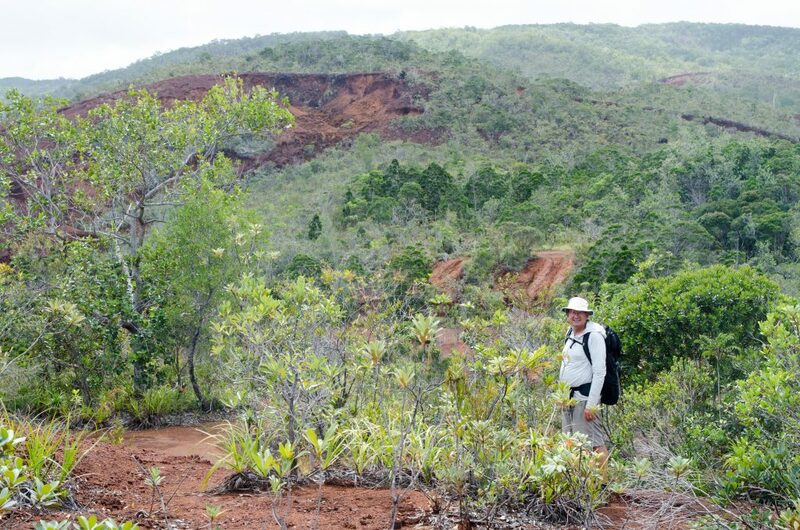 One of the planned stops during our friends visit was to do the volcano hike on Ambrym. The hike would take 10 hours through some rough terrain and uphill and it would have to be guided. We decided we would do it in 2 days and hire porters to carry our food, sleeping bags and camera equipment. 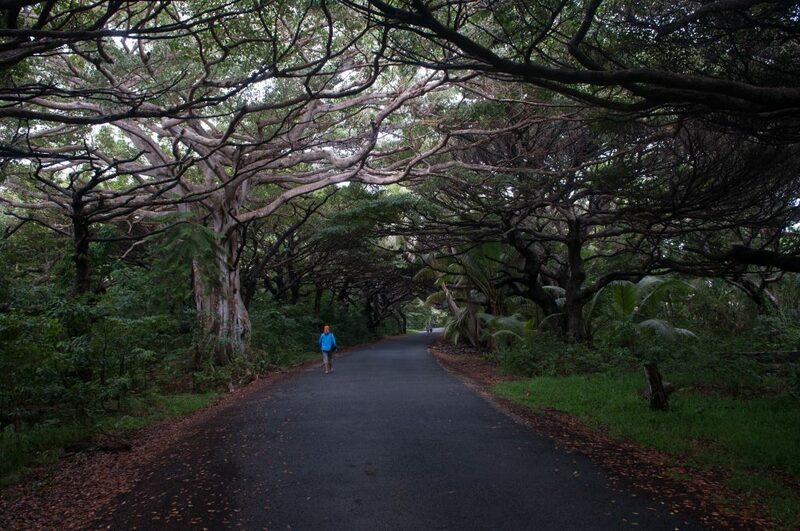 This would give us more time and energy to enjoy the hike and the volcano. We got a weather window so after 2 days in Crab Bay we set sail for the next Island, Ambrym. The link to google map will give you an idea of our less than desirable anchorage and the distance we would have to hike to the Volcano. 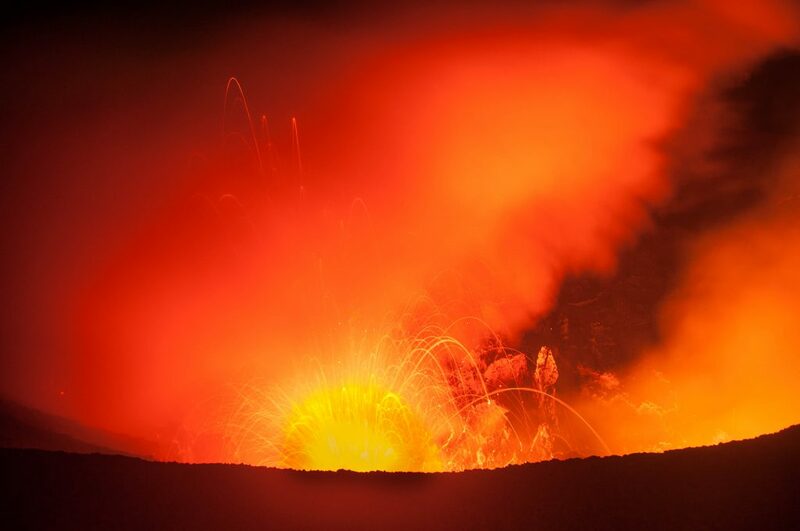 Google describes Ambrym as one of the most active volcanoes in the New Hebrides and one of five lava lakes in the world. We were all pumped to go. We took a hike through the village looking for a guide, along the way we made friends with a village dog or I should say he made friends with us. It was a hot and humid stroll around village and we were starting to second guess our ability to do the walk. We came across a cozy, little Cava bar where we could celebrate our success. We found somebody who had the experience and knowledge and willing to take us to the volcano Caldera but the weather wasn’t cooperating. There were low lying clouds and it was coming from the wrong direction which would probably hinder our view of the lava lake in the crater once we reached the top. We weren’t willing to do the hike without being able to actually see the volcano. We waited for a day but weather wasn’t improving nor did it look good for the next couple of days. However, it was a good sail (motor) window to head back South to the main Island, Efate. There were no available flights from Ambrym to the main Island that Pete and Mel could take in order to catch their connection to NZ so we decided to abandon the Ambrym hike. 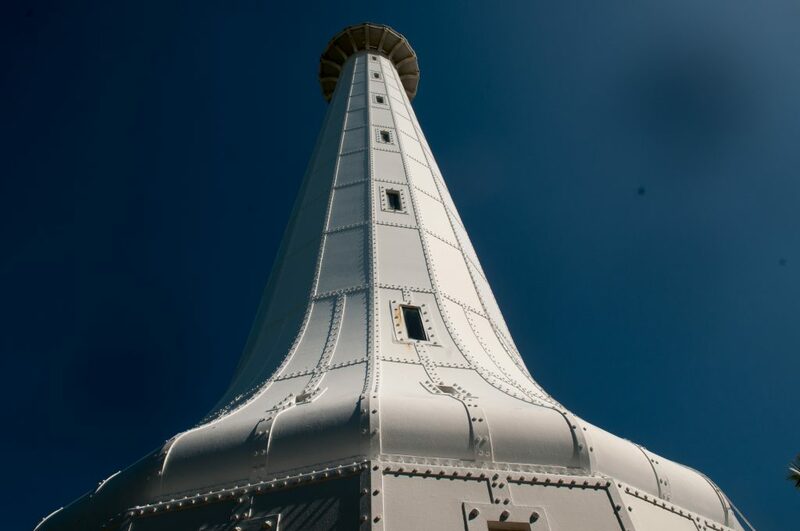 We hope to come back someday and do it. 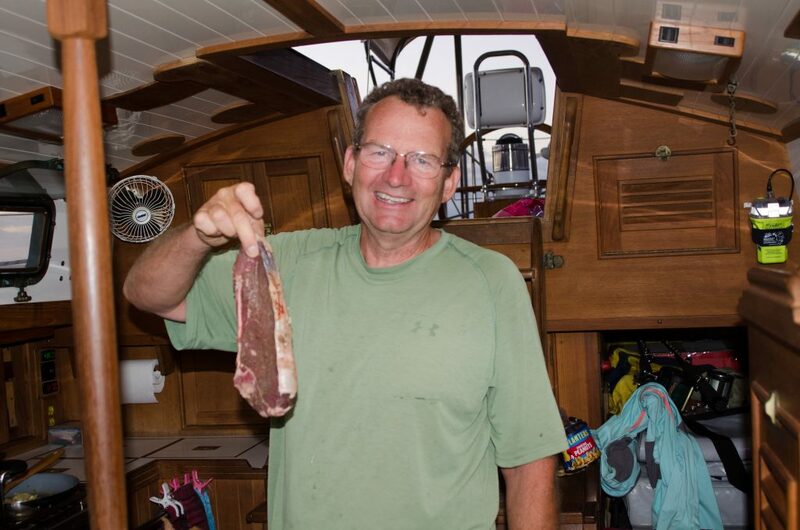 The night before we left we did see some Dugong swim by the boat and on the day we left Pete, who was in charge of fishing, caught us an Albacore Tuna so we were happy with that. The passage back to the main island Efate was an overnight motor but that was better than a beat against prevailing wind. Back on the main Island we spent the time enjoying food from some nearby restaurants and resorts. Pete and Mel had friends that had a little cottage near where we were anchored so they were able to get off the boat for a little while. I did end up with a very nasty infection from a small cut on my ankle that appeared to be nothing at first. The cut became swollen, red and from there the symptoms worsened and I had fever and chills. It was going to be a hospital emergency stop for me but luckily Pete and Mel’s friends had the proper ointment and antibiotics and by morning I was cured. But it does stress the importance of keeping small cuts clean and having appropriate medication for these instances. The outcome could have been very bad for me if appropriate action wasn’t taken quickly. We enjoyed our time with our friends and 12 days seemed to go very fast. 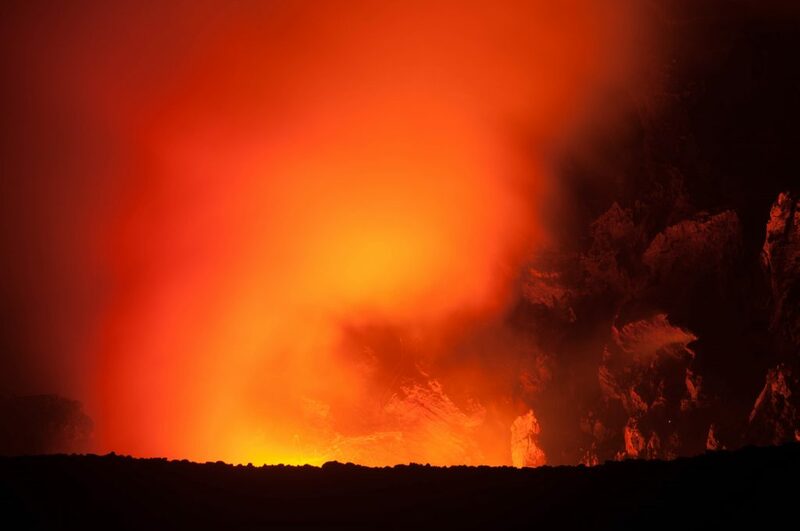 They were back to NZ and it was time for us to head to New Caledonia with one stop on the way, our last chance to see an active volcano in Tanna. 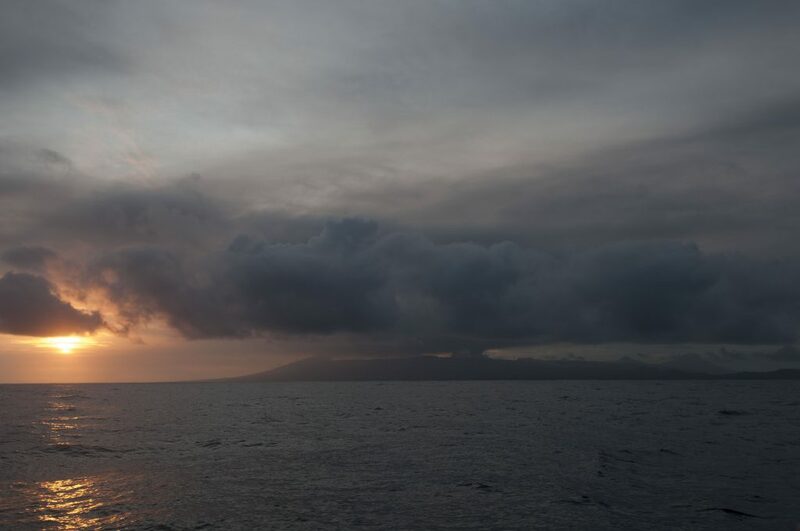 We left Malua Bay, Malekula early in the morning and headed to the northern island of Santo. It was a great sail. We spotted a shark fin so we knew there were sharks nearby and we caught a very small tuna on the lure we were towing. We returned it to the sea as it wasn’t worth taking. 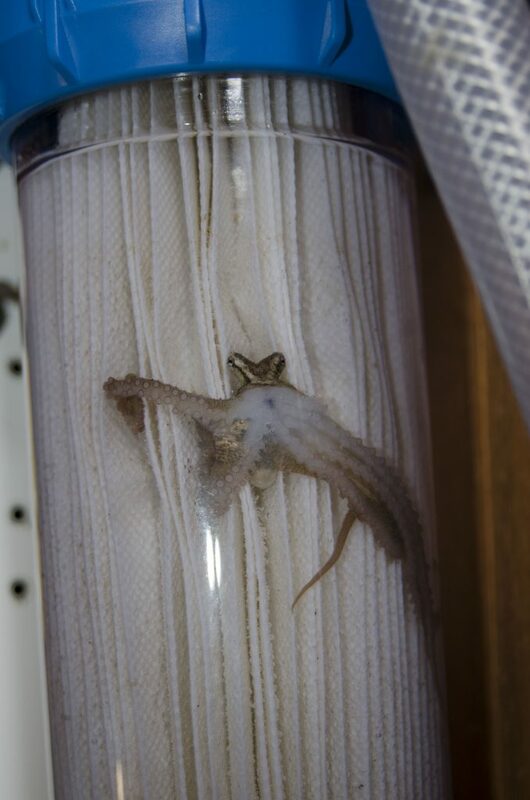 This little fellow managed to get himself sucked into our Water Maker filter while making water on the way. We set it free. 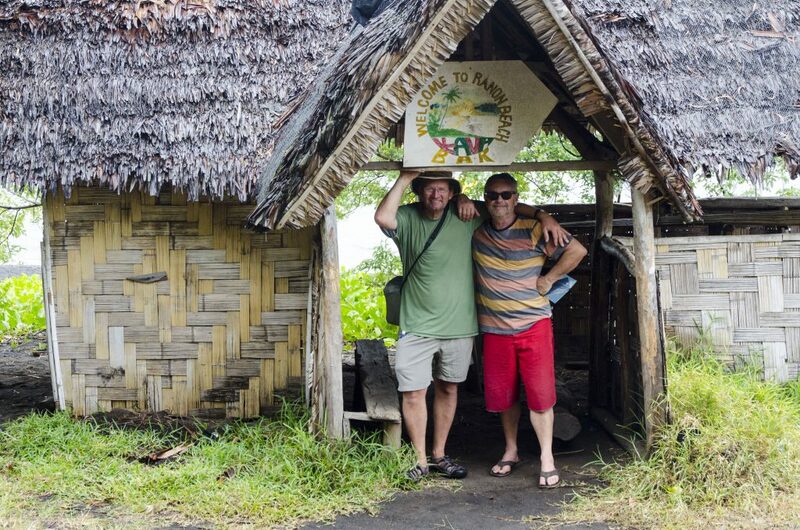 We had planned to anchor close to Ratua Island where there was a nice little resort. I was ready for a little resort visit and enjoy a nice meal off the boat. There wasn’t enough room to properly anchor but we were told by a Catamaran that there was a boat leaving within the hour. We waited and waited and then decided to radio the boat that was supposed to leave. Unfortunately, they were having engine problems and had decided to stay so our planned outing had to wait. It was getting late and we had a couple of hours to go before we would reach the next anchorage which would actually be near the main town in Santo, Luganville. There were standing waves as we traversed through the East pass and it seemed a little daunting but luckily we had timed it right with the tide so we moved along quickly. 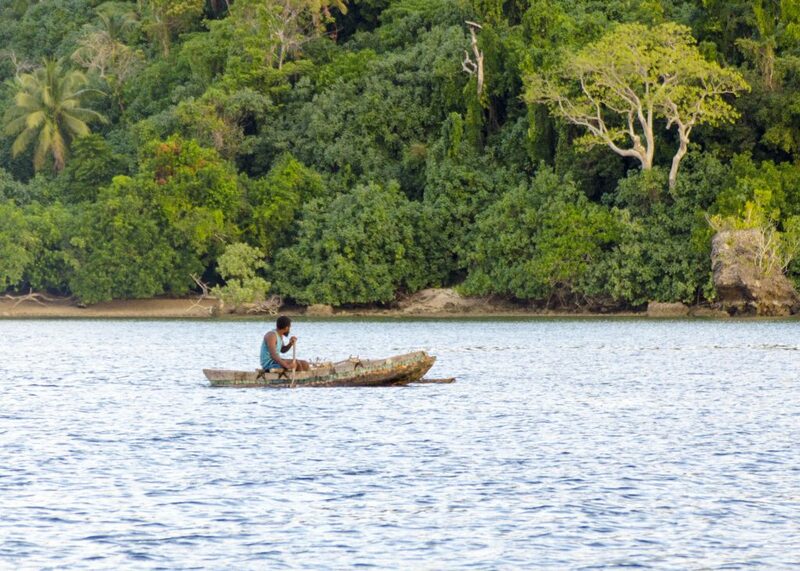 It was a long way from the Segond channel to Luganville but we managed to get there just before nightfall. The dated cruising book we were using said that this was a calm anchorage. That must have been a joke or written with some sarcasm. We didn’t sleep well that night at all, as we rolled back and forth. Early in the morning we blew up the dinghy loaded with our shopping bags and our empty propane tank and set off for shore, but it wasn’t to be. The dinghy motor would not start and the rolly bay was not a place where Denny could work on the motor nor could we safely row to shore. We really did not want to spend another night at this anchorage so we off loaded the dinghy, deflated it and set off for the next bay that according to the cruising guide was going to be protected, although by this time we were seriously doubting the information provided in the dated guide. The Guide was kind of right, Palikulo Bay was a beautiful anchorage, but their waypoints to entry it were off, we ended up snaking in between the coral heads on our own. 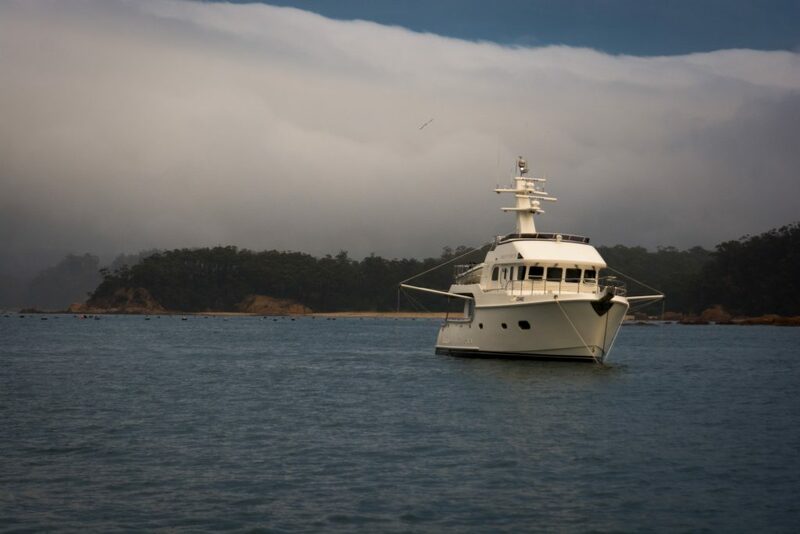 It was wonderful to have a nights sleep with the boat sitting still. The only other boat there was from NZ and left early in the morning so we were left to explore the area on our own. While Denny worked on the dinghy motor, I kayaked the bay and found a nearby golf course. Once back on the boat I googled the golf course and found pictures of the locals playing on the course in bare feet! Once Denny had the dinghy back in action we made it to shore with garbage, backpacks and the empty propane tank. We found the road and a truck stopped and offered us a ride to town. 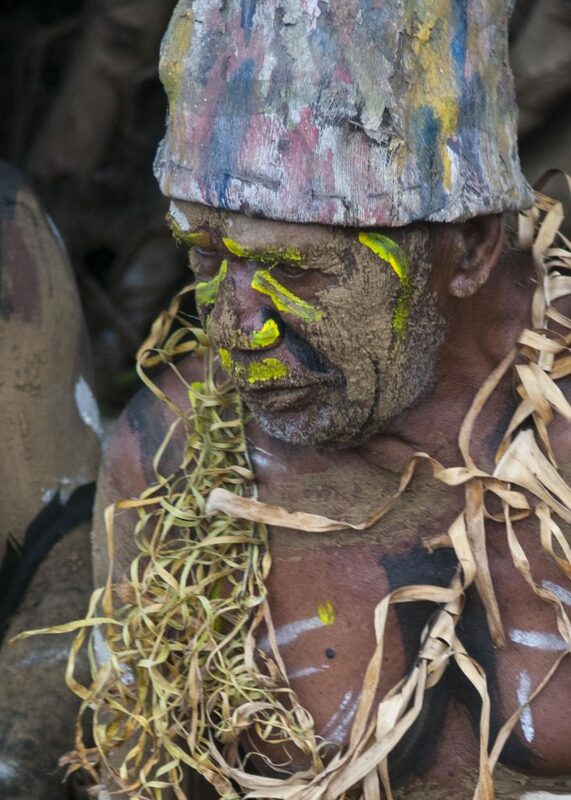 The passenger in the truck turned out to be a chief from one of the villages in Ambae. Ambae is a nearby Island that has an active volcanoe that just erupted requiring all the people living there to be evacuated. 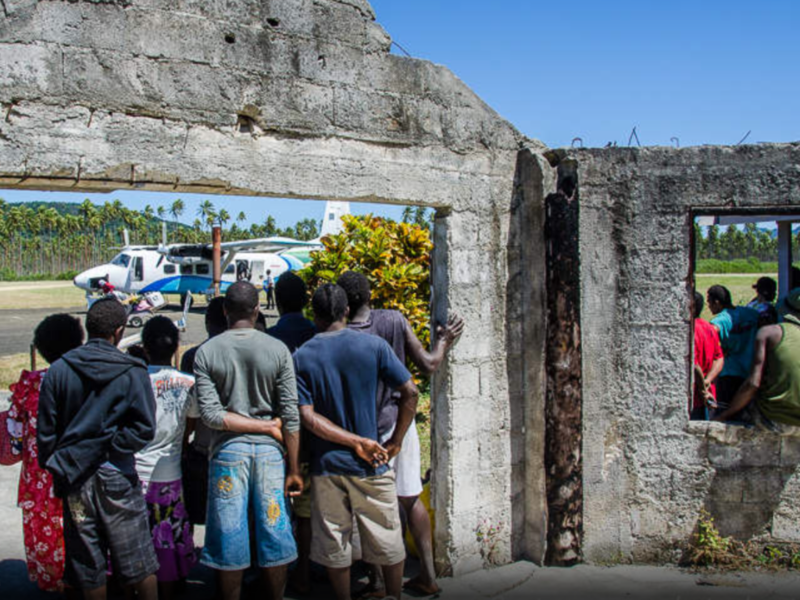 The chief was driving around getting a census count of the people living near Luganville so that he could get aid for the families from the Red Cross. People were living in temporary tents and were hoping to go back to Ambae by the end of the year. We were a little skeptical about that considering that some of the villages on Ambae were covered in 3 to 4 feet of ash. surrounding areas they offered to take us back to our anchorage in the afternoon. 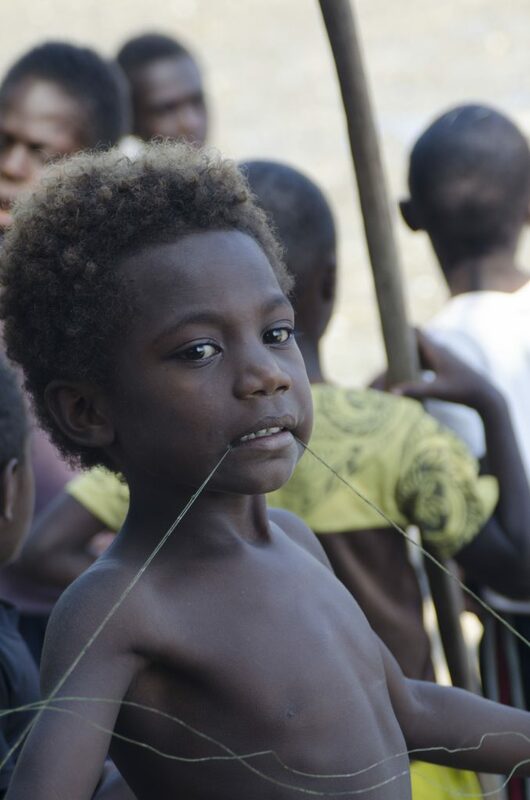 The generosity of the Vanuatu people continued to amaze us. 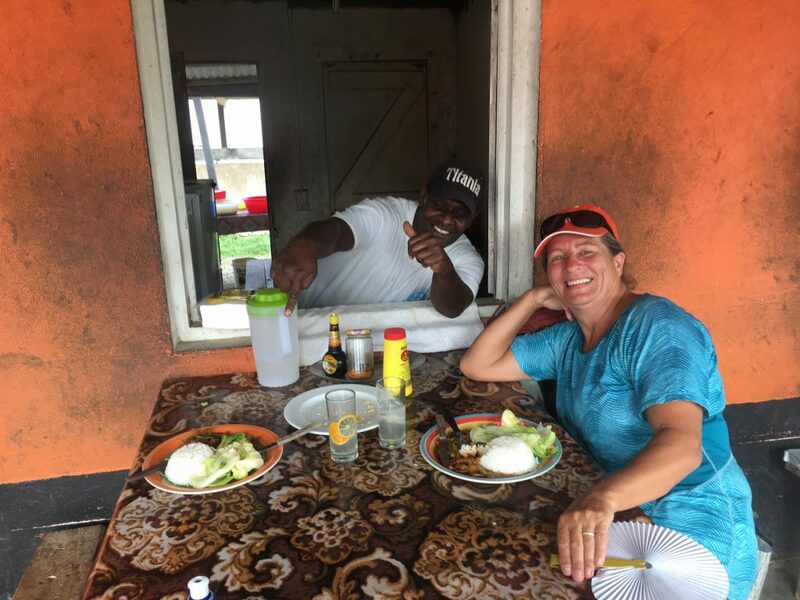 We had a simple lunch at the meal stand and replenished our fresh fruit and vegetable supply and made our truck rendezvous for the 20 minute ride back to our boat anchorage. We spent 4 more days exploring this bay which had World War II relics and white beaches. Peterson Point was our next anchorage and we used the waypoints in the guide to enter the narrow, shallow channel. Well, surprise, the waypoints were off. All I could see was reef all around as we entered the bay and heard Denny talking into our headsets that all we had was 2 inches below the keel and no option but to keep going. We made it through without scraping bottom although our nerves were a little frayed. We did use the dingy before we left to find a way better route to escape the bay. Denny fixed our anchor light while in this safe anchorage. 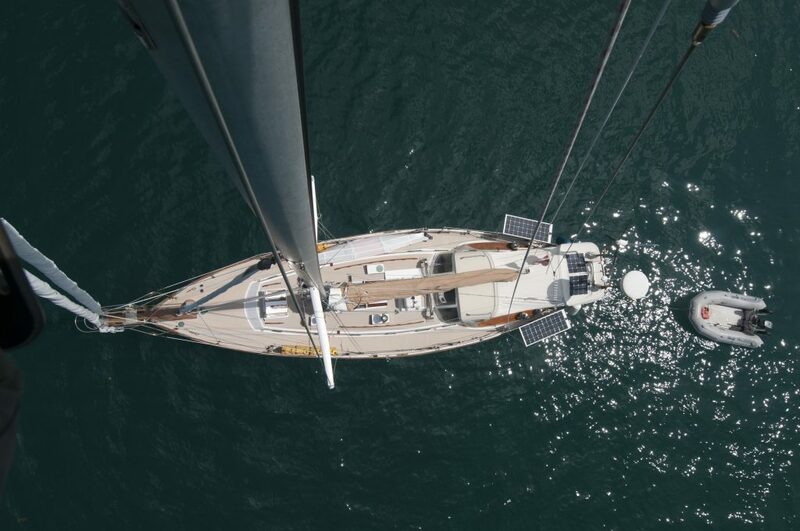 View from the mast! Peterson Point was a very protected little nook and there was a boat here that had been anchored here for the past 10 years (it’s there in the google map picture if you look closely). They had floated a 500 kg ( about 1000 lb) anchor from World War II remnants left behind, dropped it to where they wanted to be anchored and just chained the boat to it. They were a wonderful German couple in their late 70s with no plans to ever sail again. 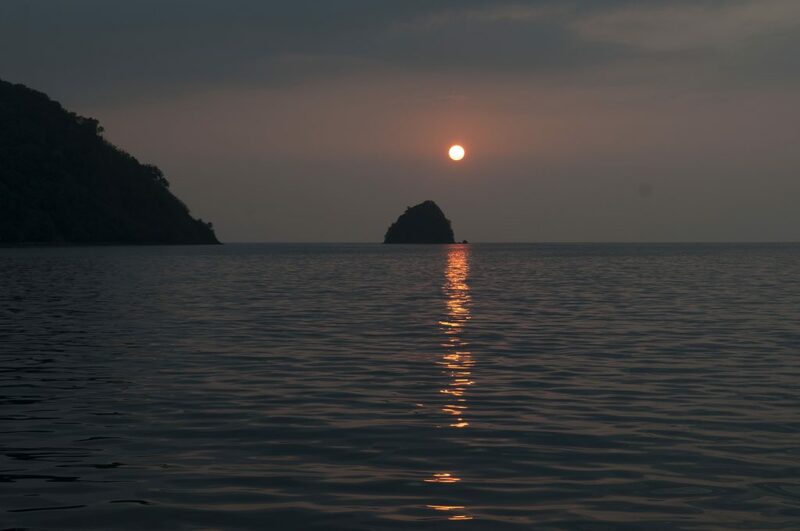 Many of the surrounding islands, including the one that the Octopus Resort mentioned in our trusted cruising guide have been bought by China and then soon after closed. The Islands are now “private” and had security guards ensuring nobody set foot on the shores. This little boat has been here for 10 years! 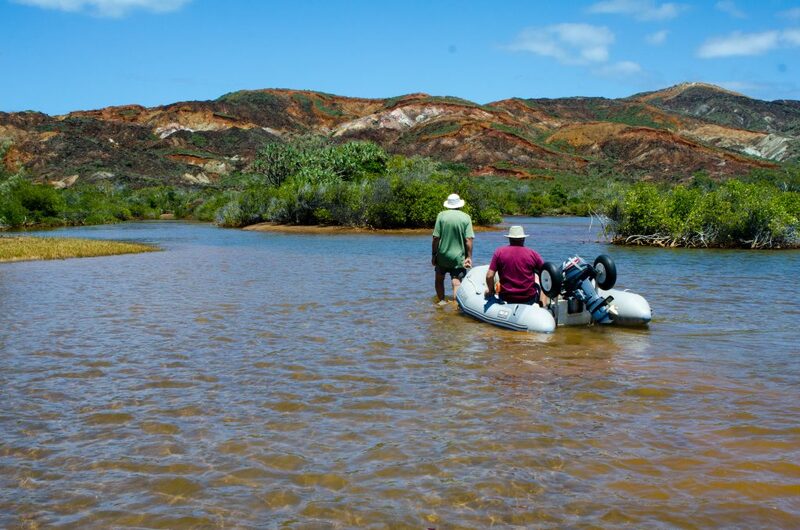 We kayaked or dinghied to both of the blue holes, Riri and Matevulu. The entrance fee was $500 Vatu which was about $5.00 US. 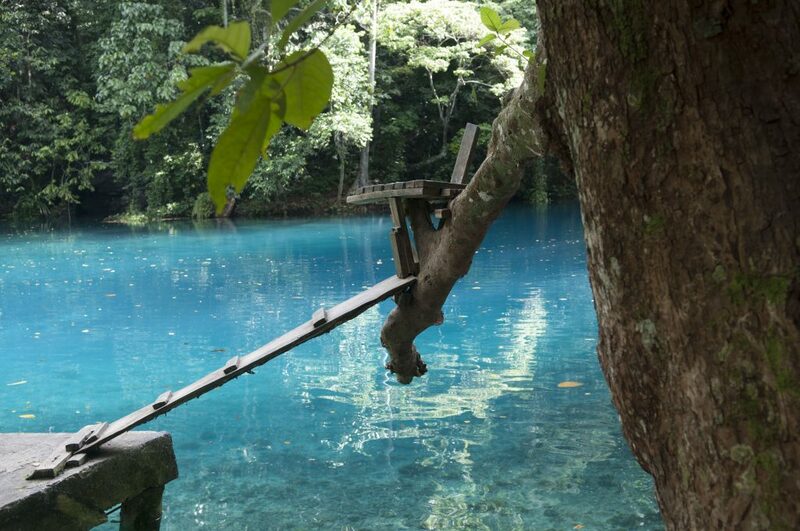 It is appropriately called blue hole as the water is an iridescent blue. 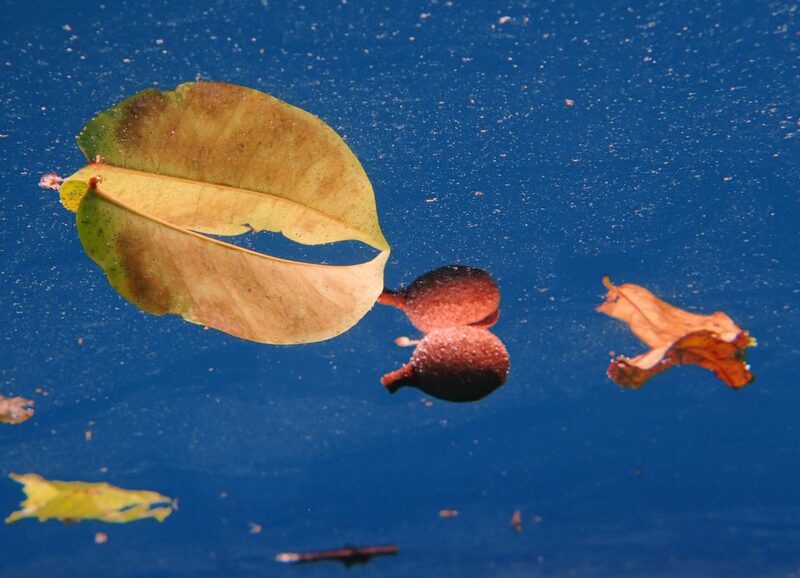 We had some fun swimming and taking pictures of floating leaves with our underwater camera trying to capture the colours surrounding us. We did find a little resort on the main Island where we had a nice lunch with a couple from Australia that had arrived a couple of days after us in their Catamaran. I celebrated my birthday in Peterson Bay and Denny splurged on a $100 taxi and took me to Champagne Beach as it was something I wanted to do. The beach was nothing like what I had imagined it would be. It was overrun by cattle and there were some run down stalls permanently set up but were probably only occupied if there was a cruise ship nearby. It was a beautiful, pristine white sand, teal blue water beach. Service men came to this location with bottles of champagne to celebrate the end of the war and that’s where the name ‘Champagne Beach’ originated. 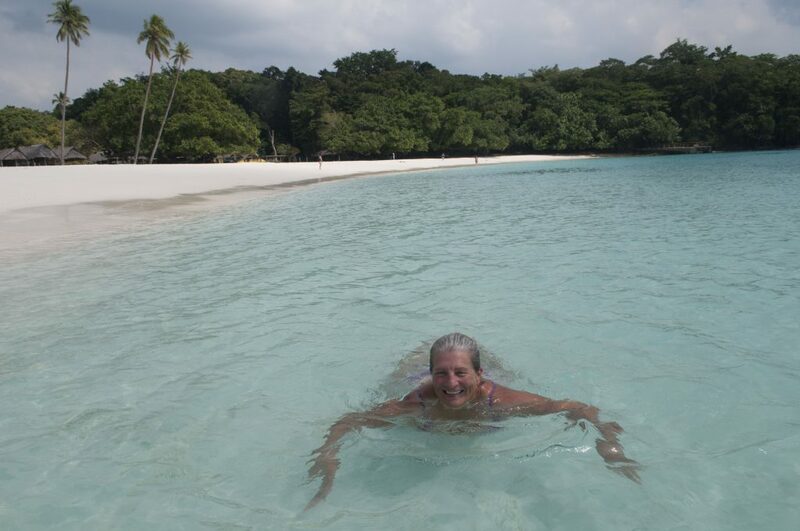 Our last anchorage on Santo was in Surunda Bay. From here we caught a ride with the manager of the cattle ranches. They grazed 6,000 head of cattle on 6,700 acres. All the cattle went to markets in Japan. 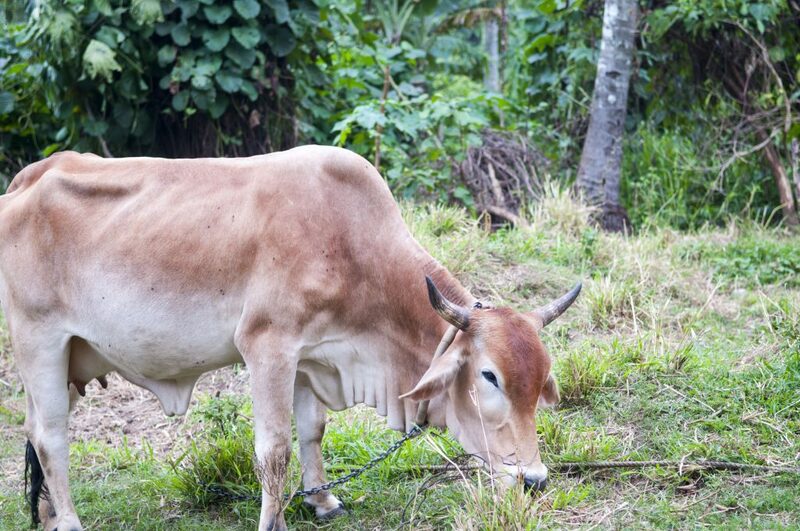 The beef in Vanuatu is very good, some of the best. 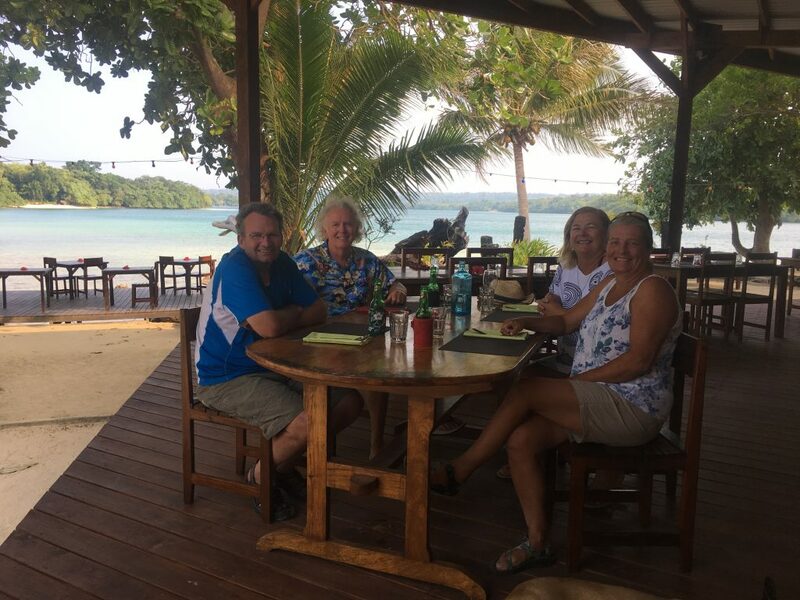 We were headed back into Luganville to re-provision as we had our friends Pete and Mel from NZ coming for a visit in a couple of weeks. Luganville is the largest town in the neighboring islands so that’s where we had to go again. Once we had filled our backpacks and had lunch at the market we filled our Gerry can with gasoline for the dingy. We then sat at the side of the road and managed to flag a taxi for the trip back to the boat. The taxi driver was happy to take us to our anchorage as he lived nearby there but had a couple of stops to make. First, put a few liters of gas in, with appeared to be one of the only two gas stations in the town. It was Grand Central Station at the pumps with cars strategically positioning themselves in a line for the next fill up. Some cars seemed to have skipped the line but nobody yelled or honked the horns. Very civilized despite the chaos. From there it was to next station to fill the tires with air and that was as chaotic as the pumps. Replacing well-worn tires didn’t seem to the norm here, just keep adding air. Once we were on the way and about half way to our destination the taxi driver asked if it was ok if he stopped at a Cava bar that belonged to his cousin. He would be our host and buy us a Cava drink. What could go wrong with that idea. We did stop and Denny bought all of us a drink. We met his “cousin” who owned the Cava bar and also had some property in Australia. He seemed very well read, articulate and knowledgeable and Denny was bold enough to ask him what he thought of all of the property in Santo being purchased by China. He had some strong opinions and was troubled by what was happening. They gained their independence in the 1980s and were slowly losing it now to the Chinese in debts to be later paid and in property being purchased. He pointed out that the Prime Minister of Vanuatu had been invited to China and given the red carpet treatment almost annually but countries like NZ and Australia had only invited him twice. (this is not a fact that we did any research on so cannot vouch for it being true). 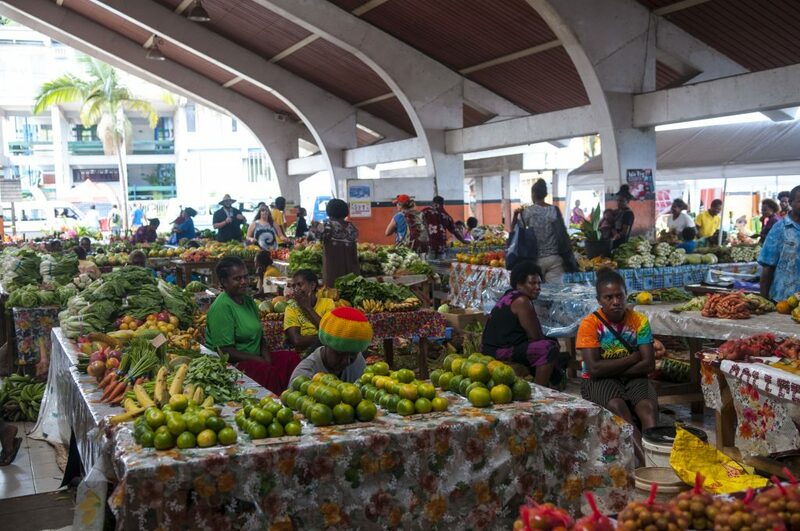 He found it disconcerting and really had no solution to what was happening so long as the Vanuatu people had a short lived, short sighted economic benefit from this arrangement. We talked about this for quite some time and he offered us and his ‘cousin’ the taxi driver another Cava shot ‘on the house’ before we left. It was strong Cava and I could feel the effects and so could the taxi driver who drove us back at a snails pace with all other vehicles passing us. Luckily we made it back alive. 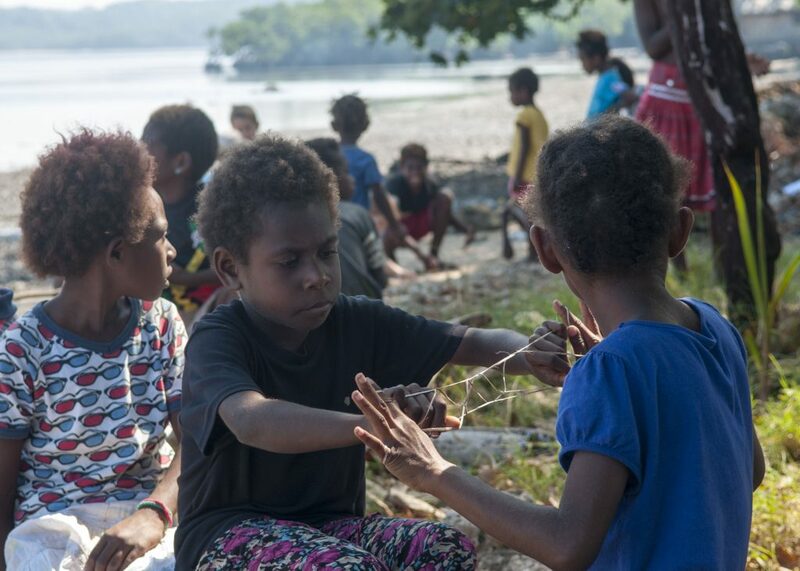 But the highlight of this anchorage were the children from a nearby village that we made friends with. 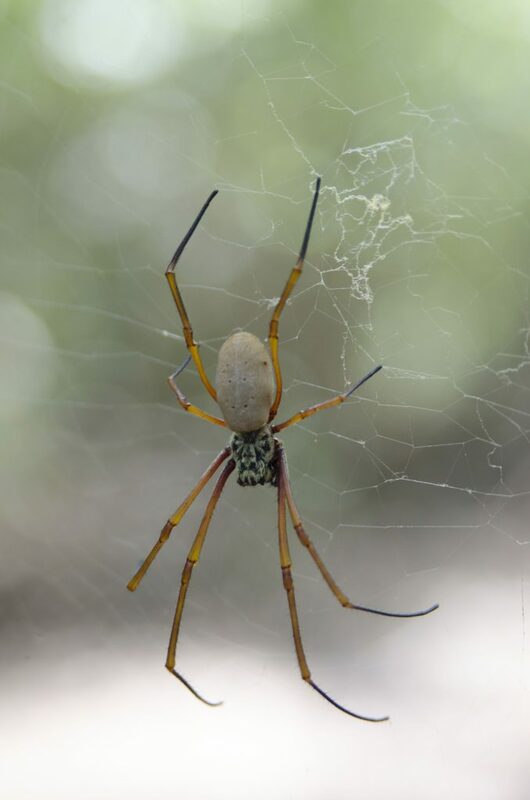 They had waved me over to say hello while I was on one of my kayaking explorations. 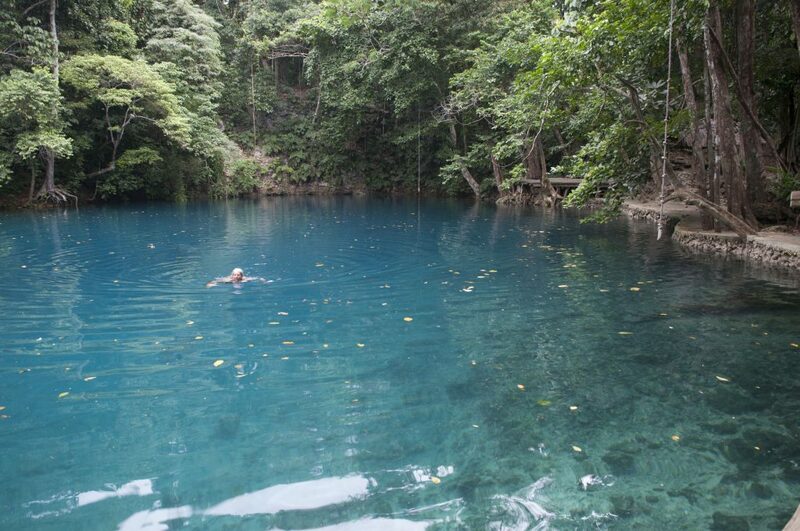 I knew there was another ‘blue’ hole nearby so I asked if they could take us to it. 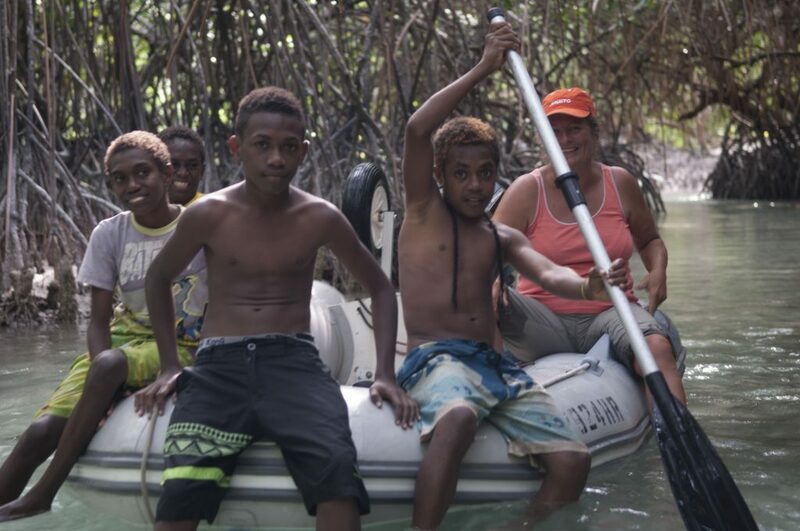 We brought the dinghy over, loaded it with the 5 kids and we made the slow trek to the nearby blue hole. 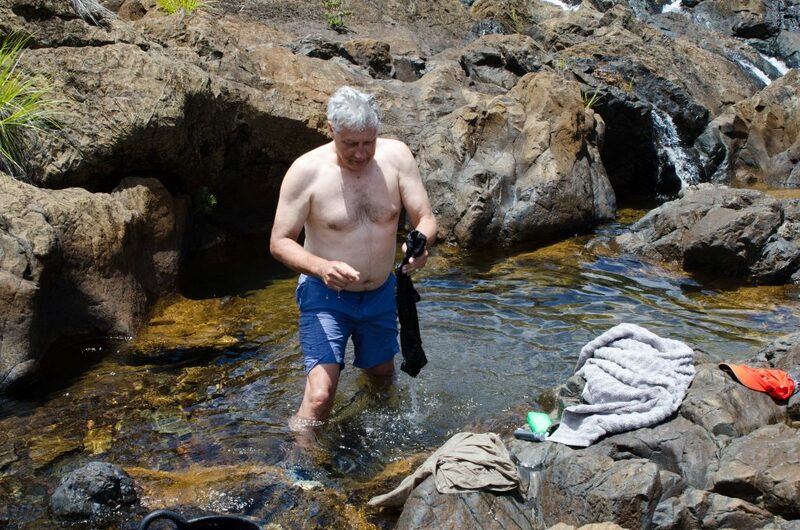 It was really a concrete swimming hole fed by some fresh spring water. Denny was quick to jump in but the kids just hung by the edge and wouldn’t go in. 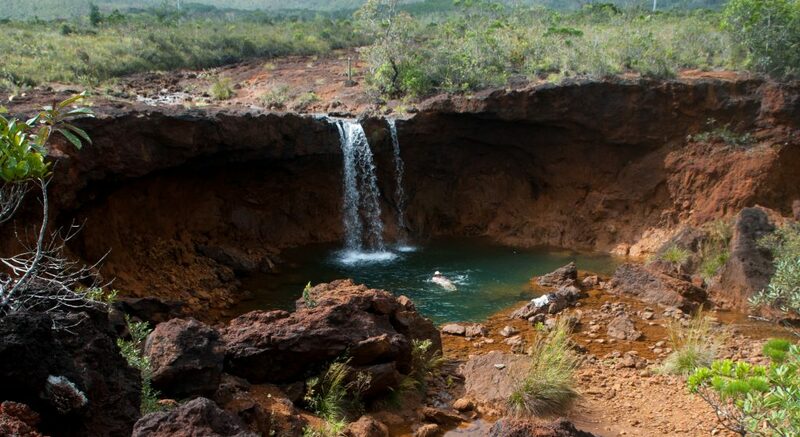 It took me a while to realize that swimming in the ‘blue’ hole was forbidden. The kids wouldn’t break the rule but were afraid to tell us about it until I asked a direct question as to whether it was ok to swim. They said we had to make a cell phone call and ask for permission and probably pay a fee. The kids visited Landfall and we gave them Coke popcorn, cookies and they watched a movie. They were amazed at all our storage lockers and the canned goods we had and they were amazed at the great tasting fresh water that our watermaker made from seawater. After their visit to our boat they were anxious to give us a tour of their home. They showed us every tree, bush, garden that offered fruit or veggies that they could eat, in contrast to our canned food lockers. Their little sister kept collecting flowers and giving them to me. We got a tour of their playground which were the remains of an old house/café. It had some local drawings on the walls which they proudly showed off. Everywhere there was shattered glass and they walked around in their barefeet without a care. 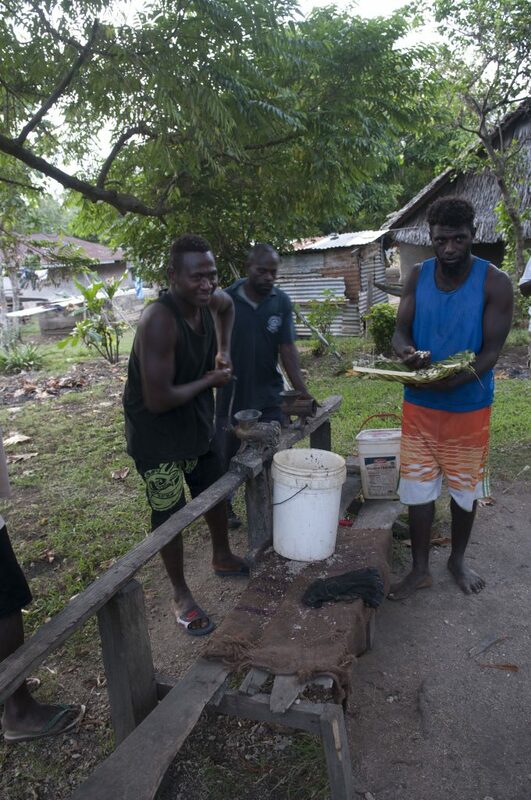 They promised to drop by the next morning with some fresh coconuts and Navale nuts that they had skillfully peeled and it tasted like almonds. It was their way of thanking us for the popcorn and coke. They were energetic, fun children and we swam and hiked with them. They had lots of free time as they were on a 2 week school holiday and were basically left on their own while their parents worked. They referred to me as the ‘Queen’ as instructed to by Denny and they loved it and were always concerned for my welfare during the hikes and swim. They found us a harvest of wild lemons that looked like oranges but tasted like lemons. Denny even managed to convince them it was oranges and their expressions were hilarious as they bit into the sour fruit. I told them his nickname was the ‘menace’ for a very good reason. It was sad to have leave these resourceful, amusing, amazing, kind, happy, generous kids. It was an amazing 5 days surrounded by white beaches, turtles and happy children. Our friends from NZ Pete and Mel were flying into Malekula to visit us for 10 days so we had to leave Santo and head back South. It was a sail against prevailing wind so we had to pick a weather window. 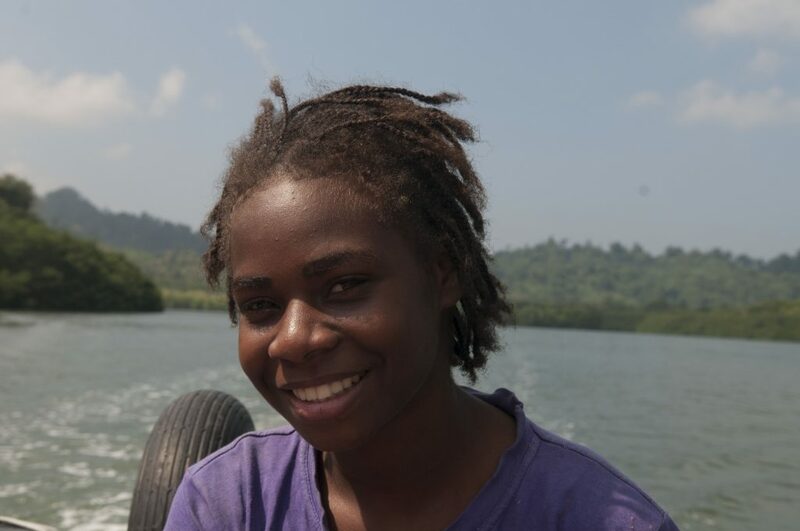 And we picked a great one that allowed us to go all the way to south east Malekula, Port Sandwich. 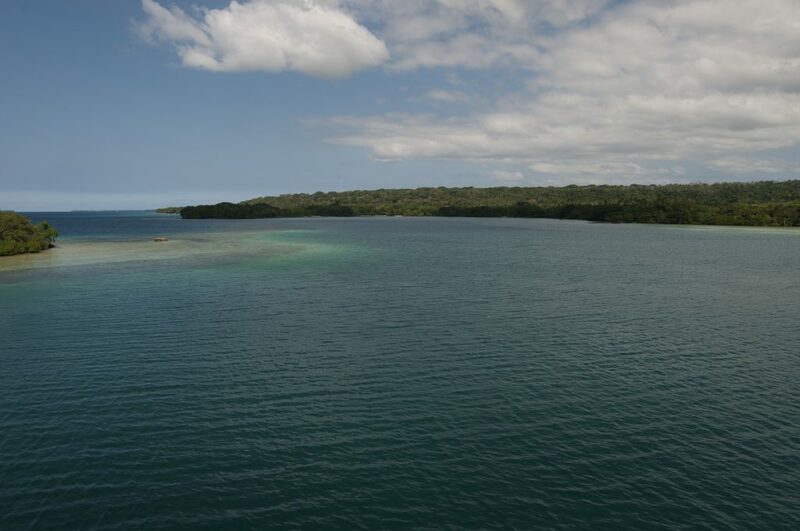 It was a very protected anchorage and there were 7 sailboats there when we arrived, the most we have seen since we left Port Vila. 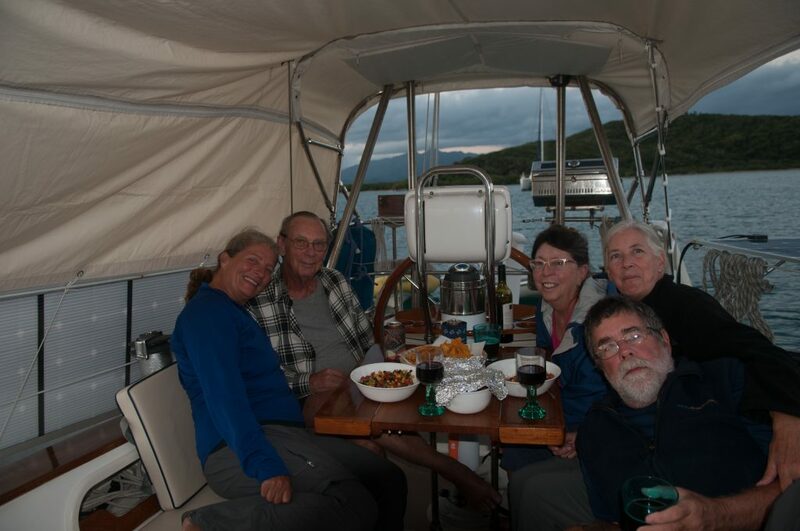 We were only there for 2 days and only got off the boat to have happy hour with a Canadian couple on Katie M II, a boat that was in Riverside Marina NZ while we were there. From here we could easily sail in a northern direction to Lakatoro to pick up our friends who were arriving in a couple of days. 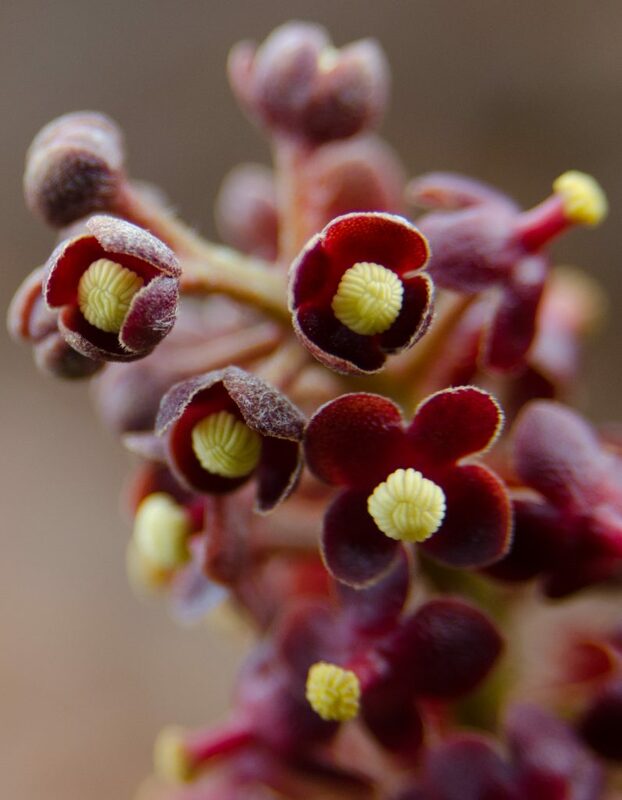 Our next destination after the Maskelyne Islands would be the West coast of Malekula Islands. 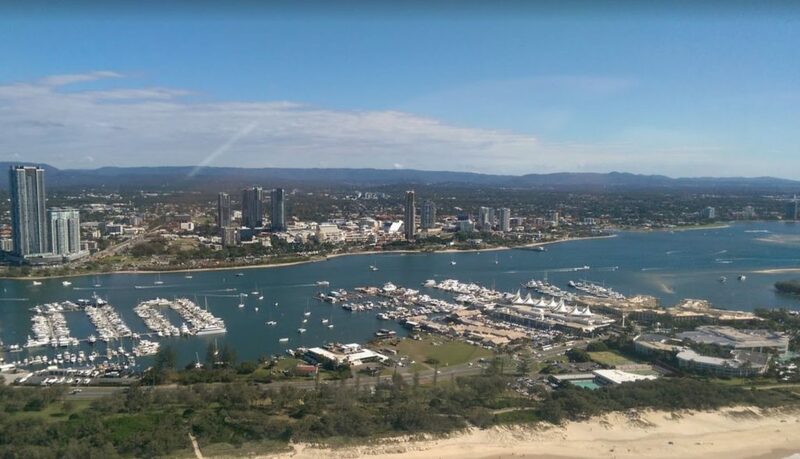 Most cruising boats would prefer to sail by the East coast and it’s probably a much more scenic and anchoring friendly coast but we like stepping off the beaten track. A part on our Windlass had broken at our last anchorage so now when the anchor had to be hoisted using power I had to be down below with my head in the chain locker and keep the tension on the chain by pulling it into the locker. It didnt require a lot of strength just continuous pressure and if there was 150ft of chain out, it was an arm workout. 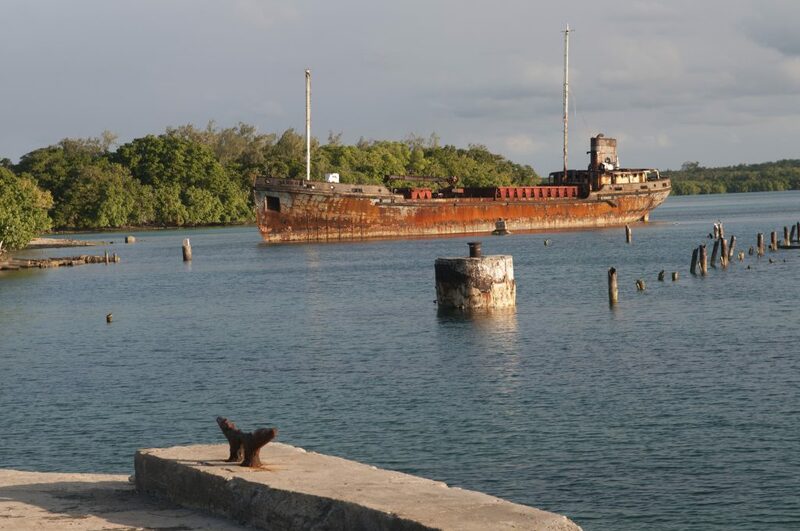 The Windlass part had been ordered and was scheduled to arrive in Port Vila in a month or so. Anchoring in deep water was not fun. Lunar Island was a beautiful peaceful anchorage with a steady stream of fruit bats flying overhead as the sun was setting. It’s worth clicking the Google map link to appreciate the beauty of the anchorage. It was only a quick overnight stop so we didn’t take any anchorage photos. South West Bay anchorage was a large, open bay but very shallow, so great for anchoring. As the prevailing wind is from the East or South East the open bay on the West coast was pretty good for the light winds we had. 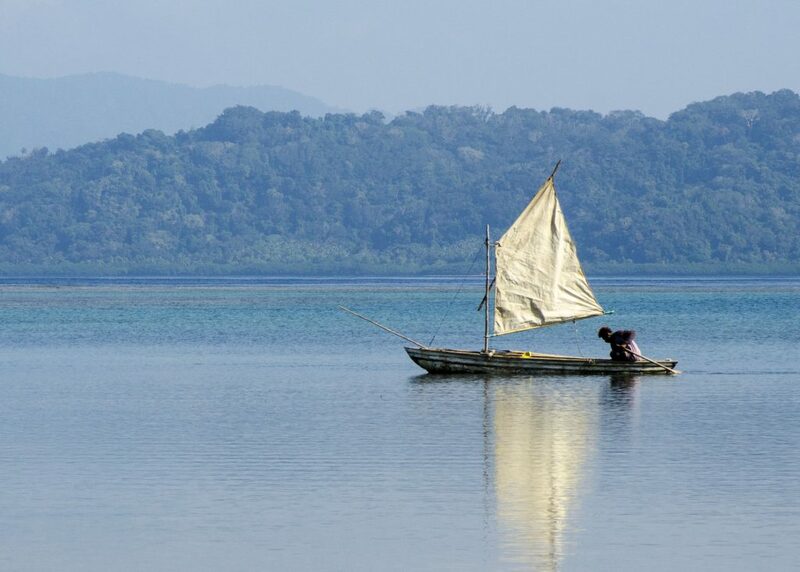 The highlight for this anchorage was the large lagoon which we explored extensively by dinghy. 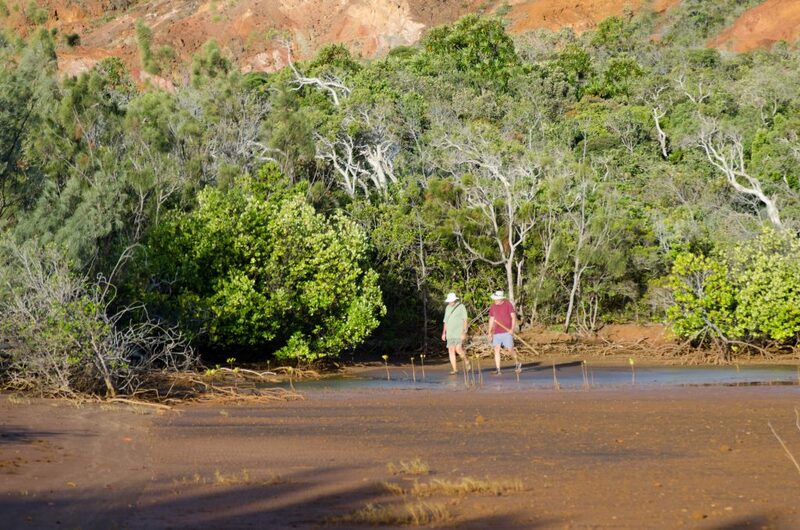 The locals traversed the lagoon with their dugouts to get to their farming plots. 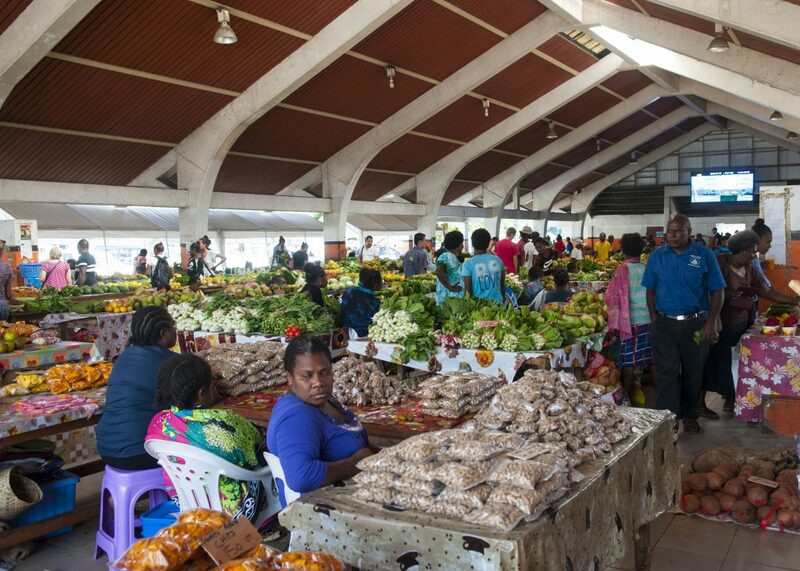 We came upon a very nice family with their dugouts loaded with their harvest and with no hesitation, they offered us a large Papaya and a large bundle of Island Cabbage. I had never tasted Island Cabbage before and although a little slimy when cooked it tasted much like spinach. Denny invited the children to ride with us in the dinghy back to the village. It was a half an hour paddle by dugout which was sitting pretty low in the water with all their vegetables, momma, kids and dog. We made it back the same time as we had to take the long route due to shallow, low tide waters. The kids, although a little shy and spoke a little French only, had great fun driving the dinghy. We had dinner at Chief James house. 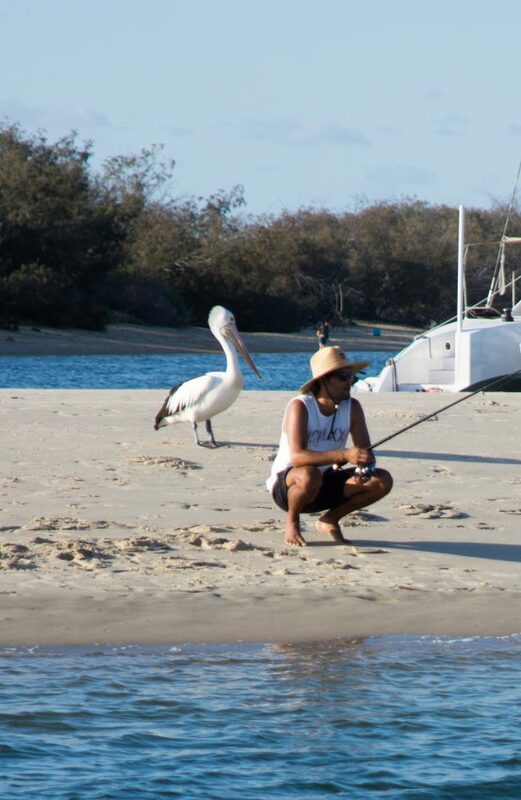 He had extended an invitation to share a meal with him and his family after I brought in a freshly baked coffee cake and we asked for permission to explore the lagoon. 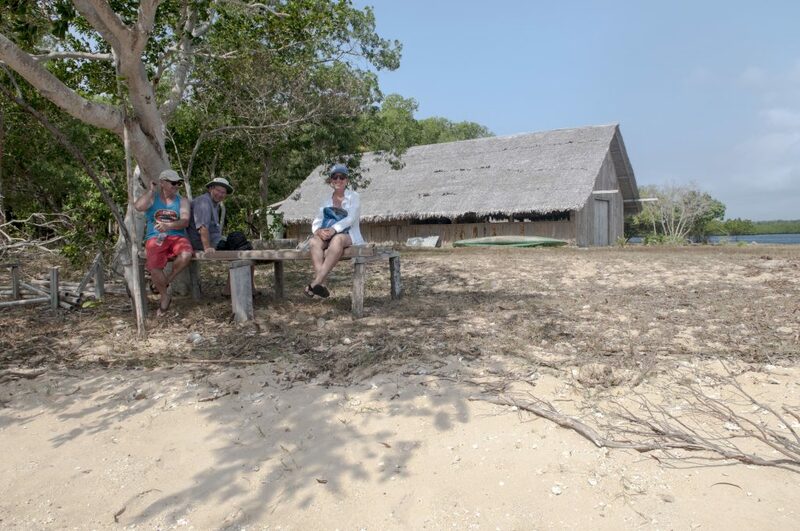 We arrived at their hut and we were invited to sit with them and we were given peanuts on the shell before dinner. The family consisted of the chief and his wife, the chief’s dad and 2 children. I brought along a curried sweet potato and pumpkin dish which they seemed to enjoy. but other than that, there was no joy in the dinner. Only Grandpa spoke and ate with us, everyone else sat further apart and focused on a large flat screen TV which blasted a French show. 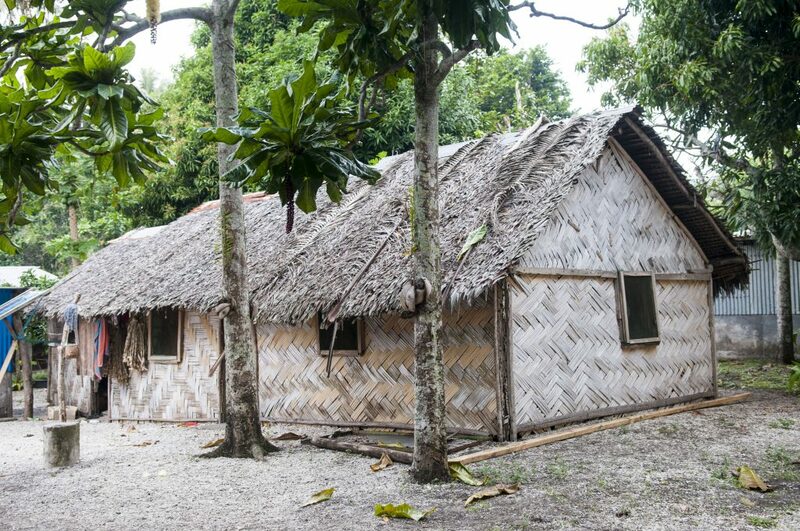 The chief, scooped up a large portion of food for himself but set it aside as he was high on Kava and his wife lingered by the door socializing with people that passed by the house. It felt like an obligatory dinner invitation and the main meal was Cassava Lap Lap packets and fried papaya. Denny and I drenched the packets with our curry sauce to make it edible. 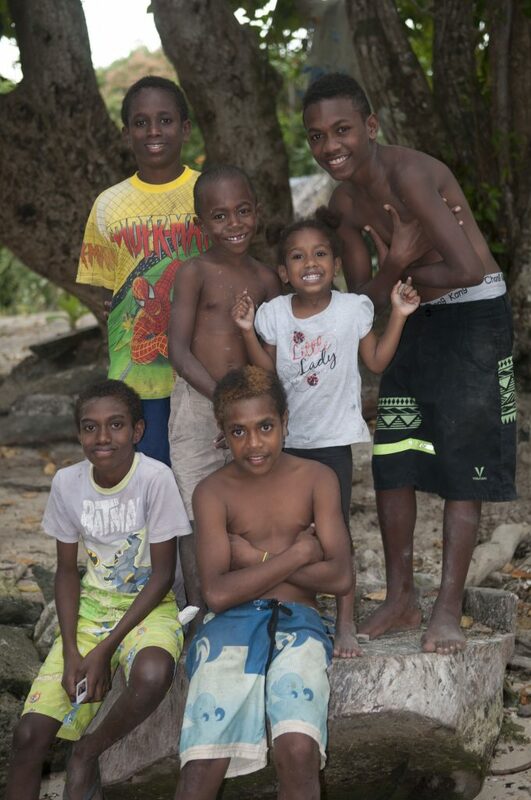 Maybe our expectations of the village welcome was a little high after meeting the wonderful family in the lagoon. The anchorage did offer some nice kayaking opportunities and beautiful sunsets. 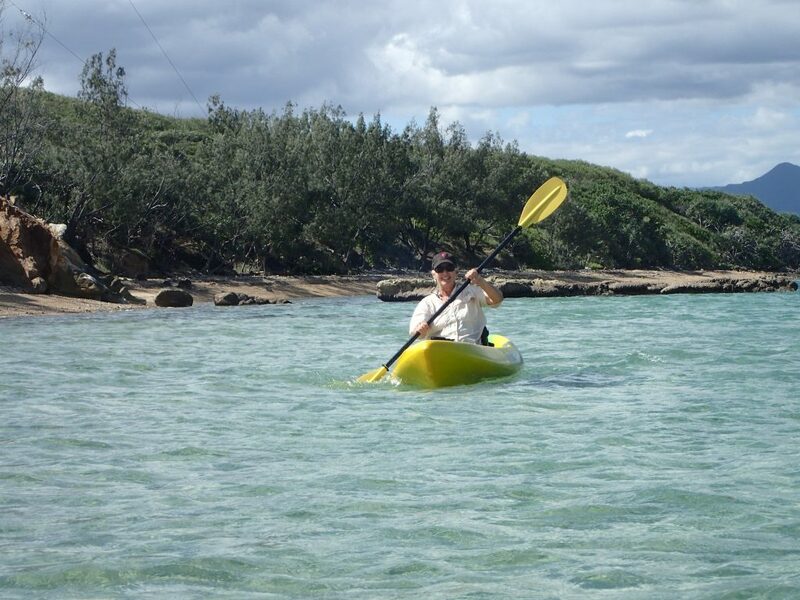 Malua Bay didn’t offer much protection either but again we were blessed with calm winds. 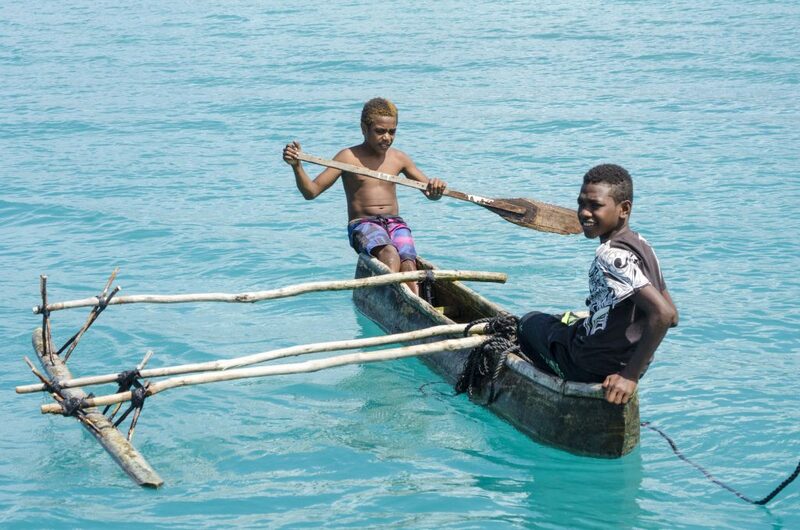 As soon as we were anchored we were welcomed by 2 locals each in their own dugout canoes and both stayed on opposite sides of the boat competing for attention. At last I had to make a choice and promised one local, Melten, to meet him on the beach in the morning so that he could guide us to the ‘blue water’ hole nearby. swimming hole with a small waterfall that one could slide down on and some ledges that offered some diving and jumping opportunities. Melten was a great host and didn’t ask for any money to be our guide. He did ask us if we wanted any fresh produce for trade for school supplies but we offered to buy it. He came on board offering some fresh lemons and apologized about not being able to bring some fresh tomatoes which is what I really wanted. We spent a great afternoon sharing a little about each other’s way of life. 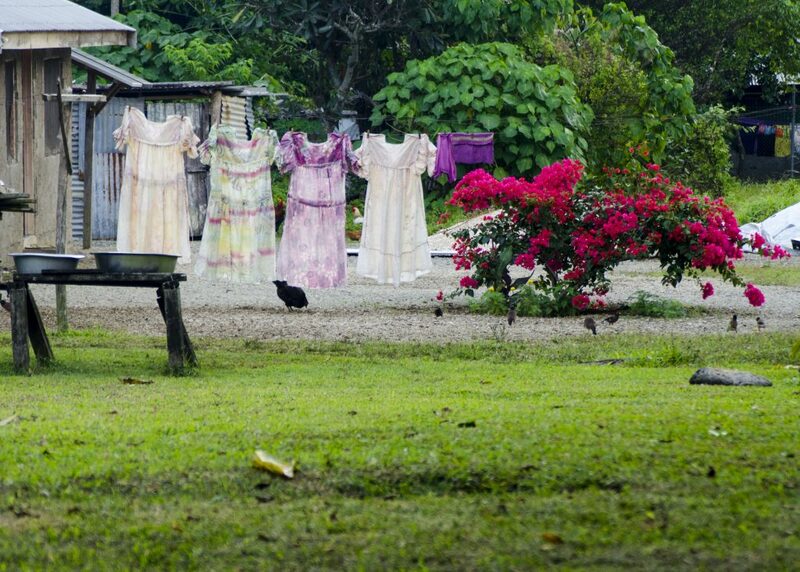 It was here that we learned that when couples marry in Vanuatu a dowry of $1000 US has to be paid to the woman’s oldest brother or the father in the case where there is no male sibling. 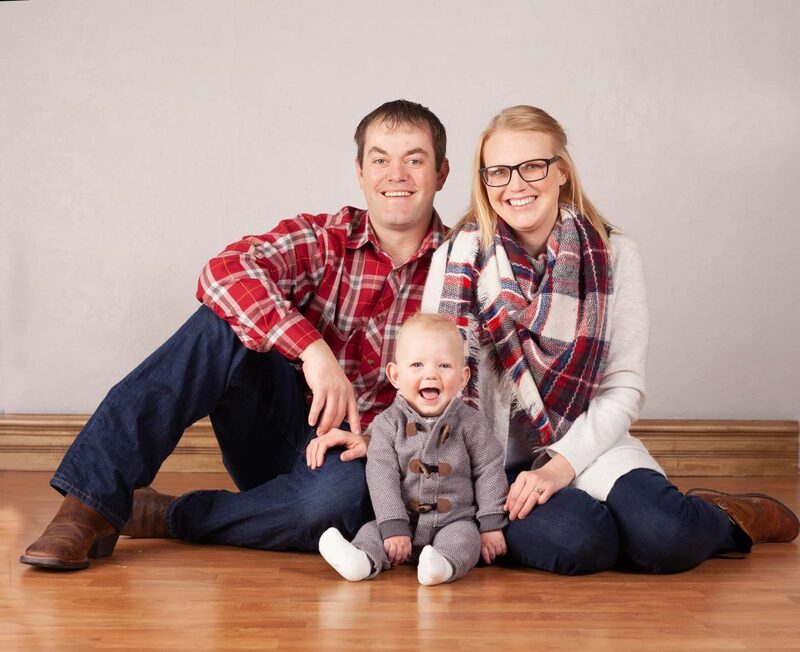 So needless to say Melten courted his now current wife for a long time to make sure she would be a good wife. We later learned that in most cases the village contributes to the dowry fund. We also learned that they pay taxes on the Copra they sell but get no pension and very limited government services in return (ie. minimal health care). They are also required to pay $1000 US for school fees for each child. A lot of money for them to accumulate considering their subsistence living. Requests for donations for school fees seemed to be a recurring theme at most village anchorages that we went to. He read the cruising guide’s description about our anchorage there and thought it was hilarious that we should keep an eye out for Dugong. I guess the guide should be updated to exclude Dugong sighting at this bay. Melten seemed to enjoy learning about our culture as much as we learned about his. 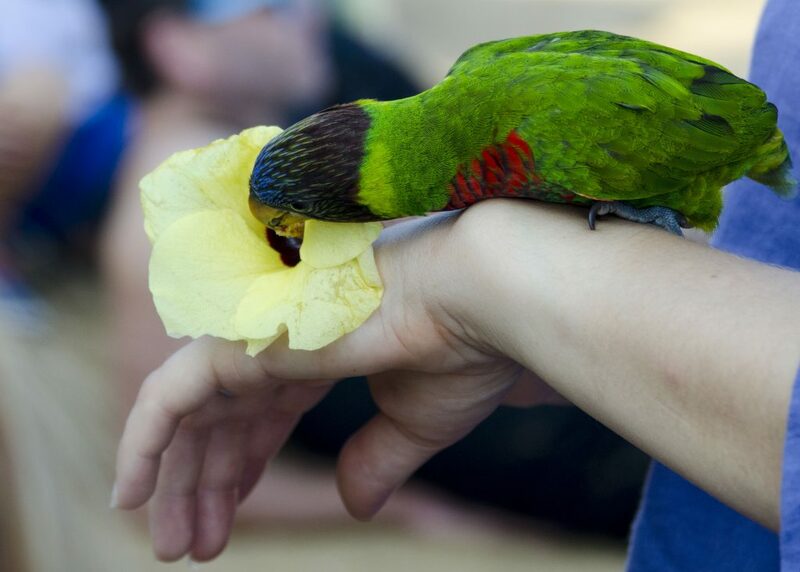 That is what we really love about cruising even though the constant requests for donations can be a little discouraging. 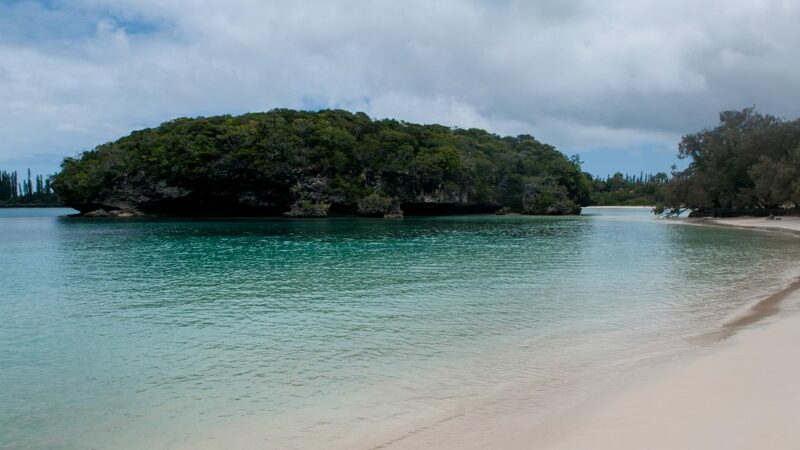 Our visit to the Maskelyne Islands would have ticked almost all our ‘bucket list’ boxes for our visit to Vanuatu if we had boxes to tick. If it had had a volcano we would have stayed here for the remainder of our visit to Vanuatu. I will say that there was one distasteful incident which happened on a Catamaran anchored near us. 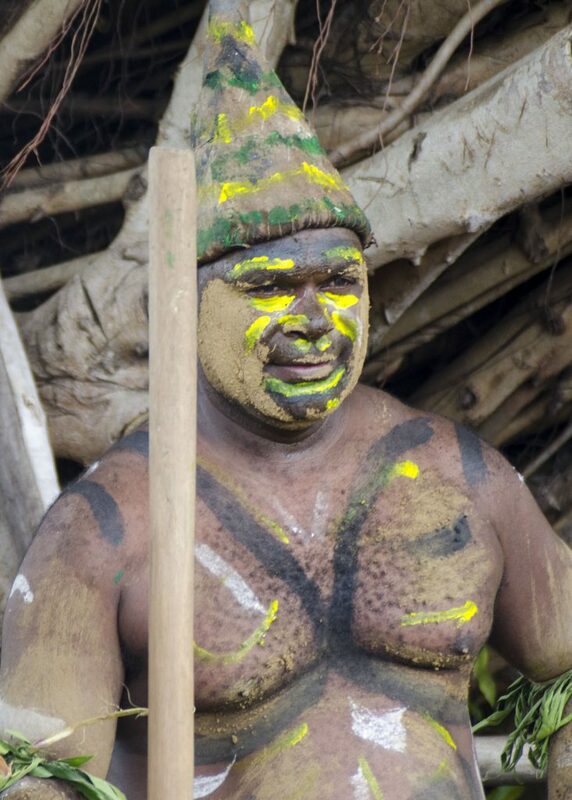 A local that introduced himself as the chief dropped by while we were visiting on their boat and demanded that we pay a fine for snorkeling in Tabu waters. As our host family had told us where to go for snorkeling and hadn’t mentioned any restrictions, we refused to pay the $20 fine. We promptly left the Catamaran not wanting any further discussions with the local. We were informed the next day that he had been an impostor. Although infrequent, there are such incidents that give the village as a whole a bad reputation in the cruising community. 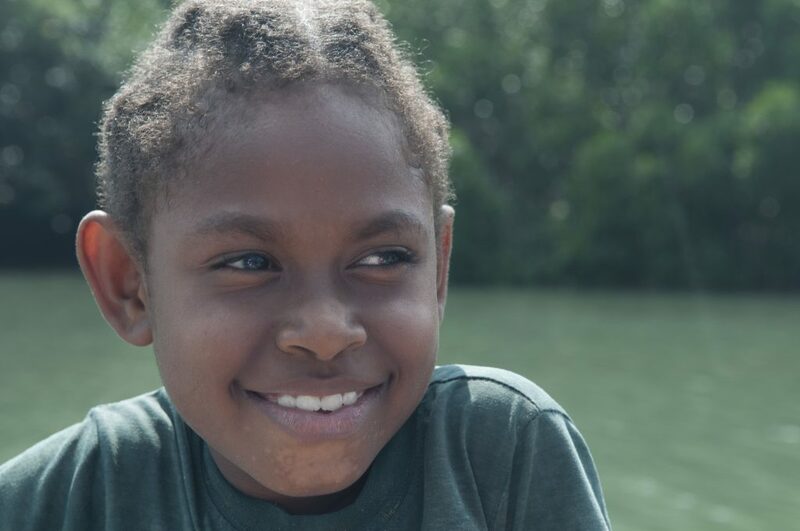 I included this story at the beginning as it really was just a little blip to an otherwise beautiful experience and probably our favorite Vanuatu anchorages. And we loved the people. If ever in Uliveo have Stewart give you a tour of the villages. Great stories and a wonderful personality. 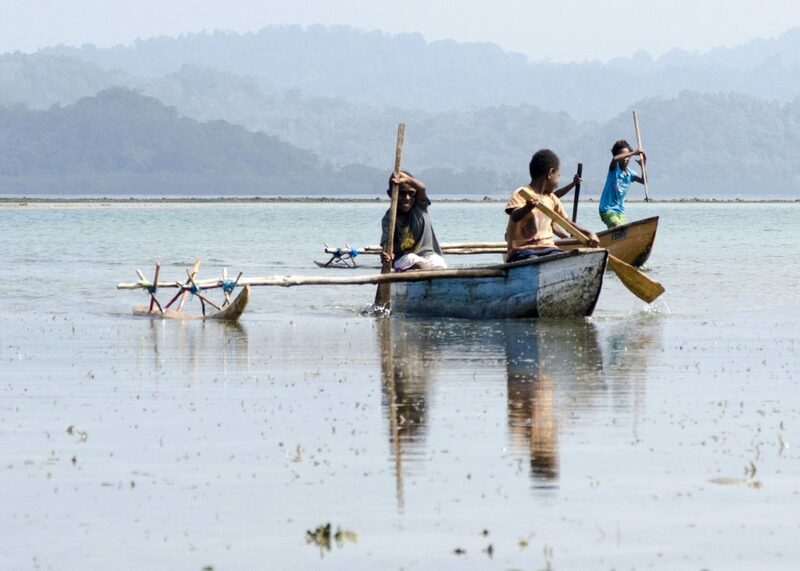 The dugout, main means of transportation by paddle or sail in Uliveo. No cars! We arrived at Uliveo island by mid afternoon and now had to find our anchorage point. The 2015 cruising guide showed an anchor icon in one bay but the waypoint indicated the anchoring in another bay. Hmmm, which one is correct? A local in a dugout came by our boat and volunteered to show us the pass. We invited him on board and then he proceeded to try to help us but couldn’t say which bay we should anchor in. Our first pick turned out to be a bust as it shallowed up really fast and there was coral everywhere. Stewart, our visiting local suggested that we try the next bay, which is where other visiting boats have anchored. It was a little nerve wrecking getting in as it became shallow quite quickly before it dropped off again. Stewart had no understanding of how much water our boat draws being used to paddling a dugout most of his life. He gave us no warnings about how shallow it would get, just three feet under the keel at one point, or where we should really anchor. 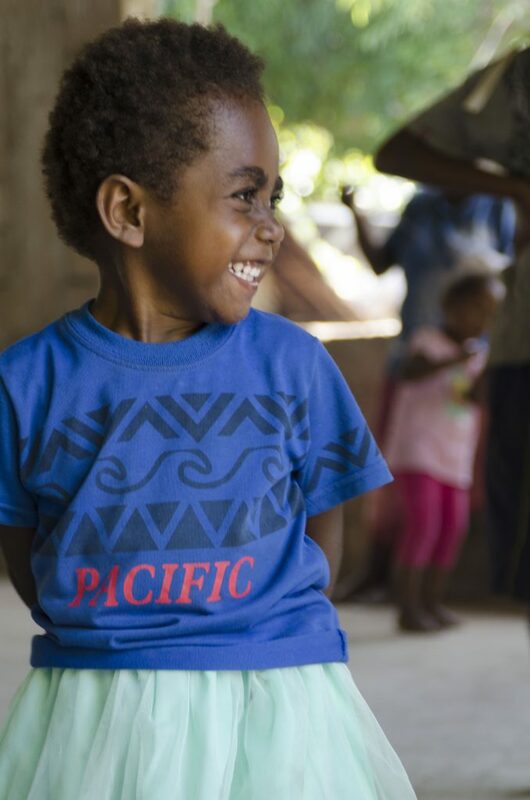 Part of his reluctance to say anything may be mainly due one of the culture habits that became very apparent to us, Vanuatu people just don’t like to give you ‘bad news’ or ‘negative answers’. They would rather say nothing or tell you what you want to hear. 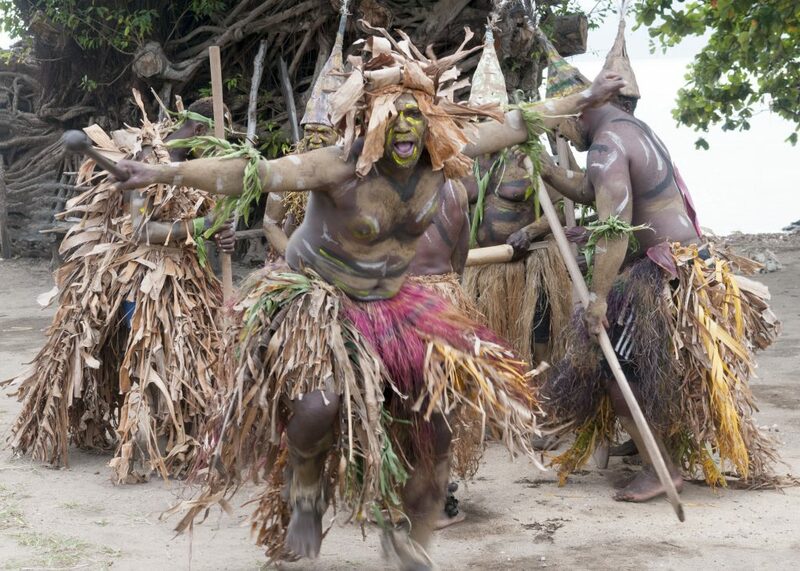 And this has been a recurring theme while visiting Vanuatu and sometimes it got us in trouble. We did anchor nicely in a very well protected hole. 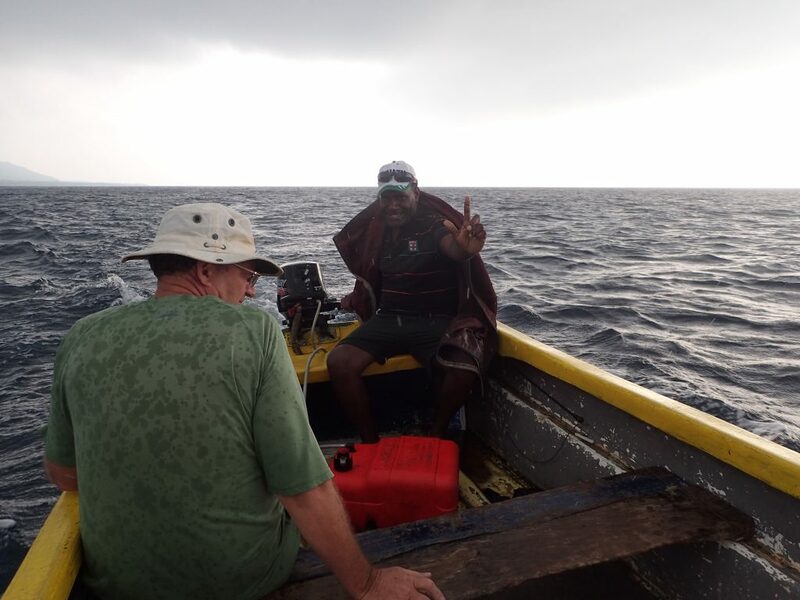 Shortly before arriving, we had caught a pretty large Barracuda and as we had some concerns about Ciguatera poisoning we gave most of the fish to Stewart. 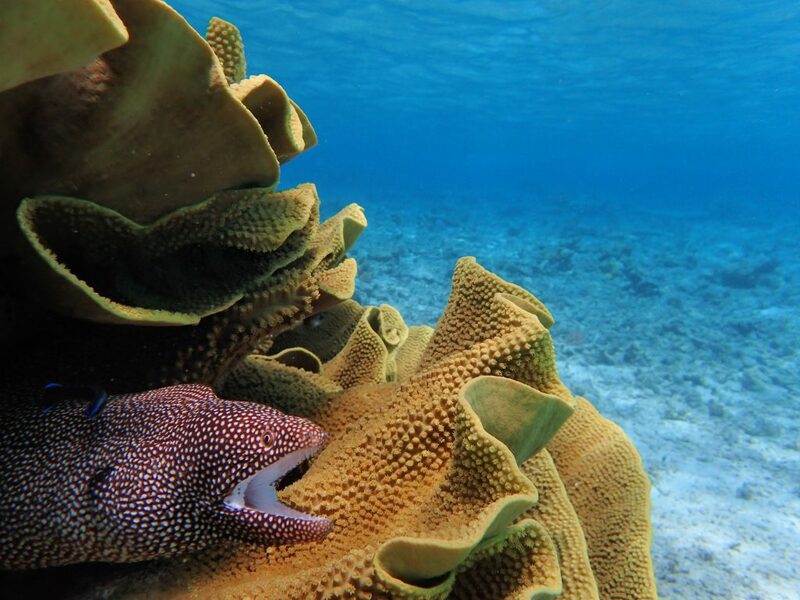 Google will tell you that Ciguatera poisoning is caused by consumption of reef fish contaminated with ciguatoxin which originates with certain algae associated with coral reef systems and accumulates up the food chain from small herbivorous fish to large carnivorous fish such as the Barracuda. 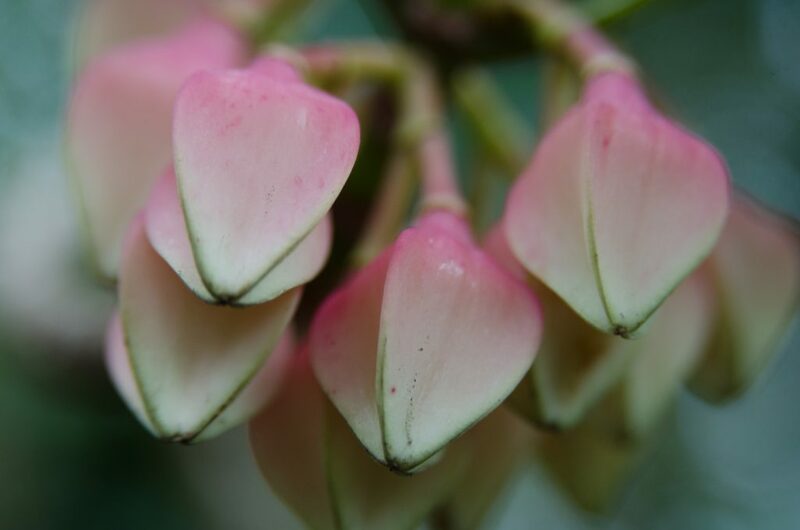 It has no specific color, odor, taste but the effect of the poisoning can make one feel ill for a long time. When we asked whether they ate Barracuda the answer was “yes”. 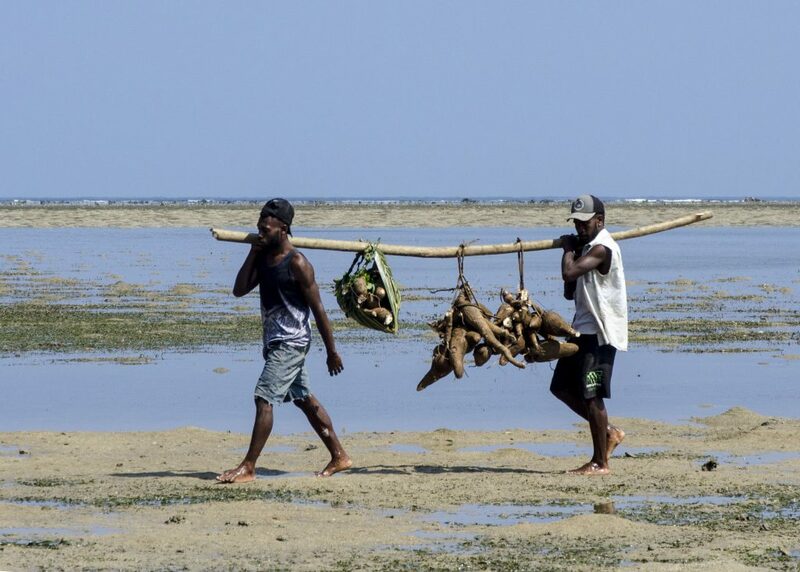 When we asked whether Ciguatera was a concern the answer was “sometimes”. 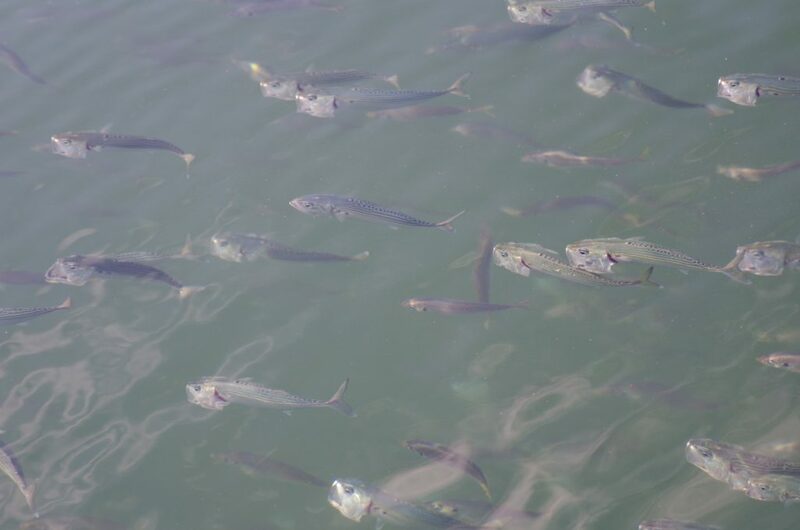 It turned out that the fish was fine and they enjoyed every morsel or so they told us. 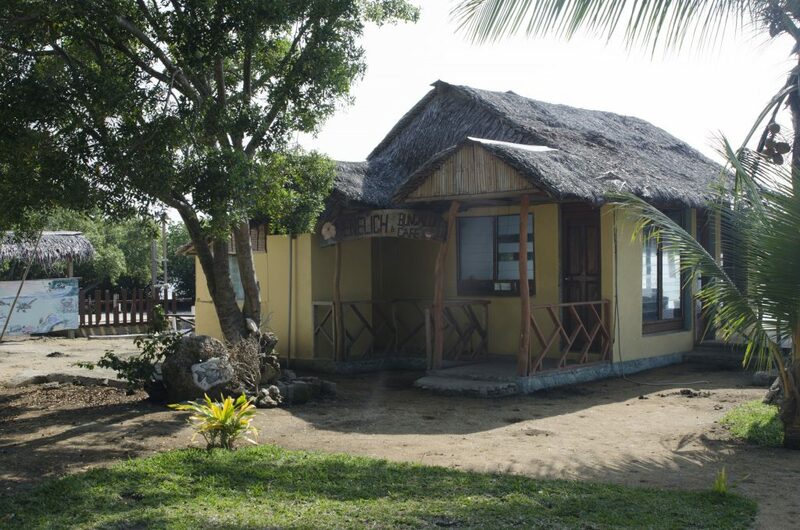 There was a small basic resort on the island and there were some NZ visitors staying there. 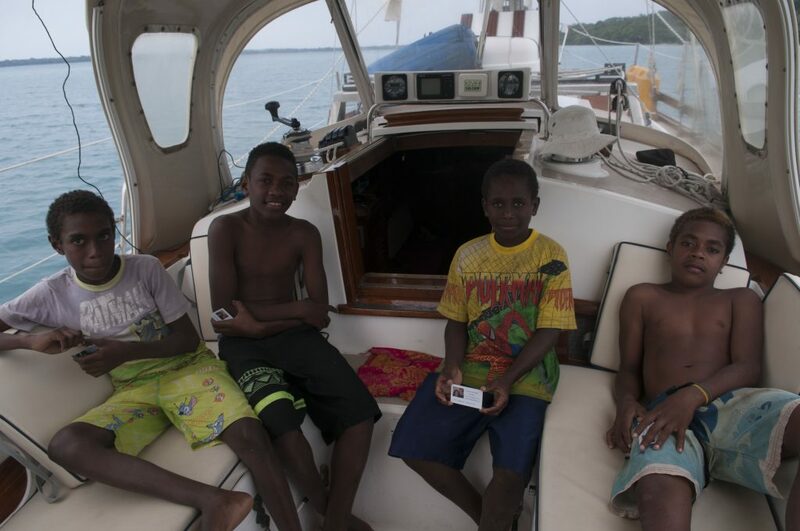 As they had not had a taste of a cold beer since their arrival in Uliveo we invited them on board for Happy Hour. We were also craving some socialization as so far other cruising boats have been scarce. As we had arrived on a Friday we were quickly invited to the Sunday Presbyterian church service. We arrived at Tom’s house at 10:00 for the 10:30 service. Tom took one look at us and suggested that Denny borrow one of his collared shirts and that I borrow one of his wife Esther’s ‘Island dresses’. The church service had the usual local vibrant optimism and unabashed singing and at the end of the service they welcomed us to their village, said a prayer for our safe journey and then asked us to lead the exit procession so that we could give a hand shake to all attendees and receive many a ‘God be with you’ remark. 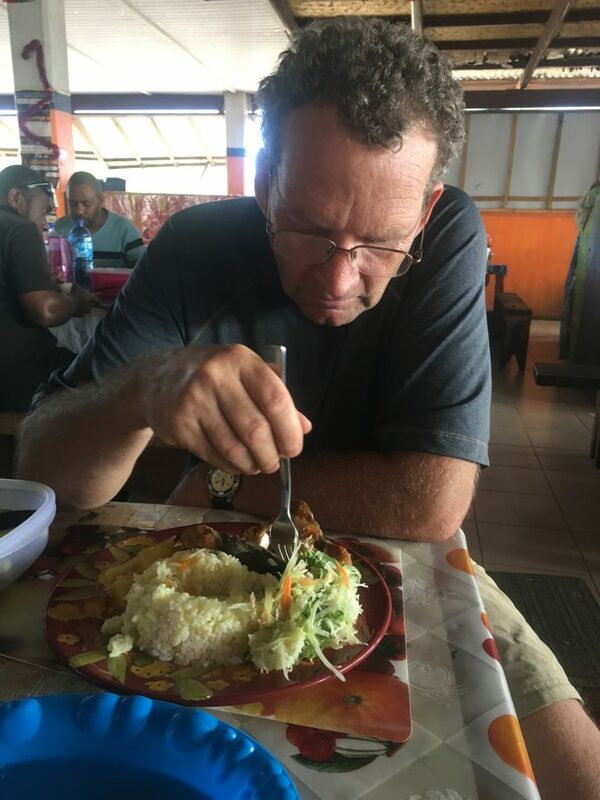 Tom and Esther invited us to share a Sunday meal with their family and it was the first time we ate the local Lap-lap, Vanuatu’s national dish. Sharing Sunday dinner with Tom and family. Still wearing Island Dress. I was actually enjoying it! 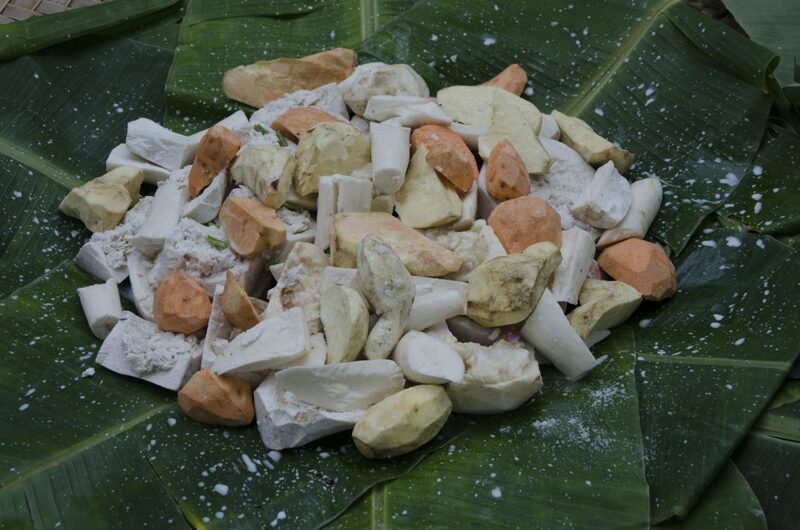 It was made by grating manioc, smothered in coconut cream, wrapped in banana leaves and then cooked in a ground oven of hot stones. It wasn’t Denny’s favorite but the second time we were invited for a Lap-lap meal and chicken was added it was actually pretty ‘tasty’! We had several meals with Tom’s family and also invited them back to our boat for dinner. I am not sure if the meal was a hit but the cake sure was. Tom invited to go fishing in his brother in-law Philippe’s power boat for a fishing excursion. All we had to do was bring our own fishing lines, lures and supply the gas. They weren’t too impressed with our lures, too BIG! Most of the fishing was done inside the reef and the tuna they were catching were no more than a foot long. Fish was actually scarce and we were told that they used to export 40 large bins of fish per week to the markets in the larger islands. Now they can only fill up about 25 bins and that is slowly diminishing. They were actually contemplating putting a stop to all netting. 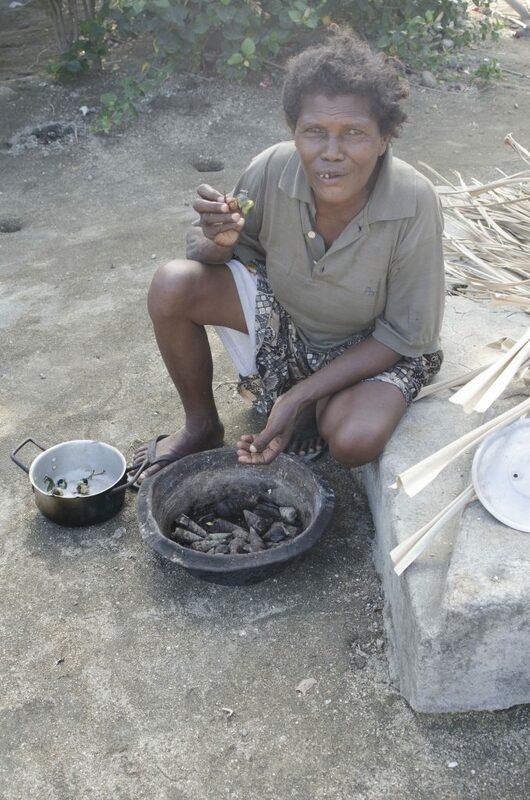 difficult to do if fish is one of the main income source for the small islands in the Maskelynes. It was a great way to see the outer islands although we hit some very hard rain and wind on our return trip making it a miserable ride home. We didn’t catch any fish with our lures. We did do some snorkeling as there were Dugong here. 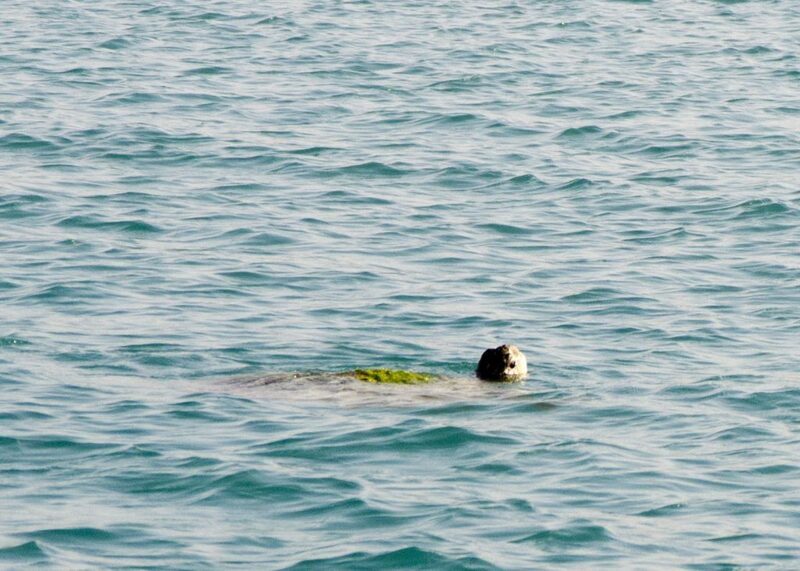 And I finally saw several Dugong although not with a camera. We stayed at this anchorage for 10 days so that we could partake in the annual Canoe Race festival. This was a 2 day celebration which included lunch and dinner, watching the local canoe races and even participating in the tourist canoe race, which I won (thanks strong big arms)! 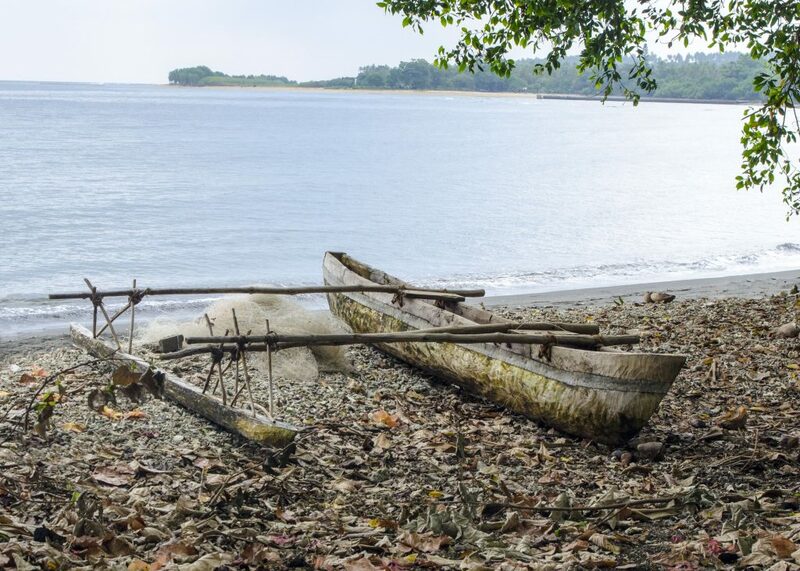 The festival took place on the North side of the island with a beautiful backdrop of the mountains of Malekula and colorful canoes scattered on the beach and ready for the races. 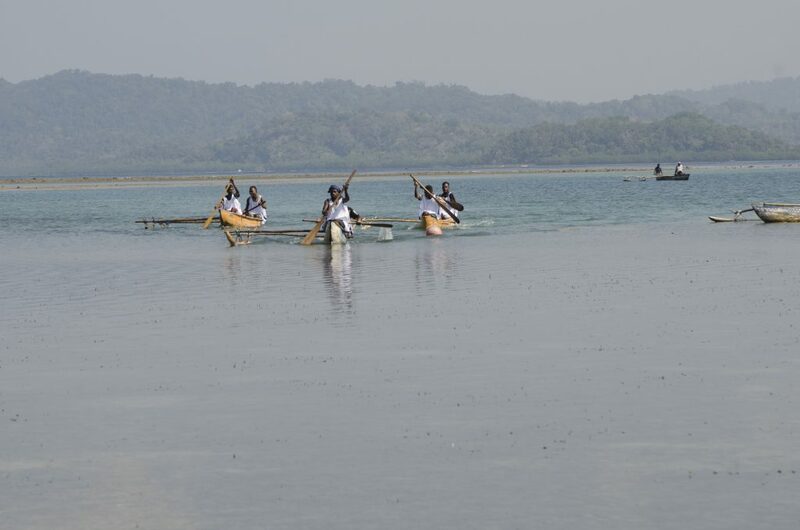 The day was filled with a range of canoe races which included different age groups, ladies and men but never mixed as that was Tabu, and mother daughter races. 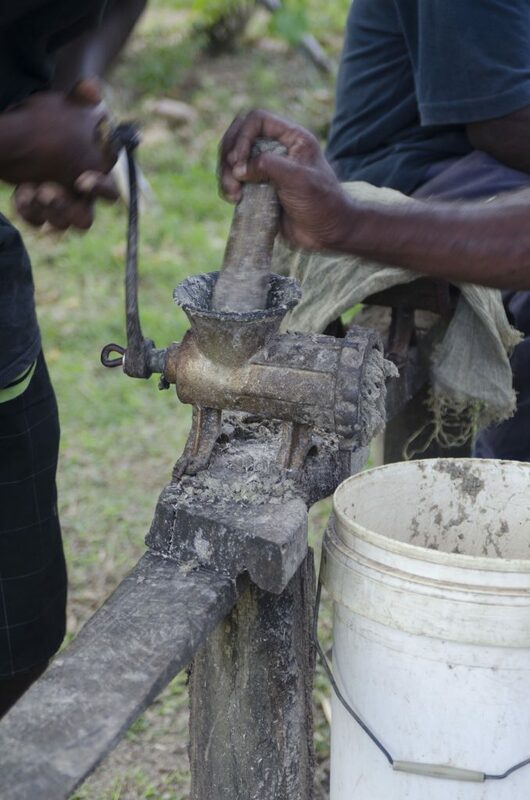 There was a Kava making demonstration which was basically peeling the Pepper plant root and grinding it using an old fashioned meat grinder into a small bag which would be submerged in a bucket of water and water squeezed through the bag to seep the drug out of the ground root. This process was repeated 3 times and then we were all offered a cup to gulp down. I could feel tongue and lip numbing for about 10 minutes but nothing after that. It was suggested that we drink about 4-5 cups to have the pleasant, happy, relaxing feeling. They named the kava ‘Morning Fresh’ as no matter how much you drank you would wake up morning fresh. We found that hard to believe. First cup was free but after that we had to pay. We were good with just a taste as the sloppy, grey dishwater kava drink wasn’t all that appealing. 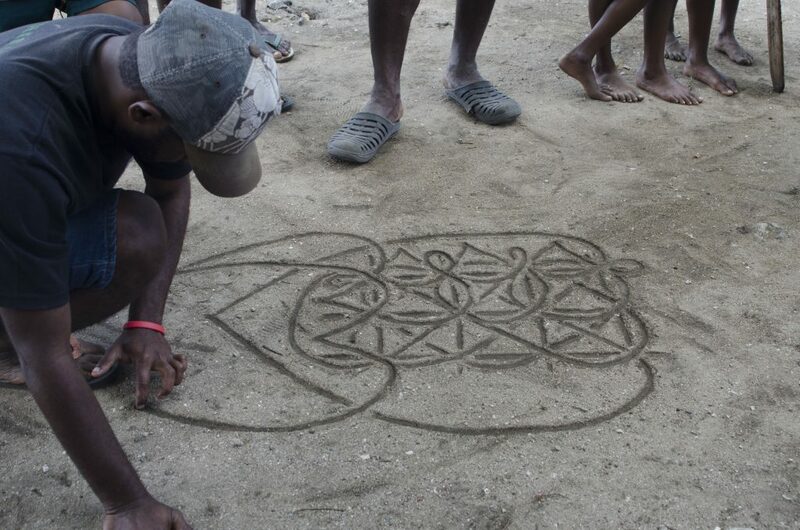 There was a sand drawing demonstration which I had also seen at the National museum in Port Vila. We were asked to pick a specific animal, plant bird and then the sand drawer would make the elaborate drawing all in one smooth flow, never lifting his finger until the picture had been completed. Pretty impressive! 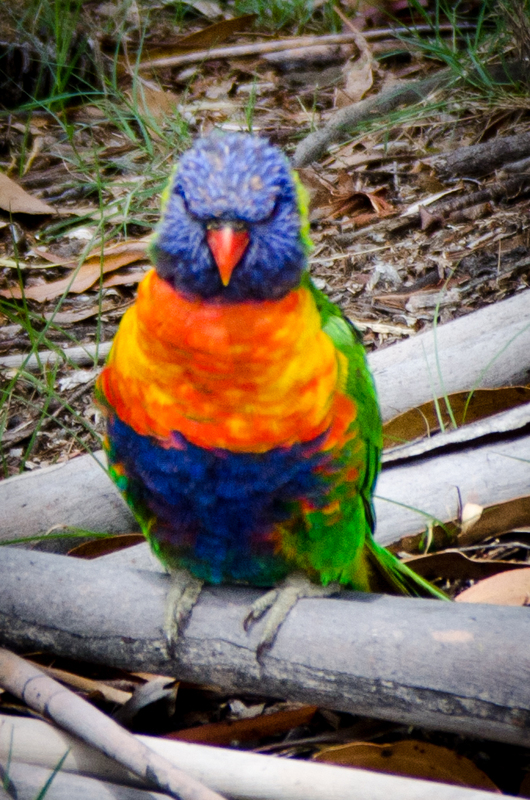 As if all the colour of costumes and surroundings wasn’t enough, they introduced us to their local birds which I had had rare glimpses of and now could look at up close. She made a fan for me! 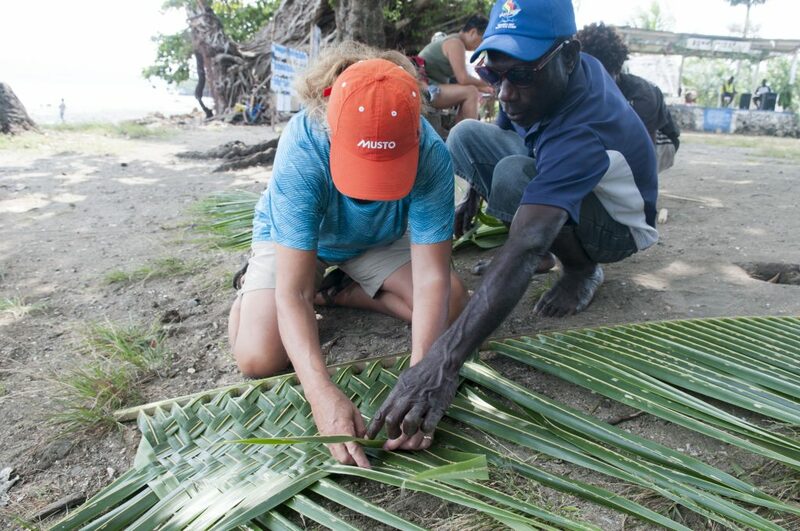 We were given a basket weaving demonstration and shown how the coconut leaves were used to make the walls for their huts, fans, carrying baskets used to carry the vegetables gathered from their farms and throwaway plates and garbage collection baskets. 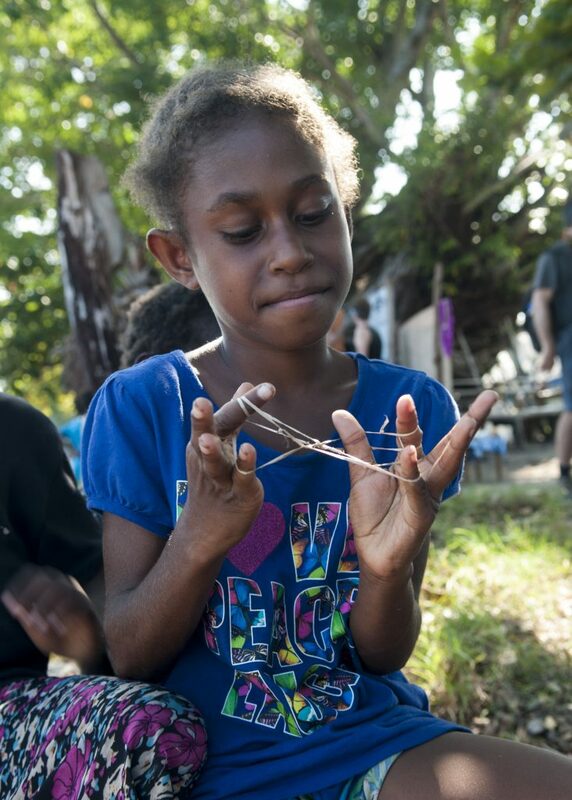 They made all this stuff with such ease and it is great knowledge to have considering plastic has now been banned in Vanuatu. Bringing in food by dugout. The island is to small so much of the growing is done on the neighboring island. 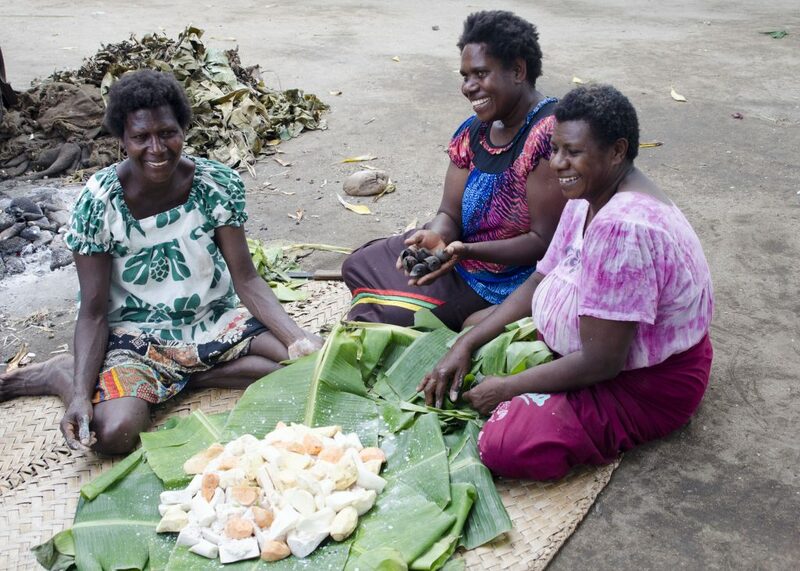 The ‘Mamas’ gave us a traditional food making demonstration which included Lap-lap and Bunia (which stands for baked solid food and meat). The main difference between the two being the meat which is included in the Bunia. The meals that the mamas prepared for us was very tasty. 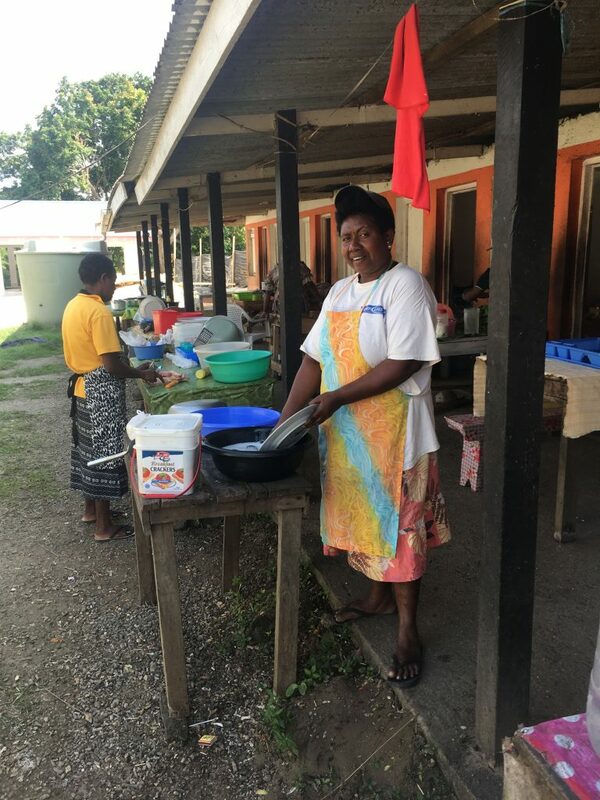 It included a buffet of shell fish marinated in lemon juice, deep fried taro patties, kumara chips, rice, curried fish and grilled fish and we served ourselves using ‘Island paper plates’ (a stack of 2-3 large leaves cupped in your hands to hold great quantities of food). 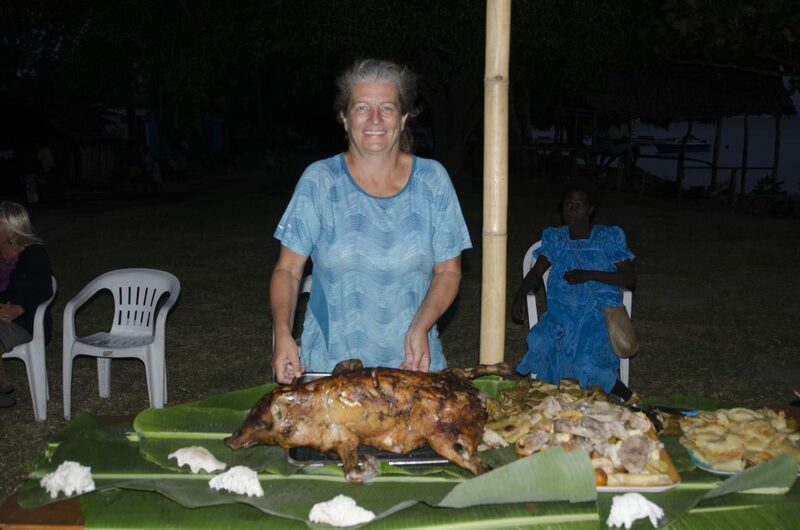 For the final meal they even roasted a piglet over hot coals. 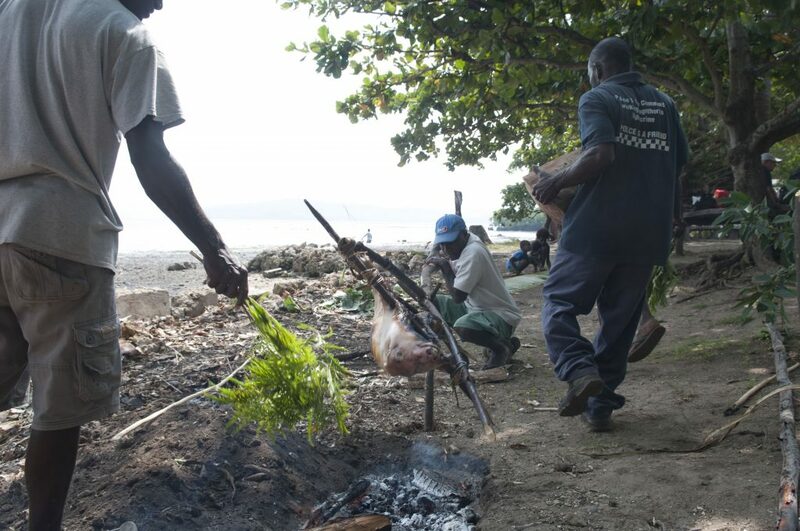 The roasting was well tended by several men that continually fanned the meat with fragrant leaves and one man manually turned the piglet on the spit as required. 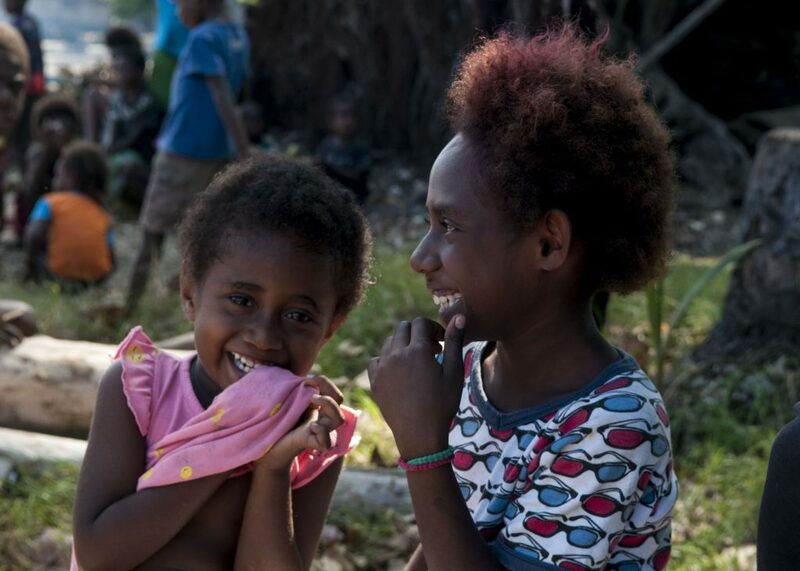 The children were a constant source of entertainment with their beautiful smiles all eager to watch the races and play their simple old fashioned string games. 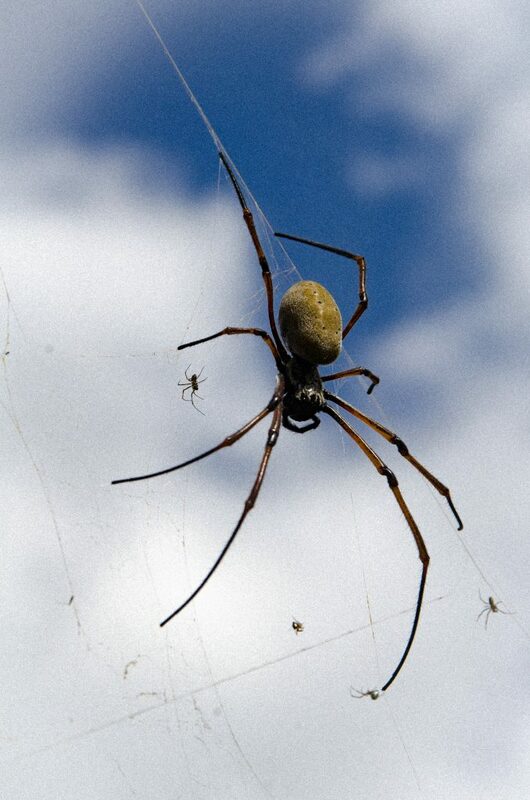 They would come in pairs and show you what symbols they could create with 10 fingers, a long string and little help. The closing ceremonies included Kastom dancing and singing. This required some pretty elaborate face painting and costume preparation all from local materials. 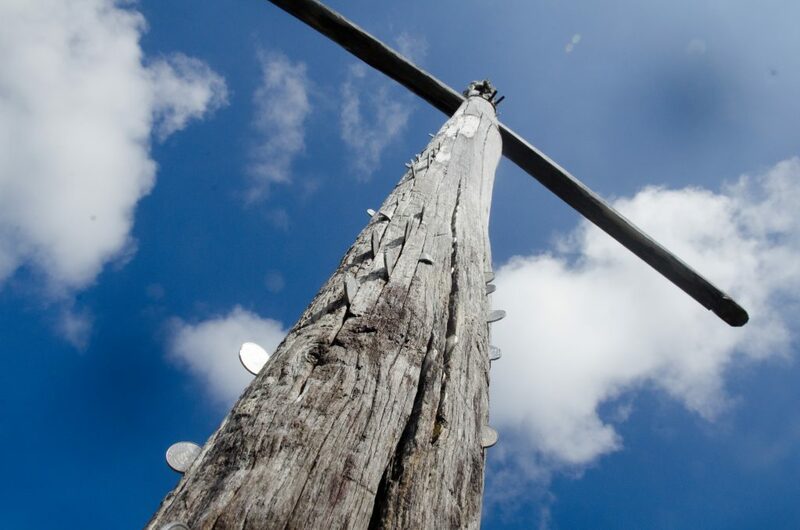 life here is much simpler but it is changing and the future is not always the brightest. It was great to be sailing again. 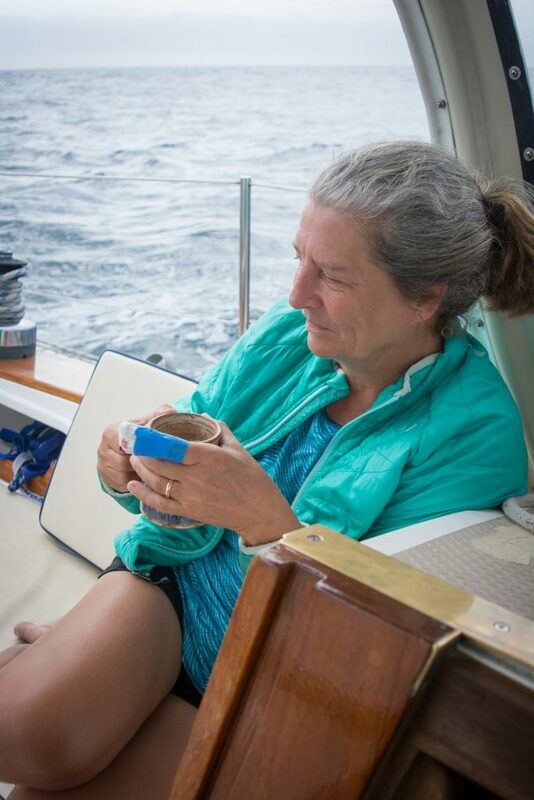 We left Efate with a beautiful 15 knot wind on the beam, music playing on our little portable Bose speakers and the occasional dolphin jumping ( which only Denny witnessed). Instead of doing a straight overnite to Epi we decided to stop in on Mangita Island. 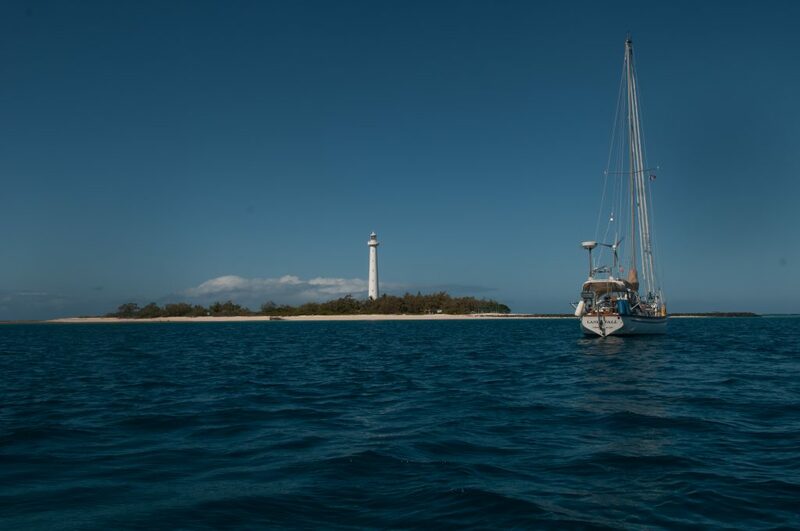 We arrived in the afternoon and the wind was slowly accelerating so it was nice to drop anchor after a careful search for a spot that had no large coral reef outcrops or ‘Bommies’. Soon after we dropped anchor we saw some locals coming towards us paddling (not rowing but paddling) a 14 foot aluminum boat. 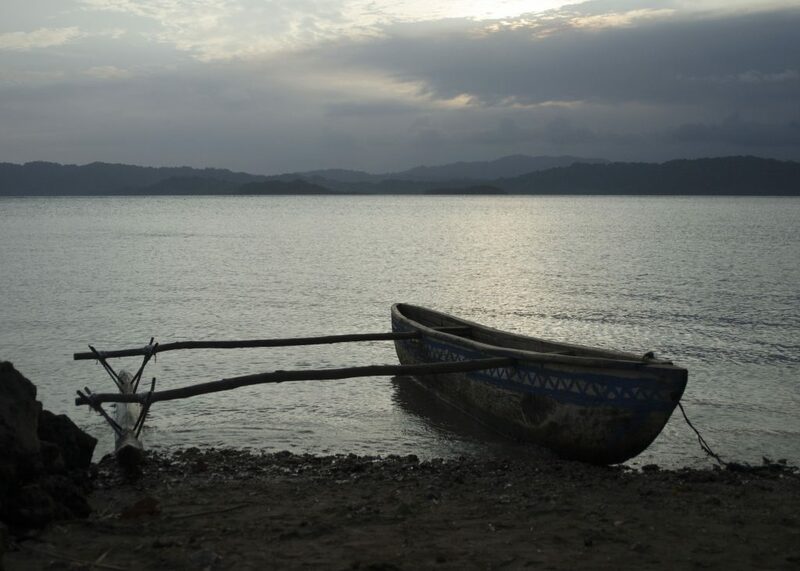 Ironic how the traditional mode of water travel on this island had gone from paddling dugout canoes to driving aluminum power boats back to paddling but using the aluminum boats. Is that progress ? The wind was strong and it looked like the paddlers were really struggling so we set out to blow up the dinghy in case they needed to be rescued. By the time we had the dinghy ready to go they had made it to the boat. They greeted us with a ‘Hello brother and sister’ and started dumping field corn, coconuts, grapefruits and cucumbers in the cockpit. It wasn’t a welcome gift, they were asking for a donation, a mere $30 to fund their local student soccer team. Hard to not give some money when your cockpit is littered with local produce. They also volunteered (for a negotiated fee based on the catch) to take Denny for a night dive for some fresh crustaceans for our dinner. We also had to supply the transportation and batteries for their torches. It was a fine feast of a variety of shell fish but we both agreed we would not do it again. 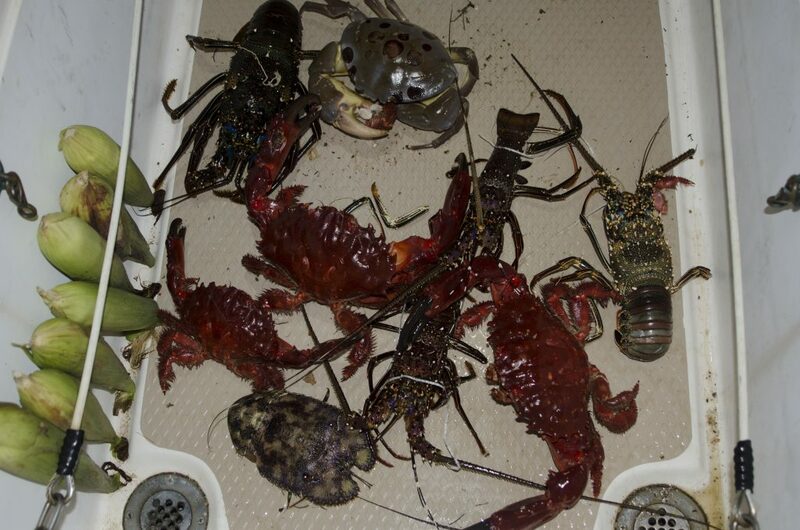 The amount of meat obtained was not worth the effort of killing these beautiful colorful creatures, most of which had been speared by a spear gun. We spent an extra day here but had no luck getting to shore because of the gusty wind and the reef surrounding the beach. It was time to sail onward to Epi in search for the elusive Dugong or Sea Cows. We had a little trouble pulling up the anchor as a part on the windlass suddenly broke. The workaround until we can get the extra part requires me to go down below and keep tension on the chain while Denny uses the windlass. I can tell you it isn’t much fun when there is 200 feet of chain out. A little nerving for Denny too when the anchor is free and he has to make a mad dash back to the cockpit to keep the boat from drifting to shore. The sail to Epi was pretty uneventful, a wonderful 15 knot breeze on the rear quarter. The anchorage in Epi was a large open bay so it had lots of swell and roll. It was bad enough that we had to throw out a stern anchor to keep us from being a beam to the waves and thus rolling with every wave. Three days in Epi but and no Dugong but lots of turtles. 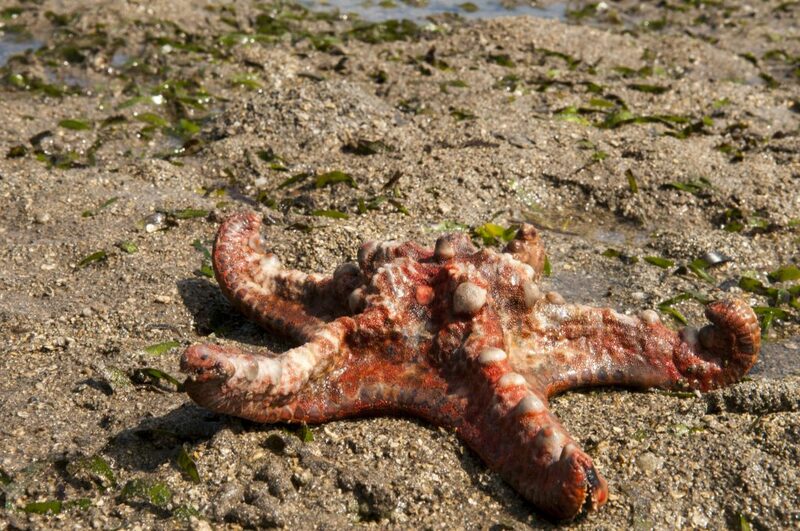 Every local that we talked to gave us a different location as to where we may find the elusive sea creature. But we did enjoy finally being immersed into somewhat more of the traditional way of life. 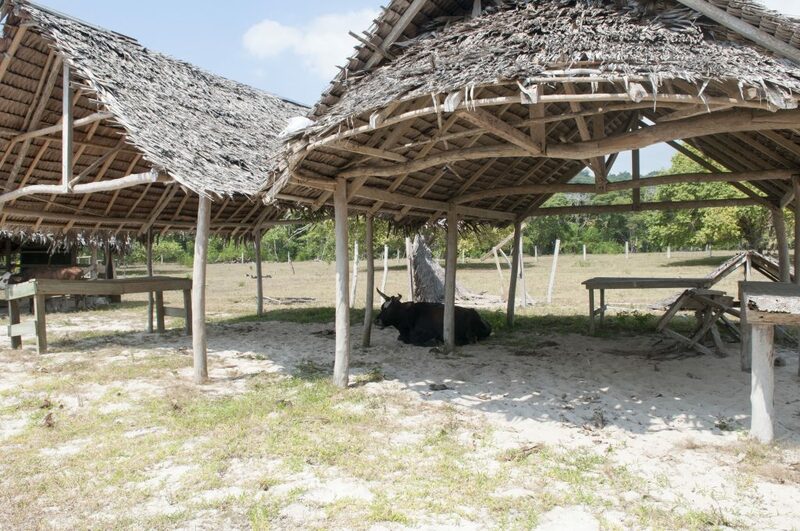 People used dugout canoes and lived in the simple thatched huts and everyone had a garden, chickens and an occasional cow. They fished with nets and hook and line but it seemed the fish were scarce. Despite the day to day existence it seemed like everyone had cellphones and there seemed to be cell phone towers everywhere. There were also quite a few large trucks for the few miles of road. Walking was not a favorite past time as truck cabs were filled with paying passengers going short distances. 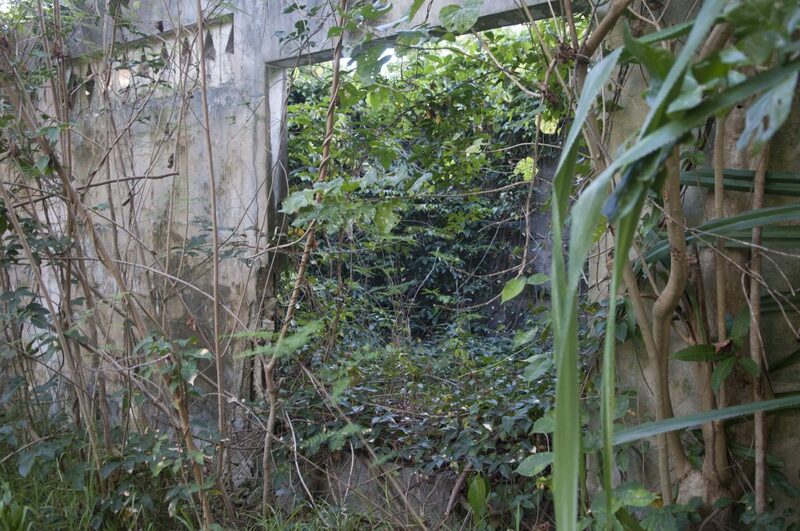 There was a Medical Health centre here but only staffed by nurses that made the decision whether you needed to be helicoptered out to Port Vila. 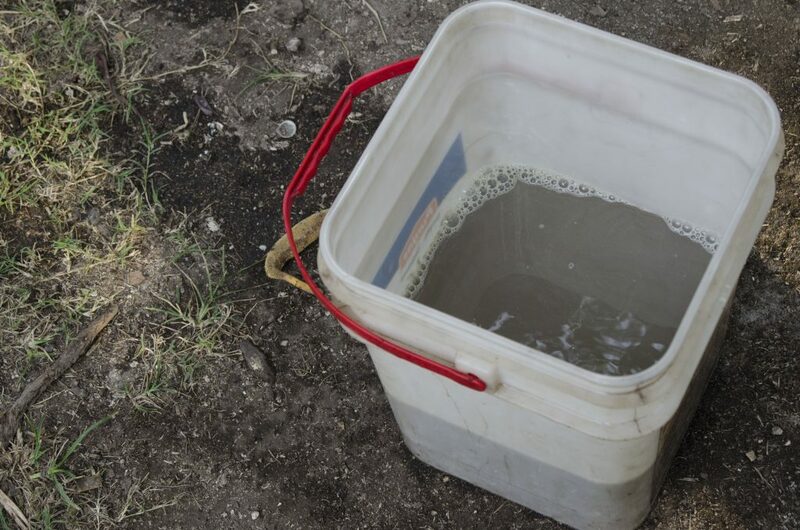 There were signs warning people about Malaria and everyone had been given a mosquito tent for sleeping but we were told it isn’t an issue until the rainy season when there is a lot of standing water. 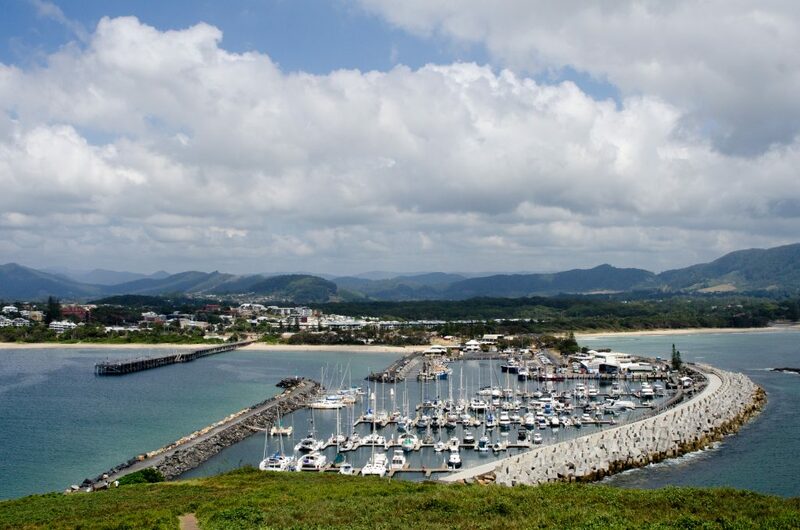 Our next stop would be a day sail to the Maskelyn Islands. 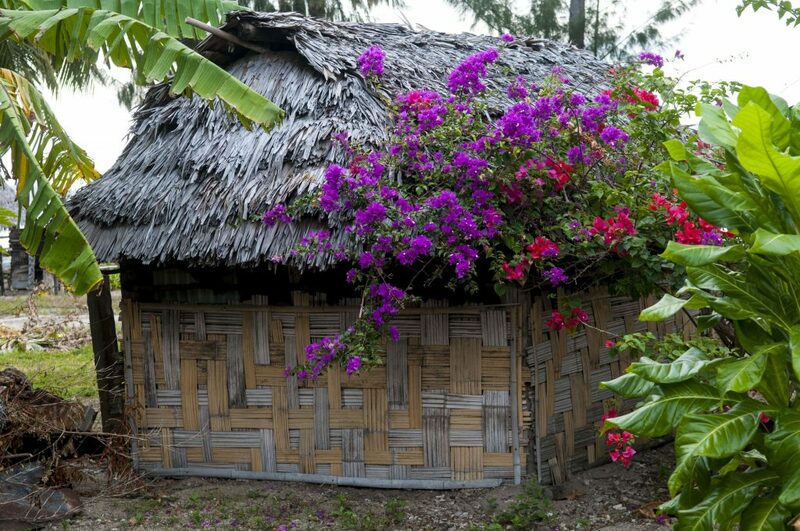 Hand tools, coconut trees and local knowledge and you have a home! A good day for washing. 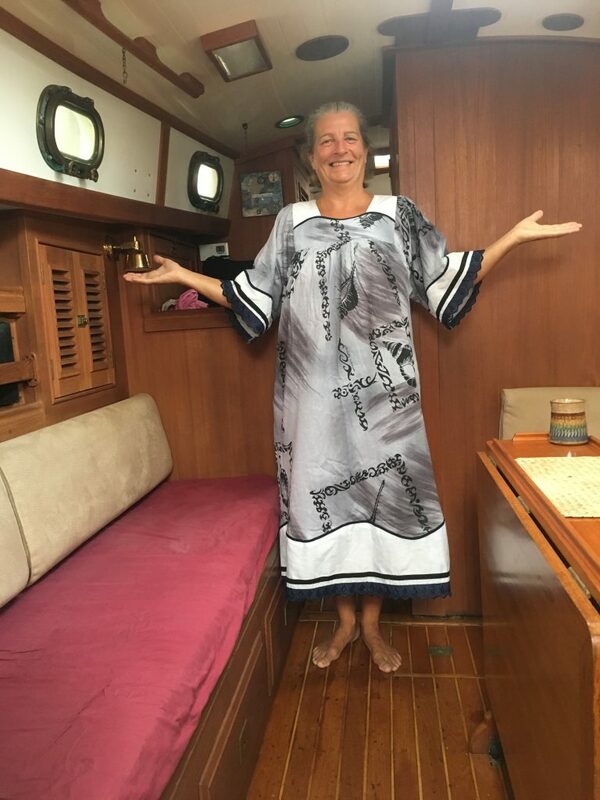 Traditional ‘Island’ dress! 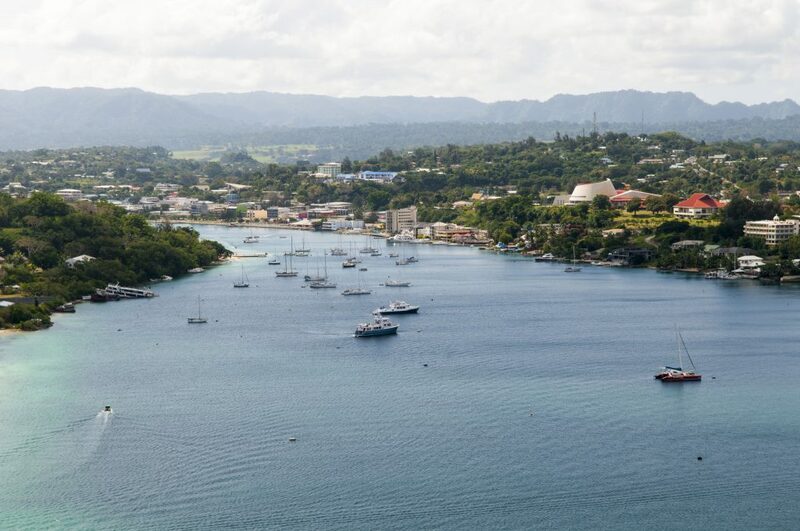 Port Vila was home for Landfall for almost a month. Shortly after arriving in Port Vila Denny had to fly back to Minneapolis to attend his mothers funeral. 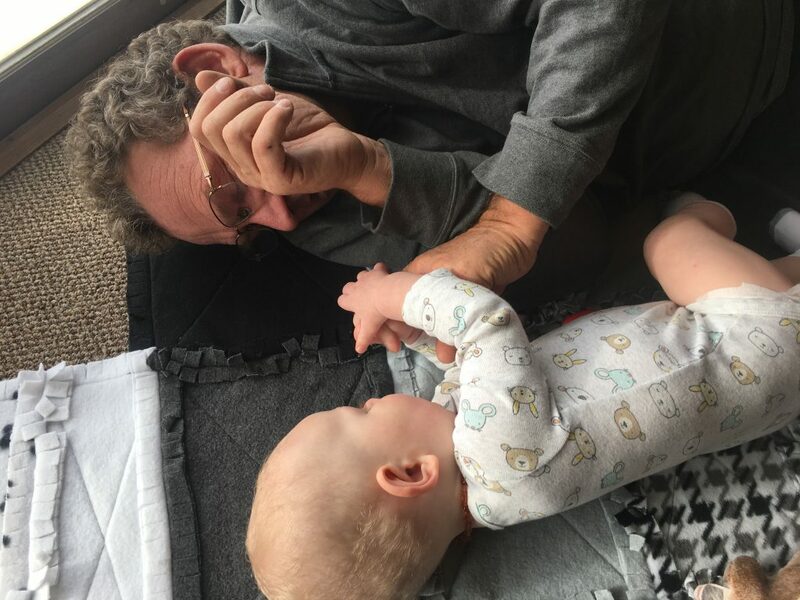 We basically grabbed a mooring, made some flight arrangements and the next morning he was on a grueling 51 hour flight which included a couple layovers. We find it hard being so far from home when things happen so we do our best to get back just as soon as we can. Alzheimer’s had taken her years ago and this was the final chapter. She was the easiest going person and was always supportive even in doing something as bizarre as sailing around the world. She will be truly missed. I stayed behind as we weren’t quite comfortable about leaving the boat unattended. It was a great mooring! So for my two weeks alone I did the usual passage clean up which consisted of cleaning the build up of salt inside and outside the boat. It wasn’t all work. 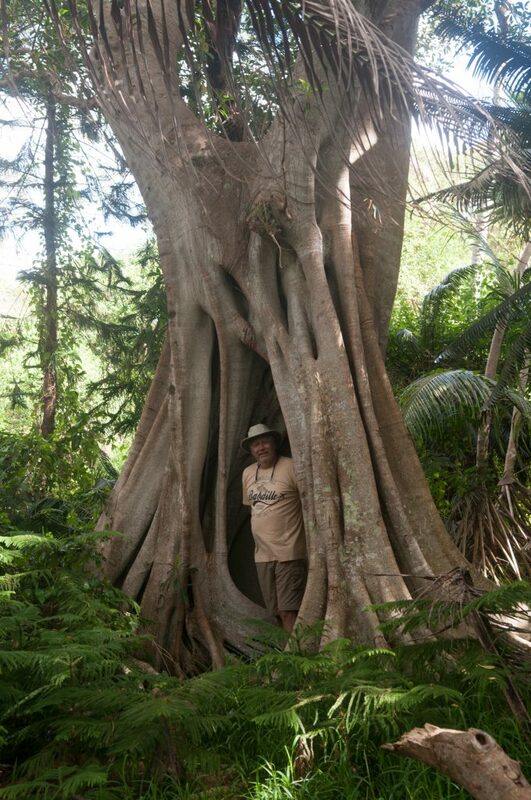 I did explore Port Vila and enjoyed a few nights out with people we had previously met in Whangarei. My favorite was probably the Stone Grill restaurant where a hunk of beef was served on a lava stone heated to 400C and I basically cooked my own strips of meat while eating it. Vanuatu beef is superb! During my walkabouts in Port Vila I noticed that a lot of vehicles driving around the main street were flying flags of different countries such as Germany, Brazil and France. I came to the realization that it was the flags of countries playing in the World Soccer games. 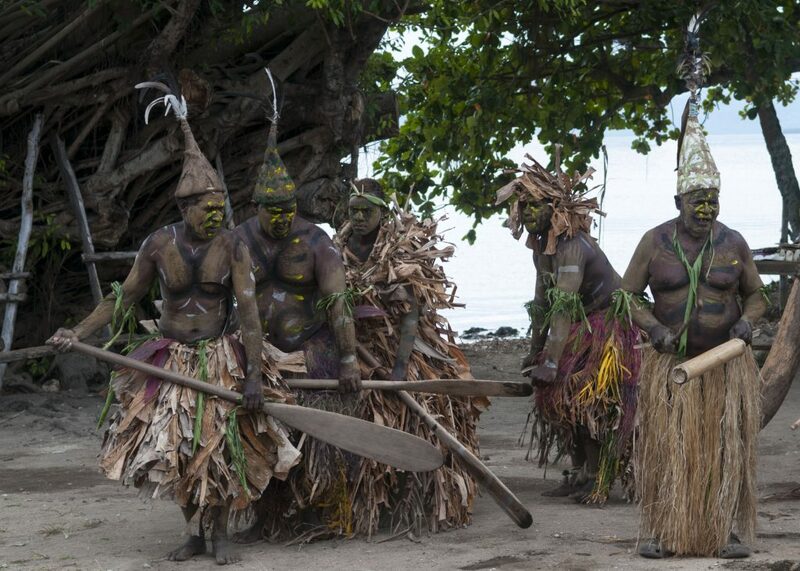 The people in Vanuatu were huge soccer fans and would watch the games on a big screen in the open air. The hollering and screaming could be heard on the boat at ungodly hours as they watched the games streaming live until 4 am in the morning. Denny was back after a whirlwind two week trip and we prepared for our cruising around Vanuatu. First stop, the markets for provisioning. 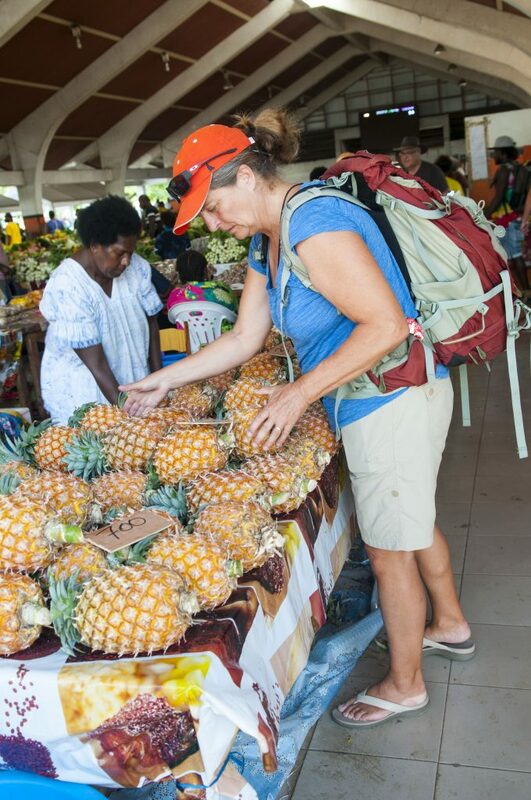 We both love the local markets as it is a way to learn about local customs and foods. 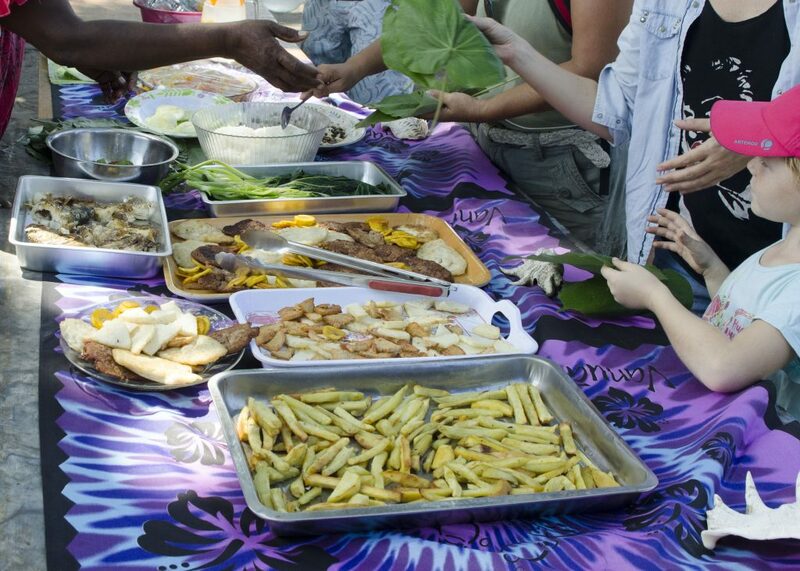 The vegetables of the day included eggplant, bock choy, cucumbers, green beans and variety of herbs. And then there were pineapples, mandarins, raspberries, bananas and pamplemousse (pomelo grapefruit). 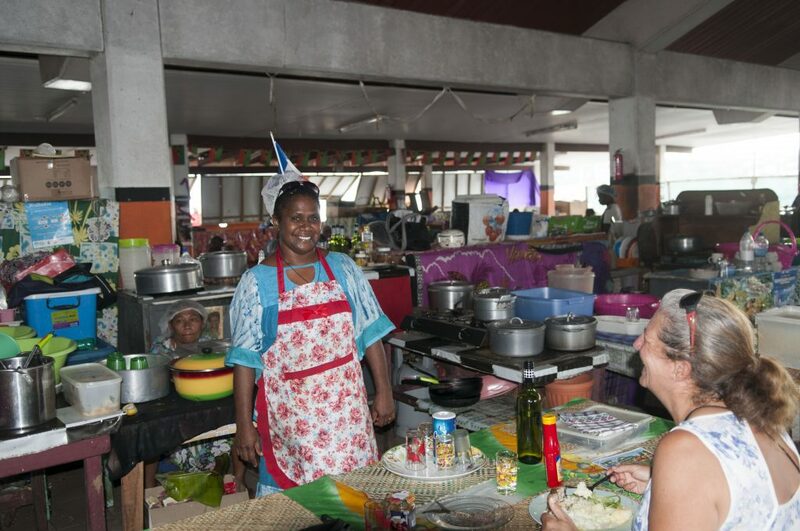 The market provided an epiphany of colors and the vendors, mostly the “Mamas”, as they are called here in Vanuatu, were all nicely dressed in their “Island dresses”. We enjoyed a couple of meals at the market and for $4.50 US we got a plateful of meat, veggies and rice plus some entertaining conversation with the “Chef”. Not upscale eating but definitely local cuisine at it’s finest. Flying her soccer team colors on her head. Will France win? Great company, great food. Can’t figure out what the vegetable of the day is?? 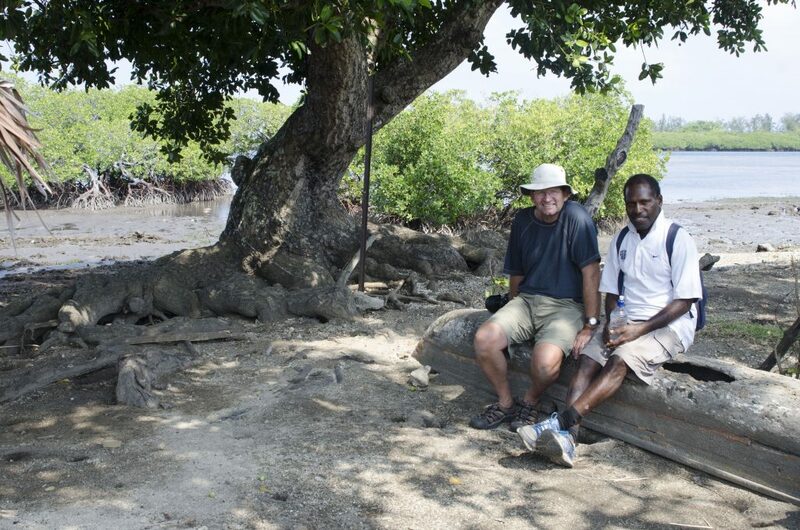 Before departing Efate we anchored in Esema Bay for some quiet, relaxing time. It turned out to be NOT so quiet with all the local boats roaring by. But early in the morning the huge turtles would make an appearance before the hustle and bustle began. 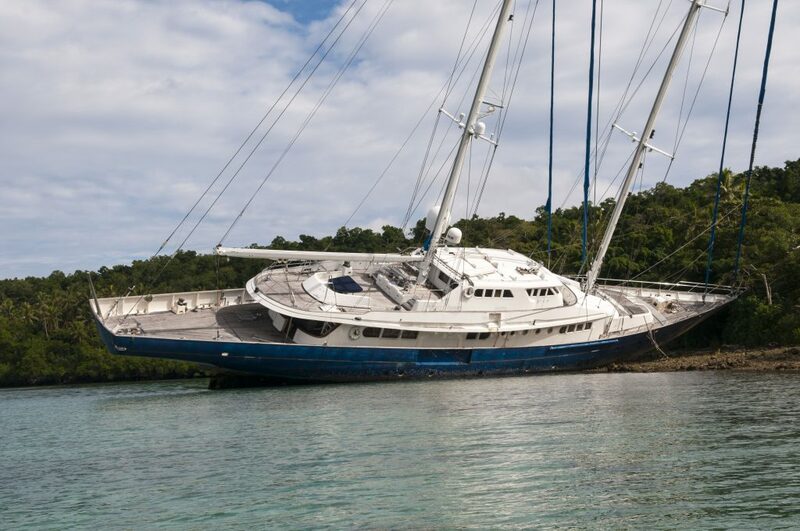 On the other side of the bay a beautiful 150 feet yacht “Blue Gold” was beached on the reef when cyclone “Pam” passed by Vanuatu, March of 2015. Denny of course had to climb on board and he found everything as it was when it dragged onto the reef. There were clothes, hand held VHF radios, reading glasses and a galley full of stuff. It was as if it had just happened yesterday. Denny found it kind of eerie. Shortly after he climbed on board he was joined by a local guide who was probably there to insure that things remained untouched. Upon doing some research I found out that the nearby villages of Sunae and Moso had written to the Government to have the yacht removed. Apparently the removal of the shipwreck is the responsibility of the owner who was arrested in Switzerland, brought to Netherlands for trial and was convicted on bankruptcy fraud. An on going saga with not much hope for a timely resolution.